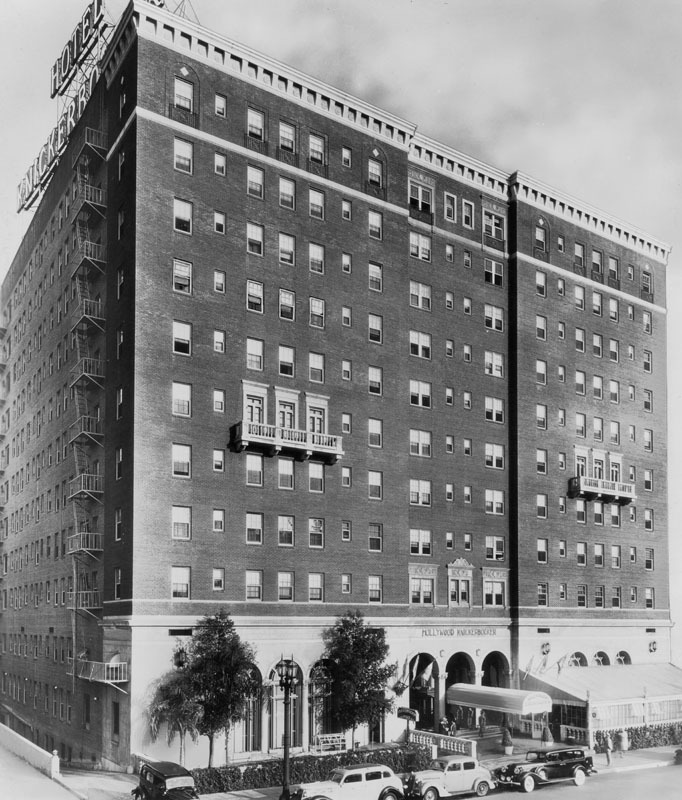 (1938)* - View of the Hollywood Knickerbocker Apartment Hotel, located on the east side of Ivar Avenue north of Hollywood Boulevard. 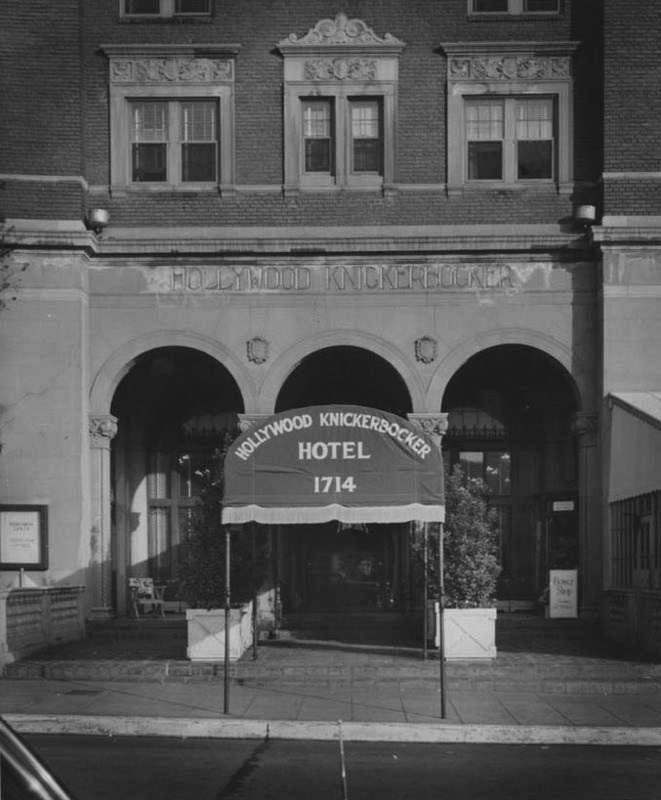 (1946)^*# – View showing the front entrance to the Hollywood Knickerbocker Hotel located at 1714 Ivar Avenue. 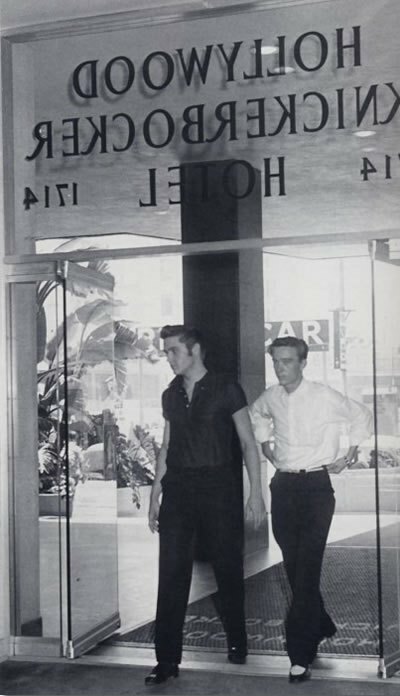 (1956)**^ - An Elvis sighting at the Hollywood Knickerbocker Hotel. (ca. 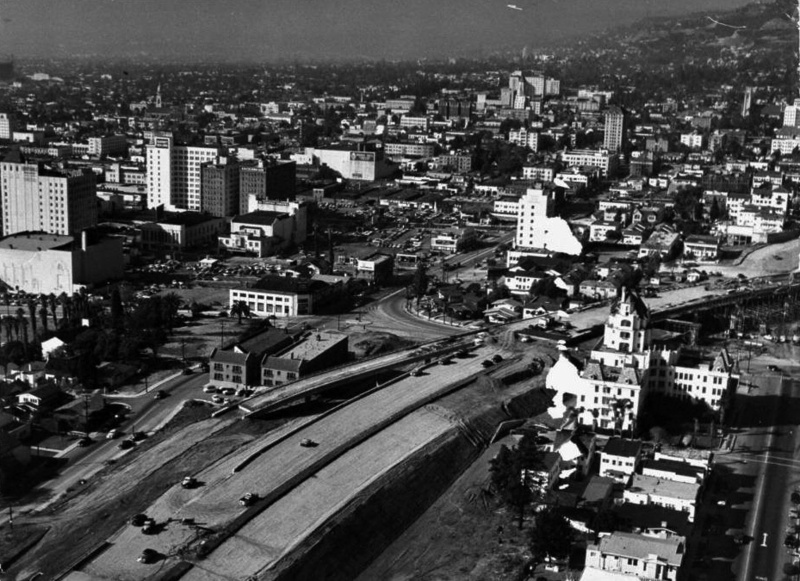 1950s)#*## - View looking south on Vine Street as seen from the Hollywood Freeway. Spotlights illuminate the sky wih beams of light. From left to right are the: Capitol Records Building, The Broadway-Hollywood Building, and the Hotel Knickerbocker. (ca. 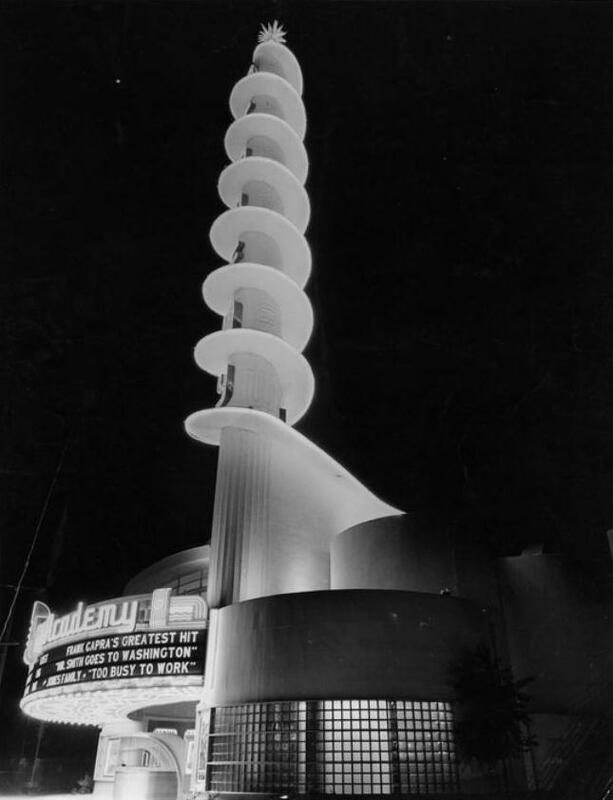 1938)* - A photographic postcard showing the Earl Carroll Theater, located at 6230 Sunset Boulevard, as seen from across the street at night. Earl Carroll Theatre was the name of two important theaters owned by Broadway impresario and showman Earl Carroll. One was located on Broadway in New York City and the other on Sunset Blvd in Hollywood. (ca. 1938)**^# - View showing the Earl Carroll Theater revolving stage under construction. What appears to be Earl Carroll is reviewing plans with designers and others while the chorus line girls position themselves on the yet to be completed revolving stage. 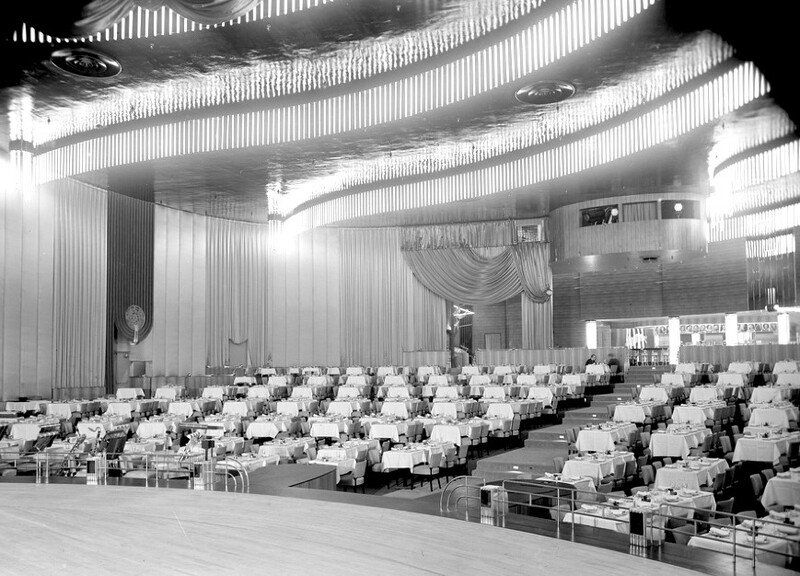 (n.d.)##** – Interior view of the Earl Carroll Theater as seen from the revolving stage. (ca. 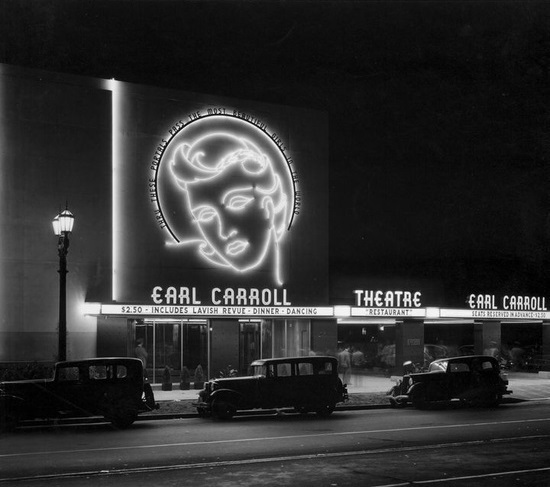 1939)***# - View of the front of the Earl Caroll Theatre with a woman's face in neon outline above the entrance. 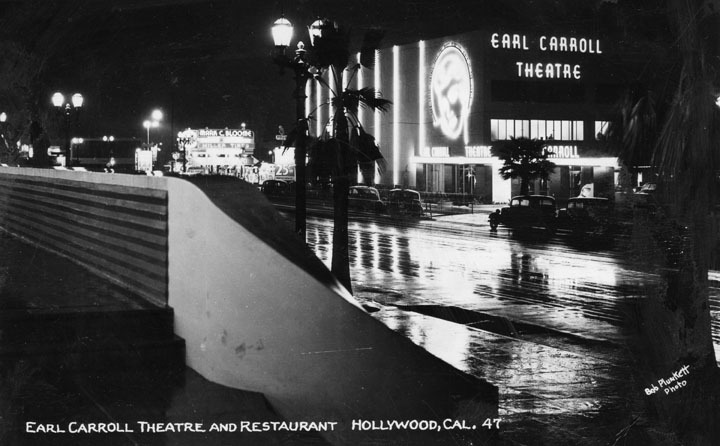 The Earl Carroll Theatre's facade was adorned by what at the time was one of Hollywood's most famous landmarks: a 20-foot high neon head portrait of entertainer Beryl Wallace, one of Earl Carroll's "most beautiful girls in the world," who became his devoted companion. The sign had long since vanished by the 1960s, but a re-creation made from photos is today on display at Universal City Walk, at Universal City, as part of the collection of historic neon signs from the Museum of Neon Art. (ca. 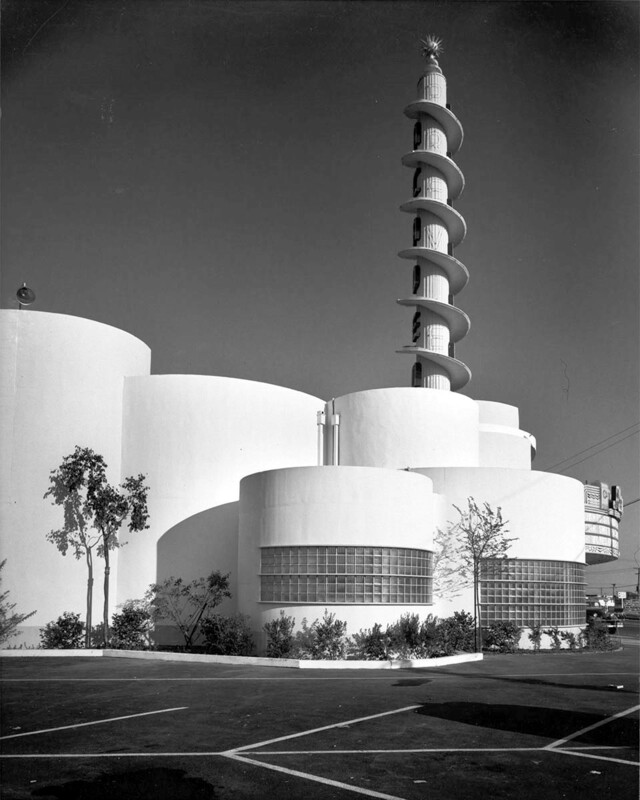 1940)* - Exterior view of the Earl Carroll Theatre, located at 6230 Sunset Boulevard in Hollywood. Plaques affixed to the building reveal signatures from some of the top performers of the day; from left to right, Edward G. Robinson, Miriam Hopkins, Jean Hersholt, Binnie Barnes, Charles Laughton, Elsa Lanchester, Bob Hope, Nelson Eddy, Ginger Rogers, and Mickey Rooney. 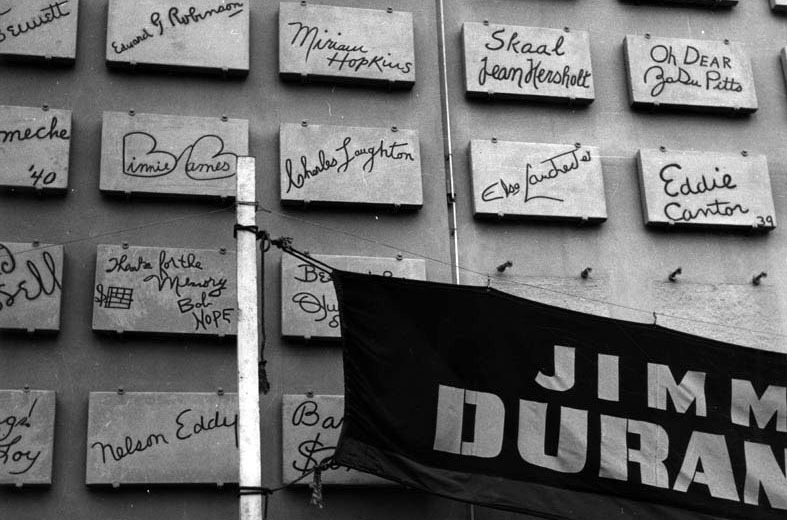 A banner on which most of Jimmy Durante's name is visible hangs a foot or so away from the building. (ca. 1930s)* - Architectural drawing showing a wedding cake type of tower with FOX in large vertical letters near the top. On the marquee around and above the movie theater entrance below are the letters: Fox Westwood Village - gala premiere - Friday Oct. 19 - stars-lights-excitement! (ca. 1938)* - Fox Theater is in the center of the picture, FOX clearly visible at the top of the building, and streamers of flags hanging from mid-high on the building down to the bop of the marquee. Advertised on the marquee is the movie My lucky star with Sonja Henie, R. Greene. On the right in the picture is the Bruin Theater. (1951)* - Nighttime view of the Fox Westwood Village Theater (later renamed the Mann Village Theater). Crowds of people stand at the front of the theater to attend a premiere. (1949)**^ - View looking northwest down Broxton Avenue. 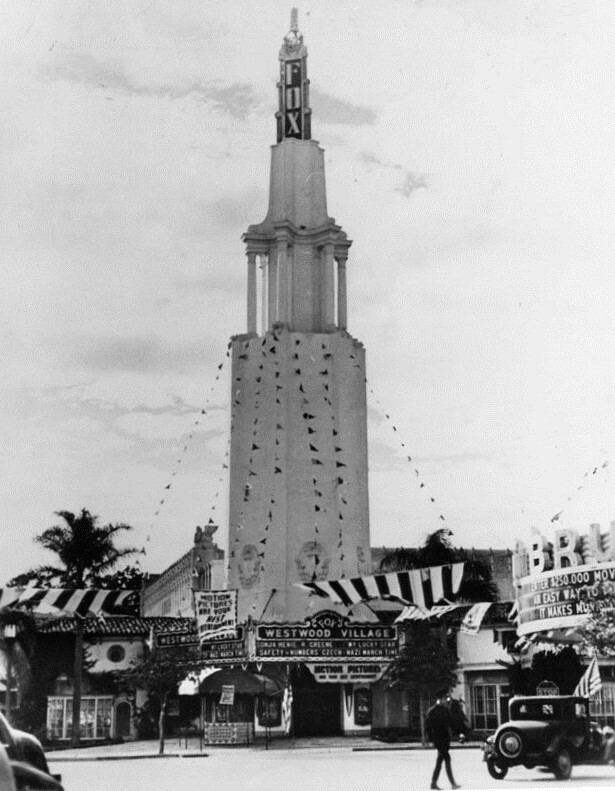 The Fox Theater tower stands in line with the tall palm trees along the center median of Broxton. The towers of the Sears and Bank of America buildings can also be seen. (ca. 1930s)^^#* - Postcard view showing the Pico Drive-In movie theater, with a woman standing on the corner at the intersection of West Pico Boulevard and Westwood Boulevard. 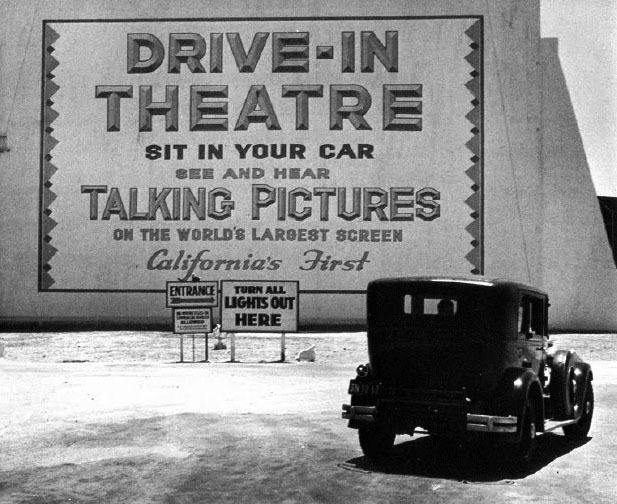 The writing on the drive-in signs read "Drive-in theatre sit in your car see and hear talking pictures on the world's largest screen - California's first" "turn all lights out here" and "drive-in theater admission prices adults $.35 per person." The Pico Drive-In Theatre was the first theatre of its kind built in the Western United States. 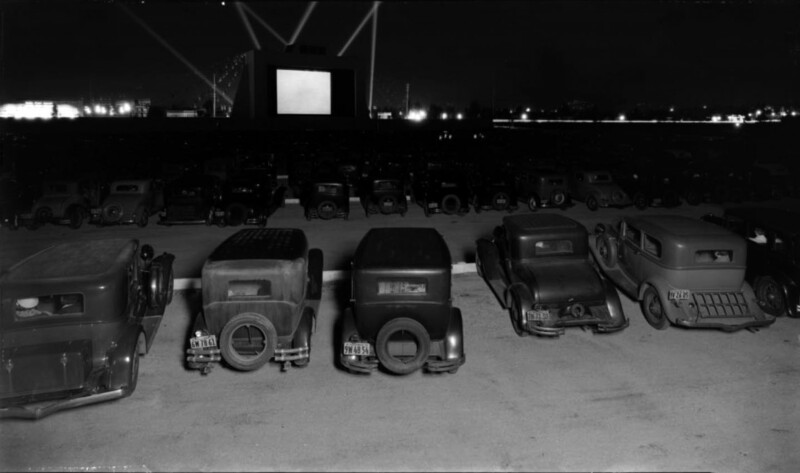 It was constructed in 1934 just one year after the first drive-in was opened in Camden, New Jersey (Hollingshead Drive-In). 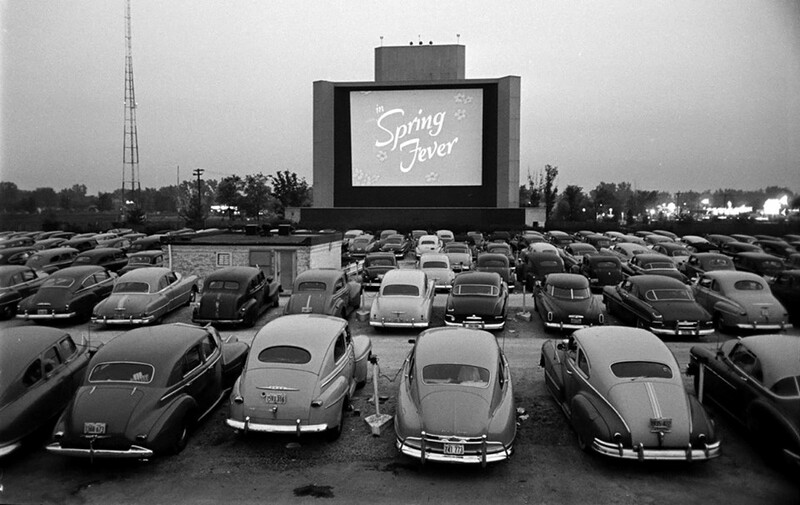 In 1934, when it first opened, the name was simply Drive-In Theatre. The name was changed to Pacific and later Pico Drive-In Theatre since more drive-ins were sprouting up. 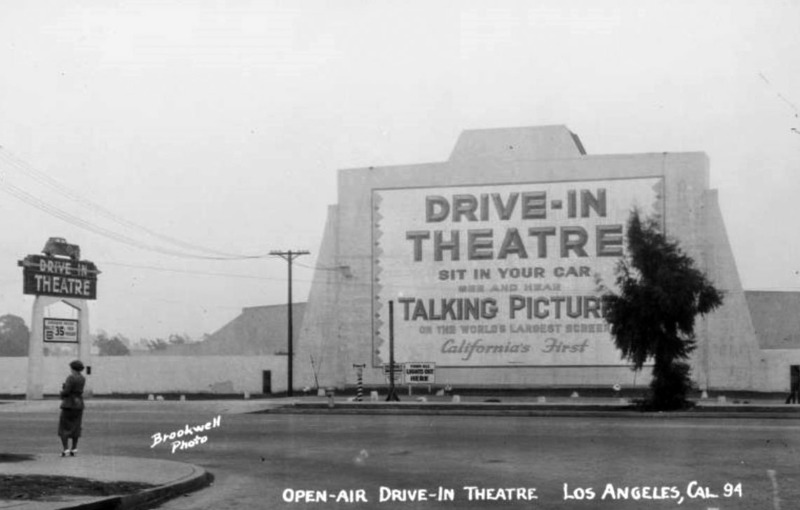 (1930s)***# - Close-up view showing the front of the Pico Drive-In Theater near the intersection of Westwood and Pico Boulevards. (1938)* - View inside the Pico Drive-In Theater with its over-sized speakers. 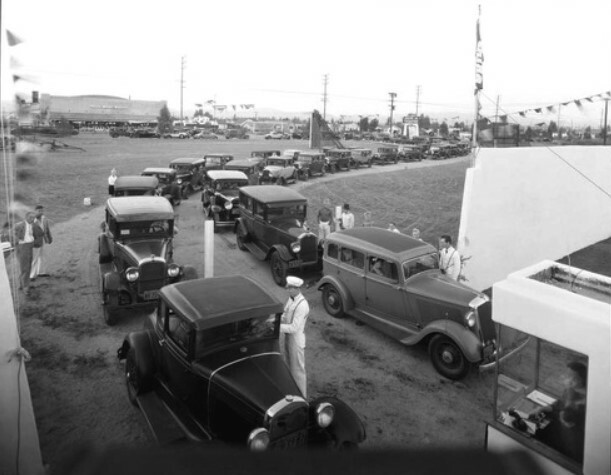 (1934)^^#* - A slightly raised view of two long lines of automobiles waiting to get in to the first drive-in theater in Los Angeles at 10860 West Pico. 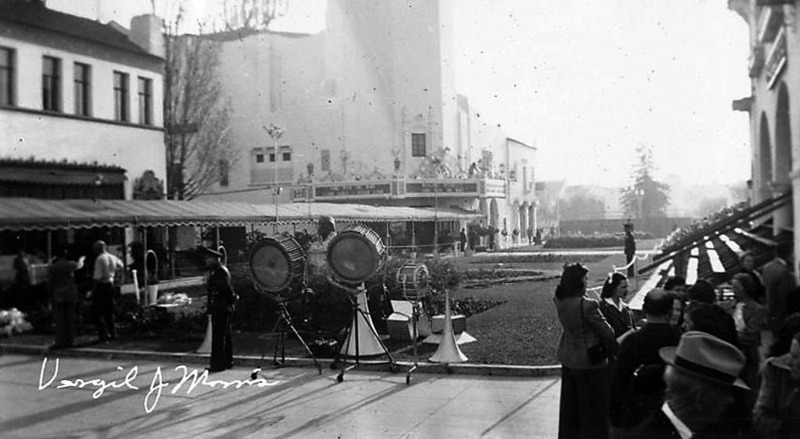 There is a ticket booth in the bottom right corner, and two young men dressed in white speaking to the drivers of the automobiles at the front of the lines. Across the street there is a grocery store called "Green Spray Market". 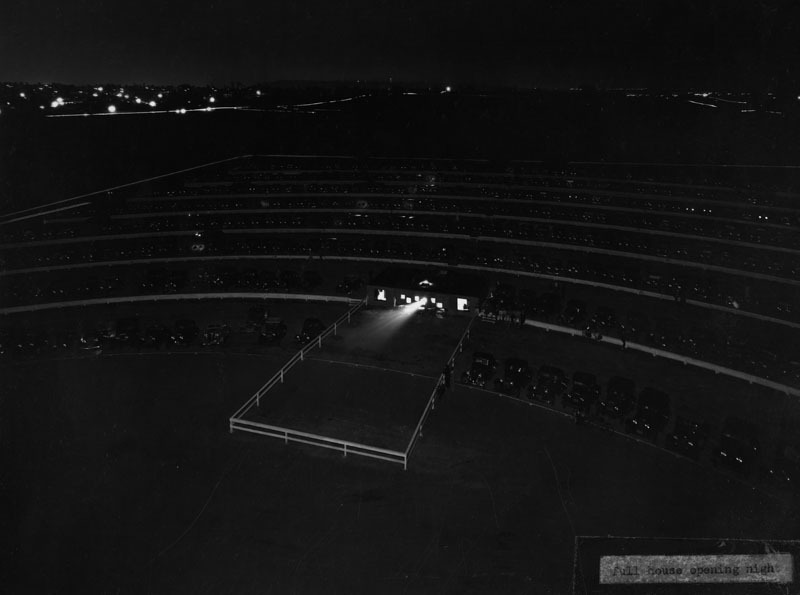 (1934)*^^ - Opening night at the "Drive-In Theater" (later Pico Drive-In Theatre), 10850 W. Pico Boulevard, September 9, 1934. 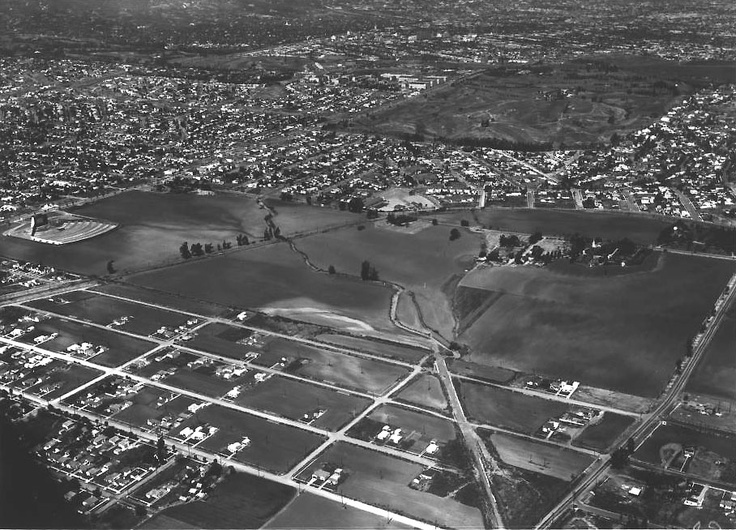 (1941)***^- An aerial view of Westwood and Rancho Park, taken on May 11, 1941. The Pico Drive-In is located at the left center of the picture. (1947)**^# - The Pico Drive-In, located at the corner of Pico and Westwood. (n.d.)***# - Window-mounted drive-in speakers...one for your car...one for the car on the other side of you. 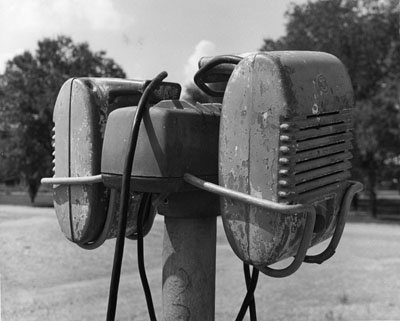 Later systems would transmit the signal through your AM radio. 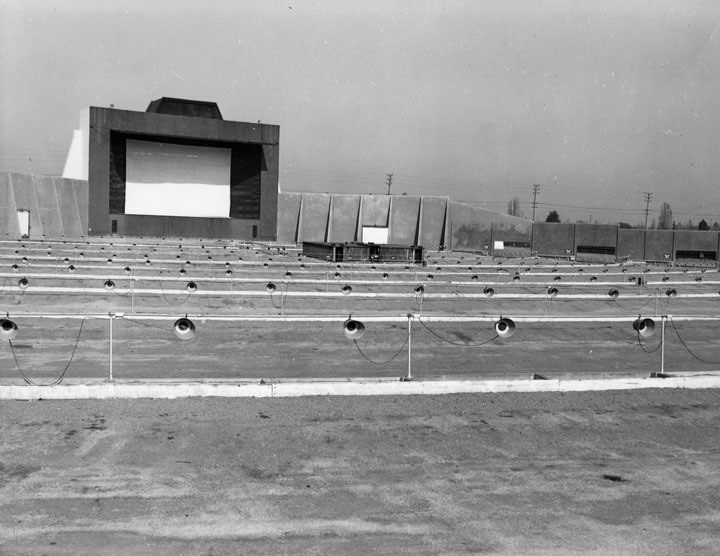 The outdoor theaters reached the zenith of their popularity during the 1950s. Piling the kids in the car made for a cheap family night out, and drive-ins were a favorite hangout for teens who'd recently gotten driver's licenses. (ca. 1938)* - View of Wilshire Boulevard looking west from Mariposa as seen from a double decker tour bus. 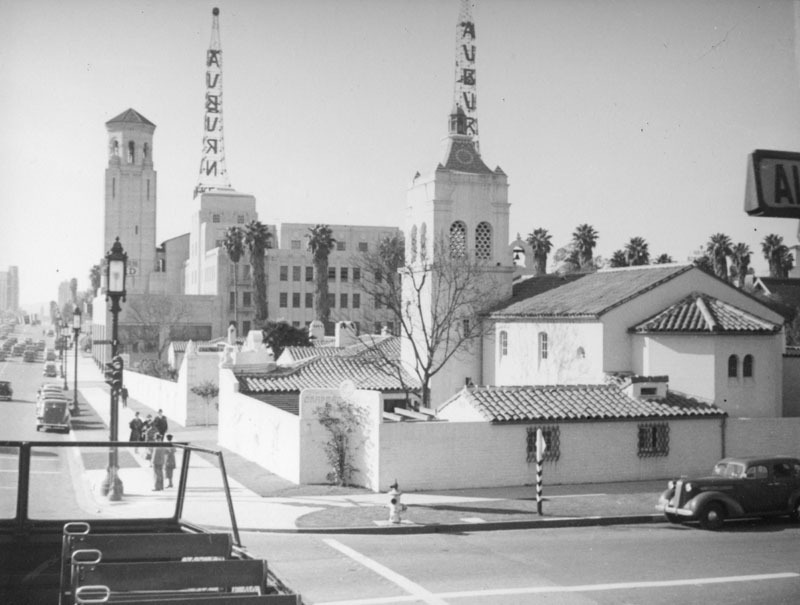 From right to left this view includes: the Pueblo bungalow court of the Chapman Hotel (before the Zephyr Room was built), the Cord Building with KFAC radio towers, and the Wilshire Christian Church. (ca. 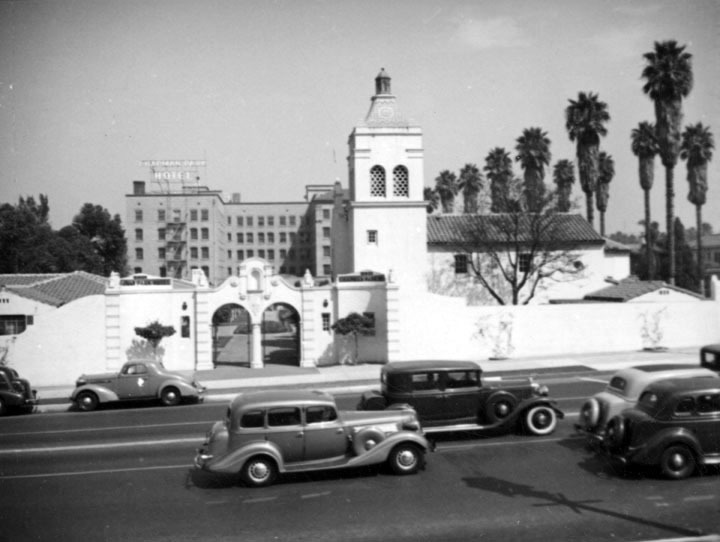 1947)#^*^ - View of the gated entrance to the Chapman Park Hotel as seen from Wilshire Boulevard. 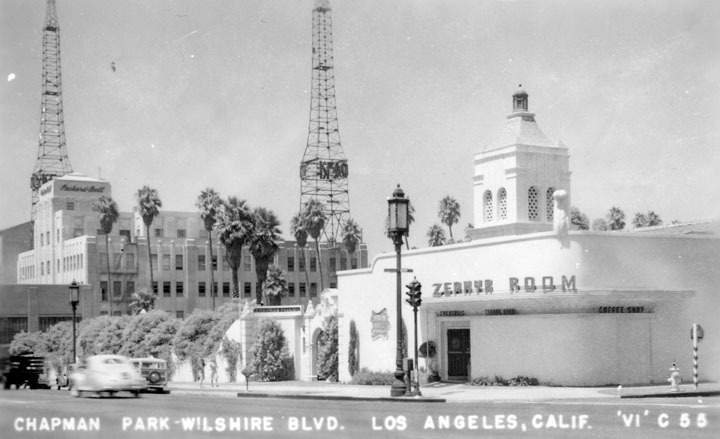 On the right, northwest corner of Wilshire and Alexandria Avenue, is the Zephyr Room. (ca. 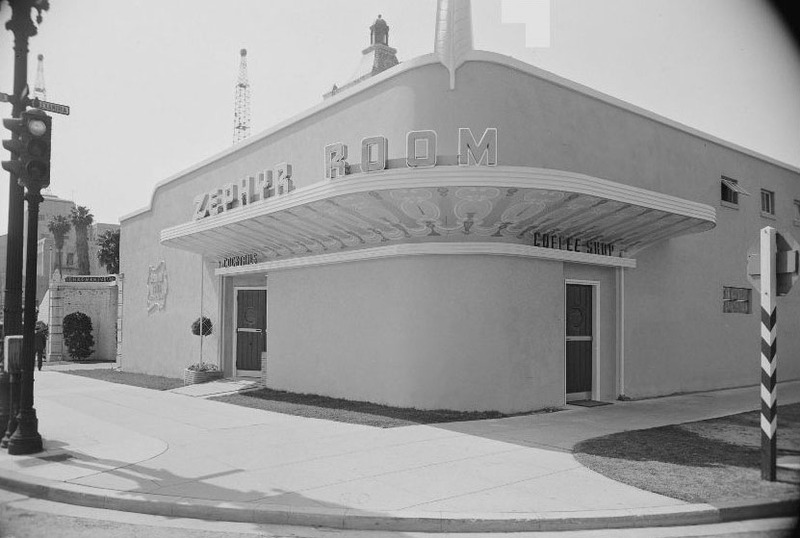 1947)#^*^ - View of the Zephyr Room located on the northwest corner of Wilshire and Alexandria Avenue. The sign above the door on the Wilshire side reads "Cocktails". The sign on the Alexandria Avenue side reads: "Coffee Shop". The radio tower in the background belongs to the Packard Bell Building. (ca. 1947)* - A postcard view of the Zephyr Room at Chapman Park Hotel, located at 615 South Alexandria Avenue. The "Packard Bell" building, with 2 radio towers near it, is also visible. (ca. 1950)**^ - Postcard view of Wilshire Boulevard looking east toward the intersection of Alexandria Avenue and Wilshire. From left to right can be seen the Zephyr Room, Brown Derby Restaurant and the Gaylord Apartments. Across the street, on the south side of Wilshire, is the entrance to the Ambassador Hotel. (ca. 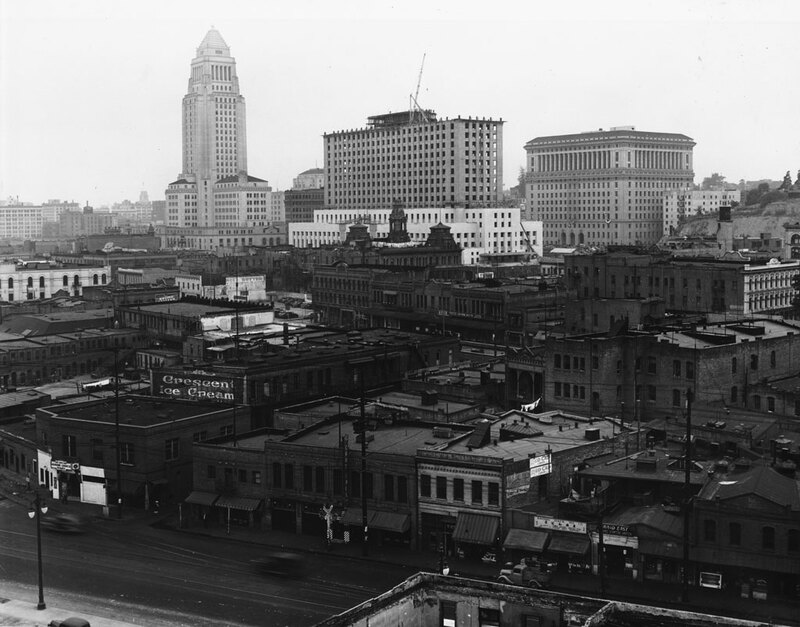 1930)^^ - View looking northeast from City Hall showing the old part of Los Angeles including the LA Plaza and Chinatown. At left can be seen the ornate Baker Building with its three distinct towers located on the historic 300 Block of N. Main Street. Los Angeles Street runs diagonally from lower-right to upper-left. Aliso Street runs from Los Angeles Street, at center, east and then tunrs diagonally up. The propsed site of the new Union Station would be northeast of the intersection of Los Angeles and Aliso Streets. (1934)^^ - Caption reads: “Site of new Union Terminal (enclosed by lines), where dirt to be removed from Fort Moore Hill will be used for filling in. 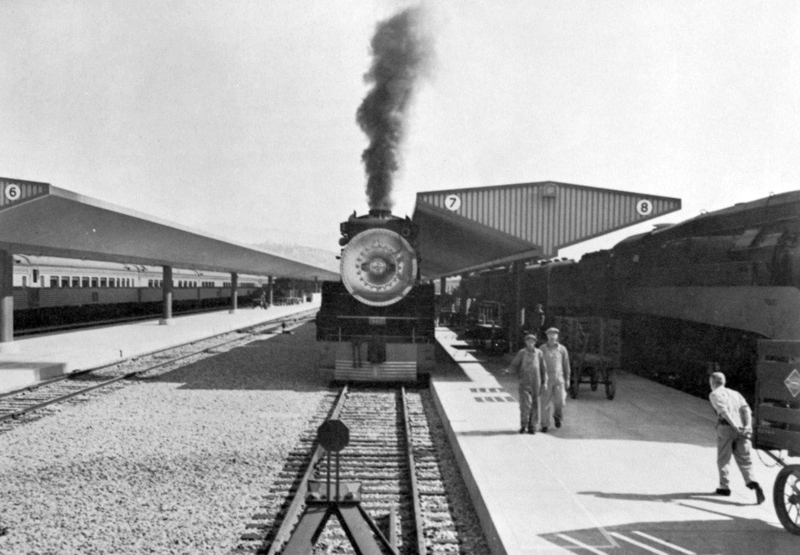 This great depot will serve all steam railroads entering Los Angeles. Chinatown is seen in foreground of station site." 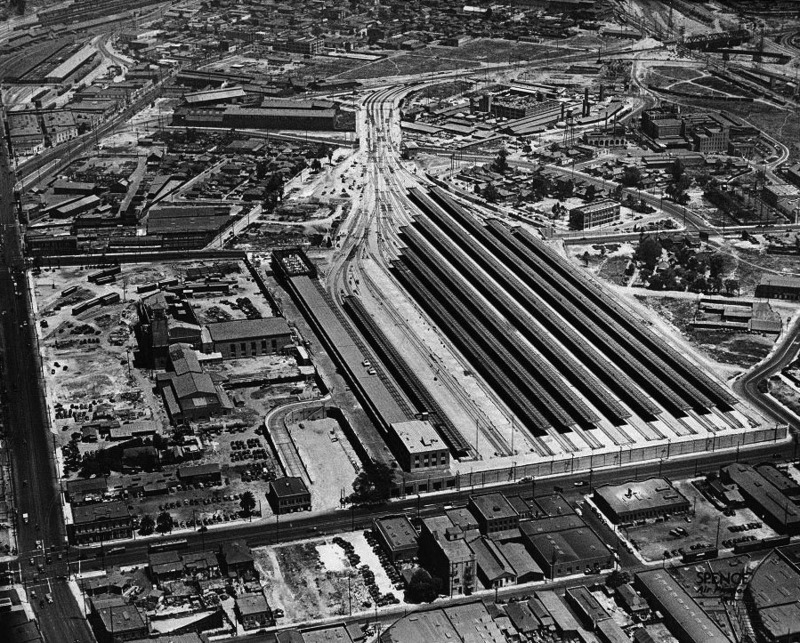 (1938)^^ - View looking north toward Union Station, still under construction. The main road going along the left side of the photo is Alameda Street. 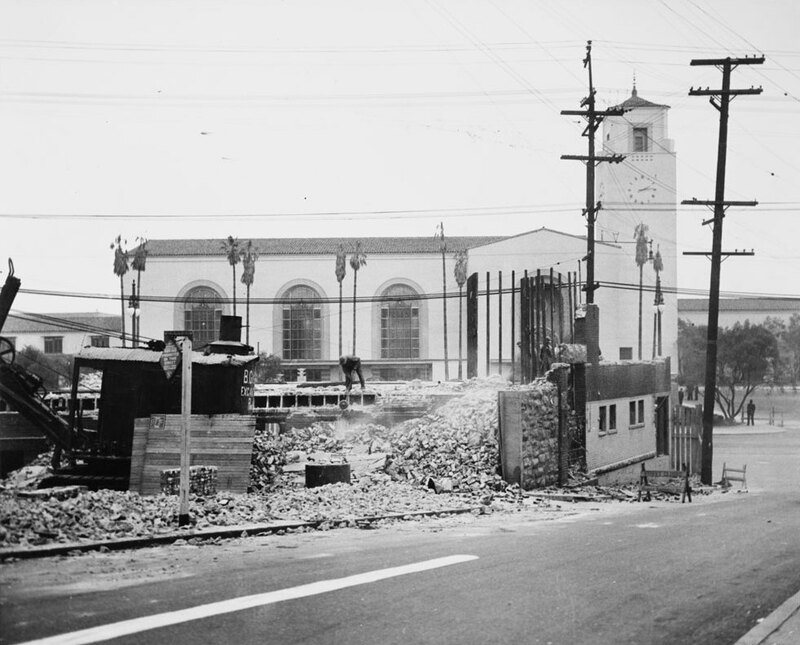 Aliso Street is at the southern end of the station near where the Hollywood Freeway is located today. (ca. 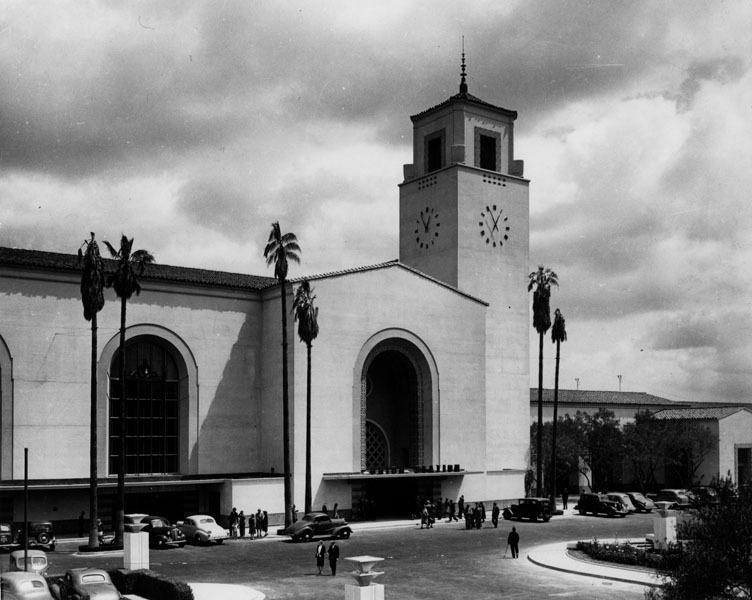 1939)#### – View showing workers at Los Angeles Union Station alongside a Southern Pacific Daylight Special which would link Los Angeles with San Francisco on daily trips. 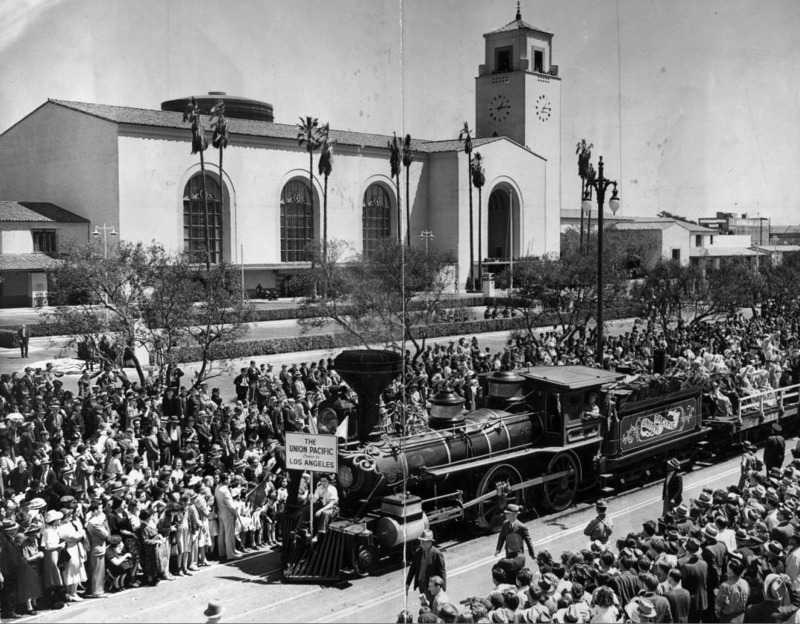 (1939)^^ - Crowds watch train while celebrating completion of the new Union Station. (ca. 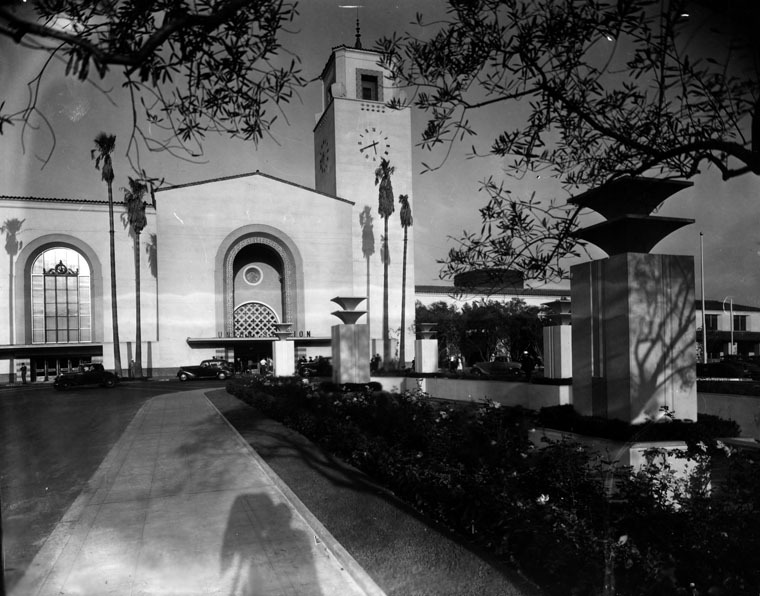 1939)* -View of the main entrance and clock tower of the new Los Angeles Union Station. (n.d.)^^* - A giant archway welcoming travelers to Union Station glows in the evening light. 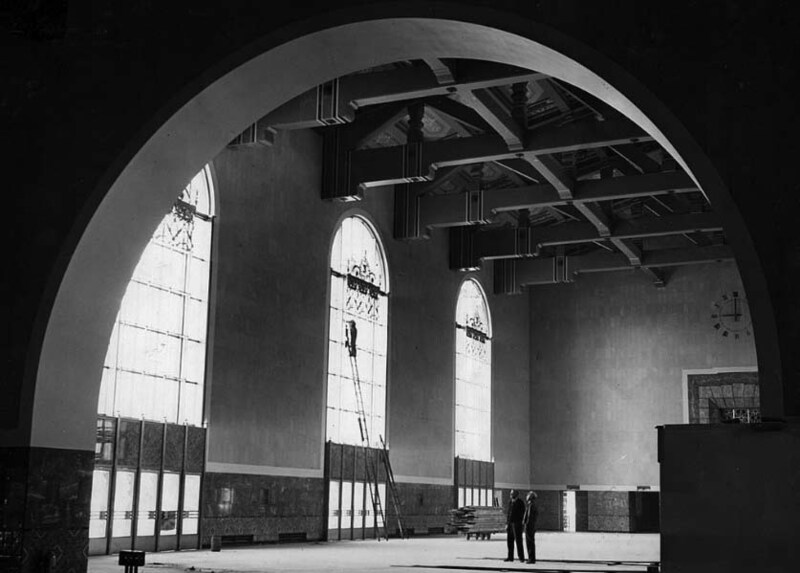 (1939)^^* – View showing visitors two men checking out the work at Union Station’s main concourse during construction. Photo date: February 24, 1939. Note the man on top of the tall ladder. 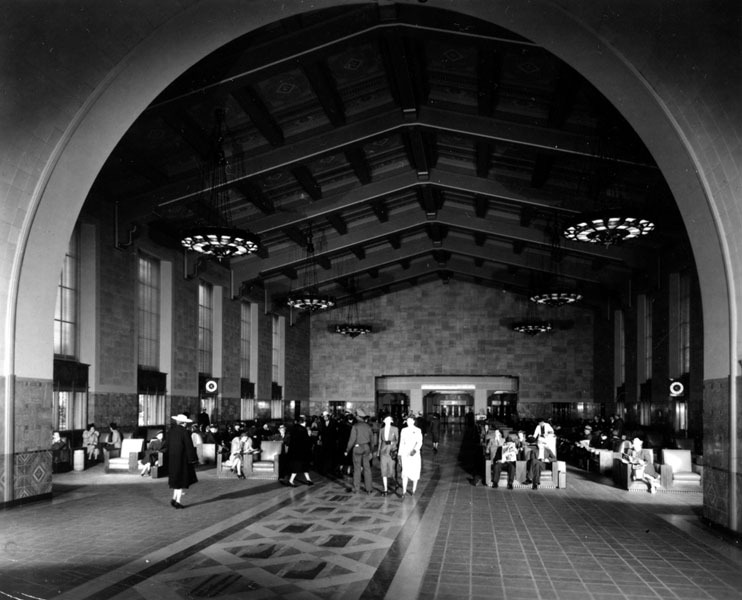 (1939)* - Interior view of the new Union Station soaring ticket concourse with its beamed ceiling, arched windows, travertine marble walls and tile floors. The new station covers 40 acres on North Alameda Street near the old Plaza. Photo date: April 15, 1939. (ca. 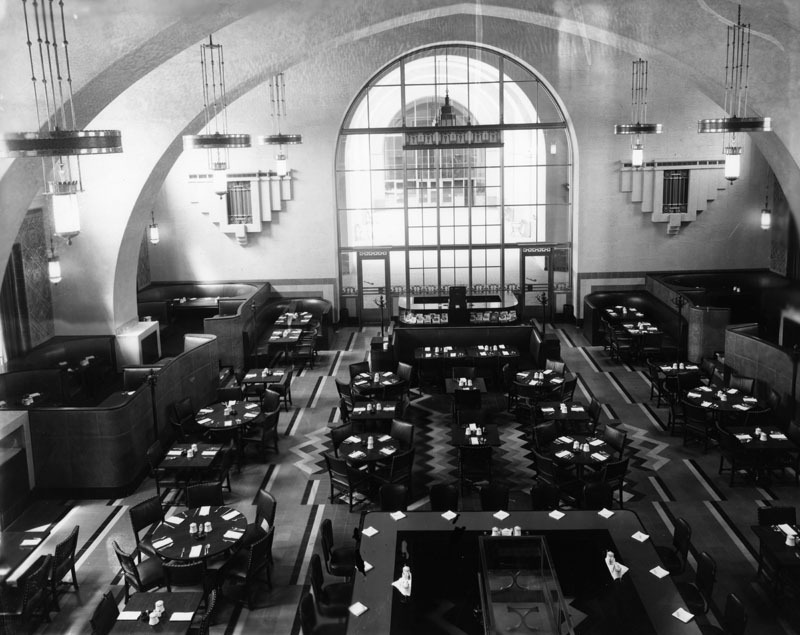 1939)* - Interior view of the Harvey House Restaurant in Union Station. Built in 1933-39, it was designed by architects Donald and Charles Parkinson. 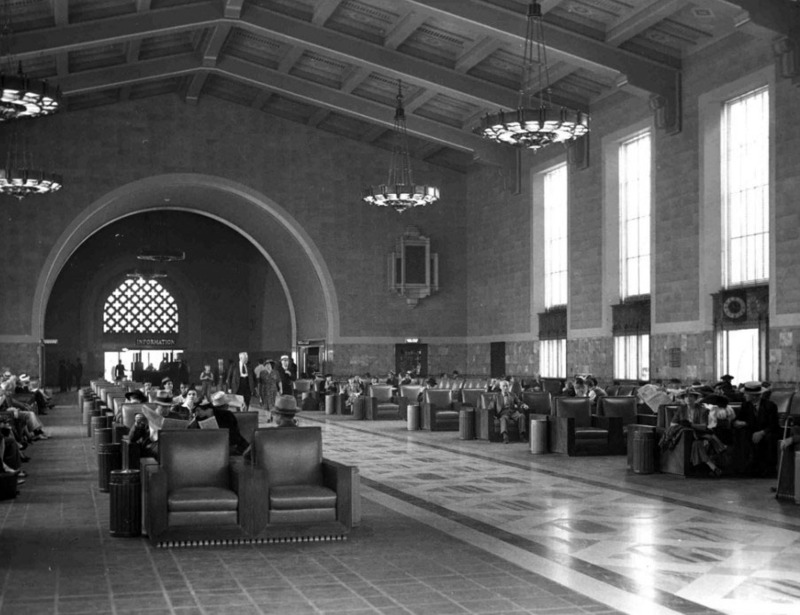 (1939)*^^ - The iconic leather chairs in Union Station’s waiting area, ready for the coming crowds. 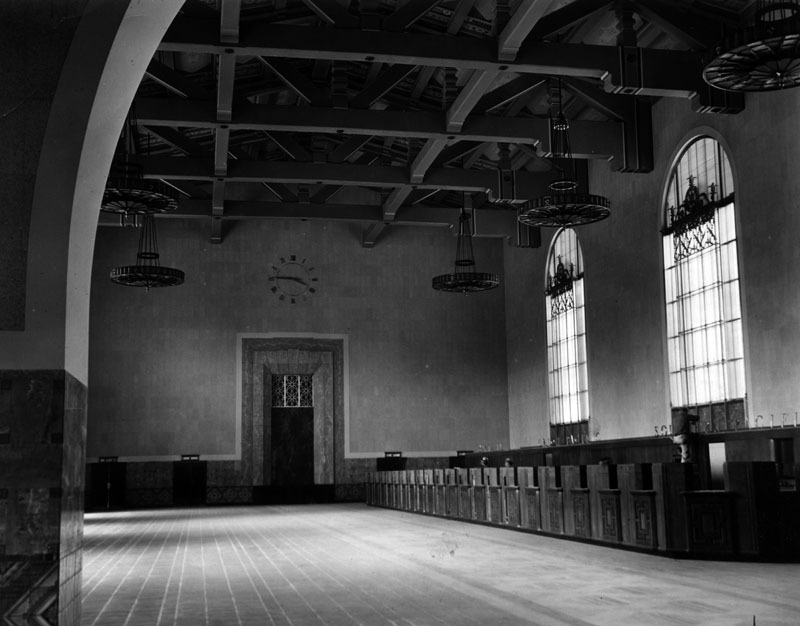 (1939)* - Interior view of the main course, L.A. Union Station, showing the tiled floors and high ceilings. 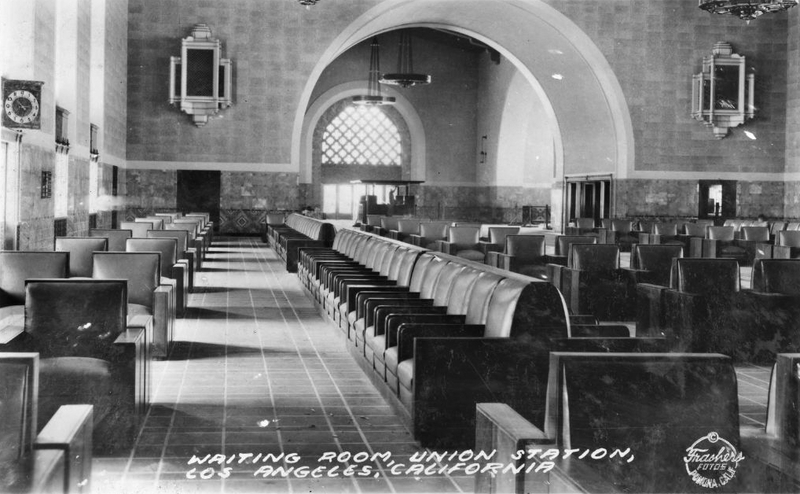 (1939)#* - View of the waiting area at Union Station. The stylish hanging lamps coupled with the large floor-to-ceiling windows provide more than ample light for reading. (ca. 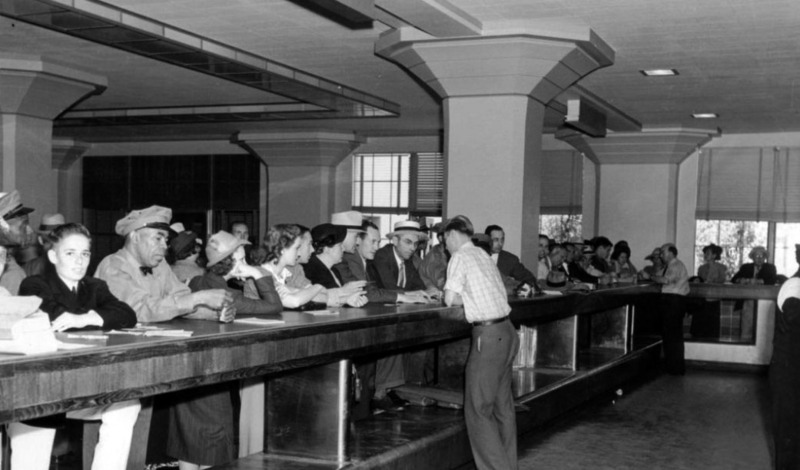 1943)#* – View showing the baggage claim counter at Union Station. Today this is a Hertz car rental counter. Click HERE for contemporary view. (n.d.)^^* – Long hallways lead from the main terminal to the rail platforms at Union Station. (ca. 1939)* - View of the sidewalk and landscaping outside the entrance to Union Station. View also shows the clock in the tower at the Station and the photographer’s shadow in the foreground. 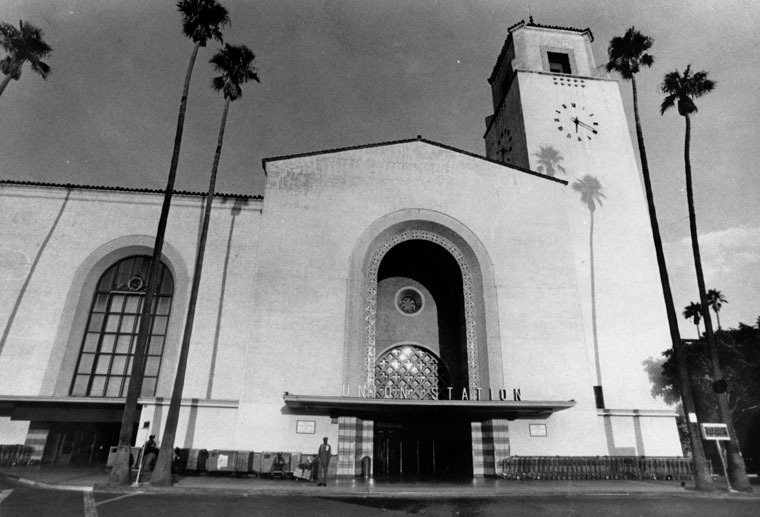 (1940)* - Exterior view of Los Angeles Union Station, located at 800 N. Alameda Street, showing several palm trees, arched windows, and the large tower and clock. 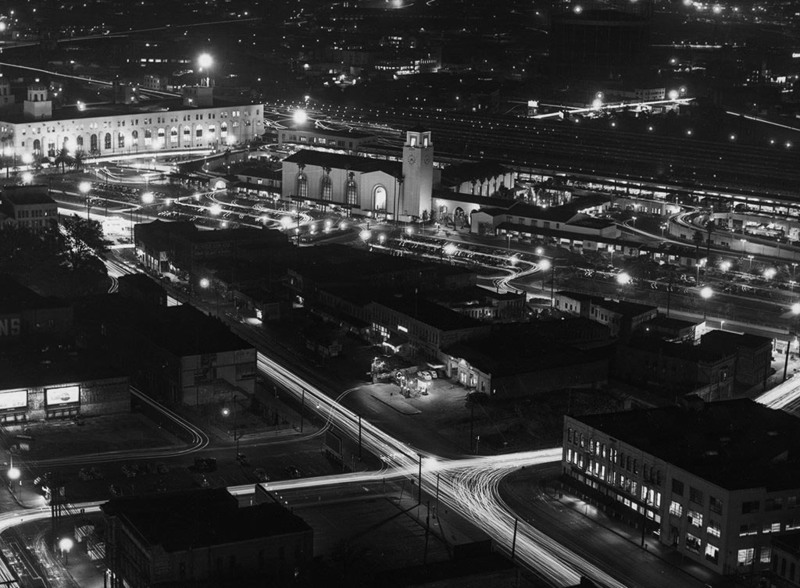 (1939)+++ – Bird’s-eye night view showing a well-lit Union Station with full parking lot. Terminal Annex Post Office is seen in upper left corner. The intersection of Aliso and Los Angeles Streets is seen in the foreground. The 101 Freeway would be built along Aliso Street in the early 1950s. Click HERE to see more. 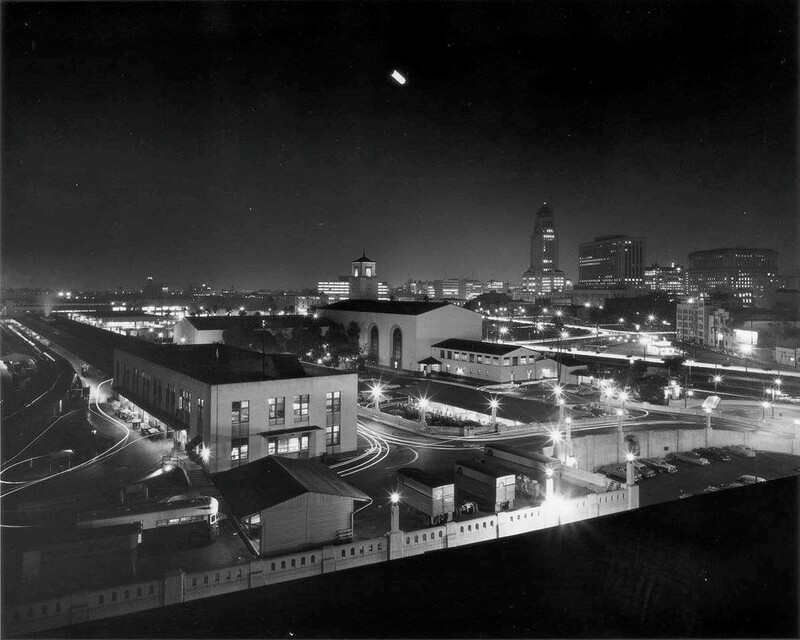 (1956)+^^ - Time elapsed photo showing Union Station in the foreground with City Hall, the Federal Courthouse Building, and the Hall of Justice in the distance. 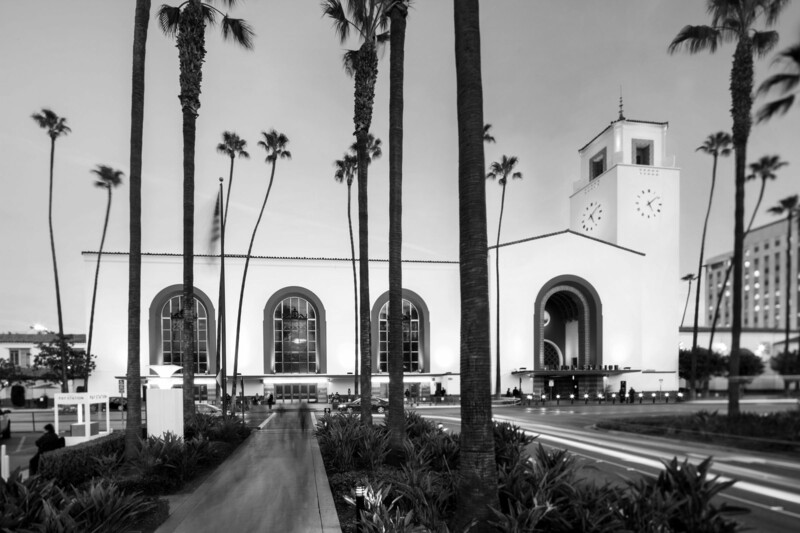 (2018)^.^ - Los Angeles Union Station as it appears today. 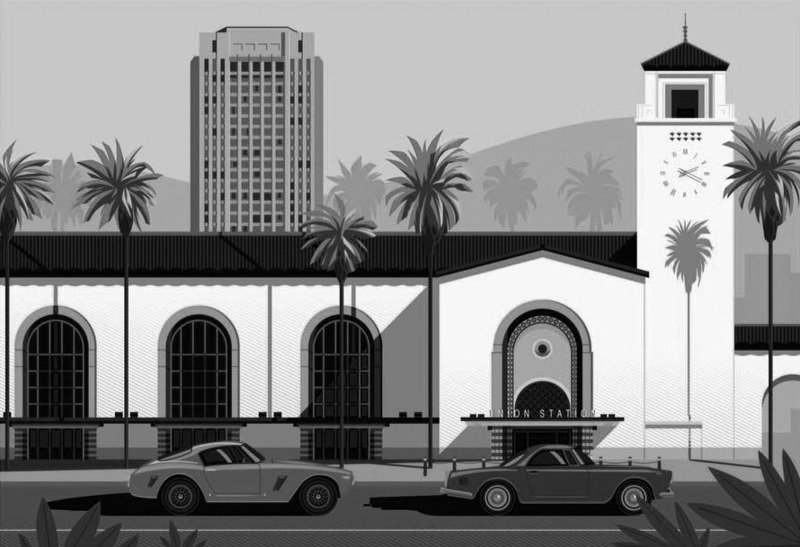 (n.d.)^.^ - Drawing showing Union Station surrounded by palm trees with the MTA Building seen in the background. 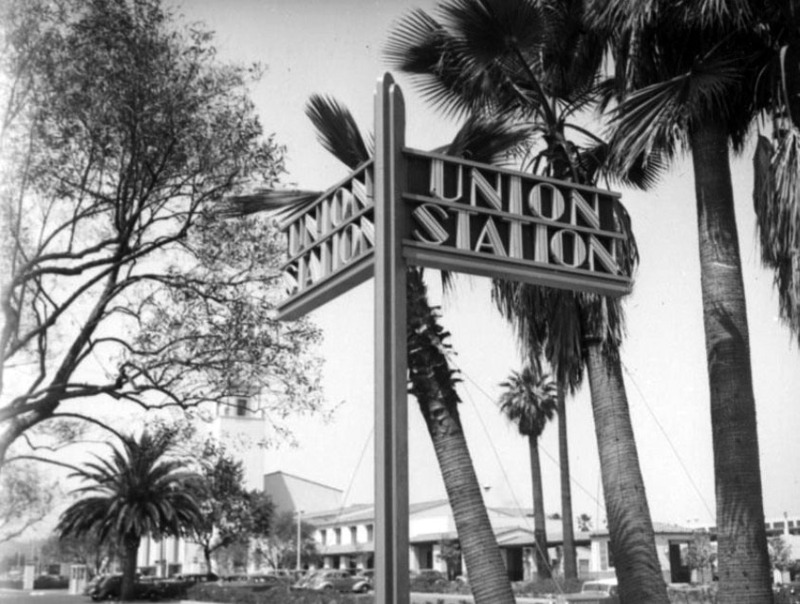 Union Station was placed on the National Register of Historic Places in 1980. It also is listed as Los Angeles Historic-Cultural Monument No. 101 (Click HERE to see complete listing). (ca. 1938)^^ - View of downtown looking southwest from where Union Station sits today. The new Federal Courthouse Building is under construction as seen between City Hall and the Hall of Justice. Alameda Street is in the foreground. The old Baker Block with its distinctive three towers still stands at the center of photo. 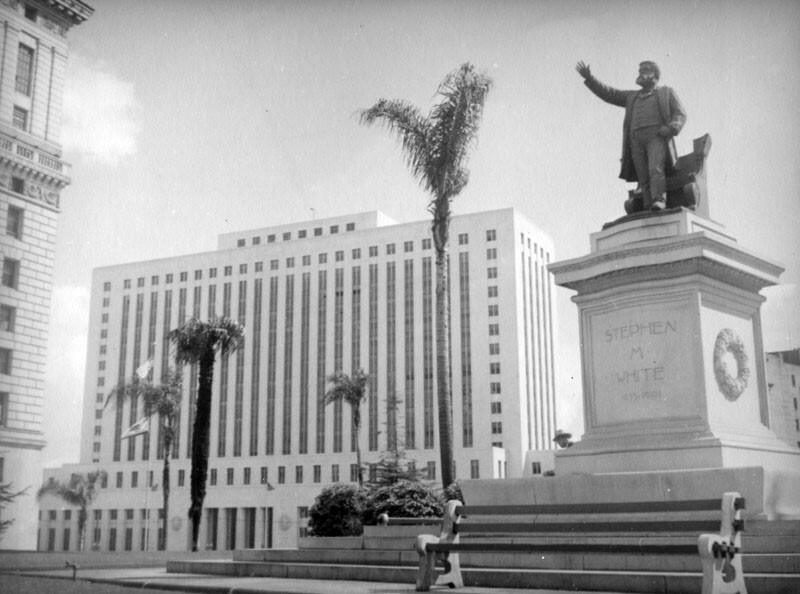 To the right-center of the photo is the Pico House in front of the LA Plaza which is out of view to the right. The old 1877-built Baker Block can be seen in the center of the photo just below the Federal Courthouse Building. 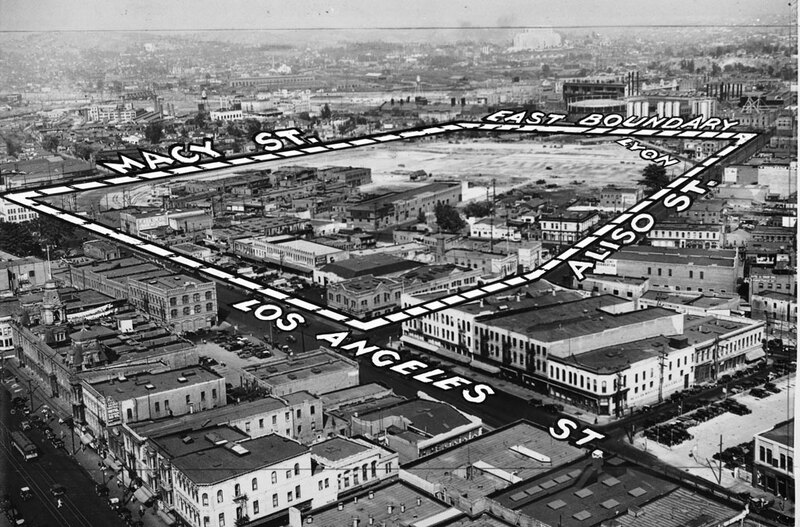 The Baker Block would be demoished in 1942 to make room for the 101 Freeway. (ca. 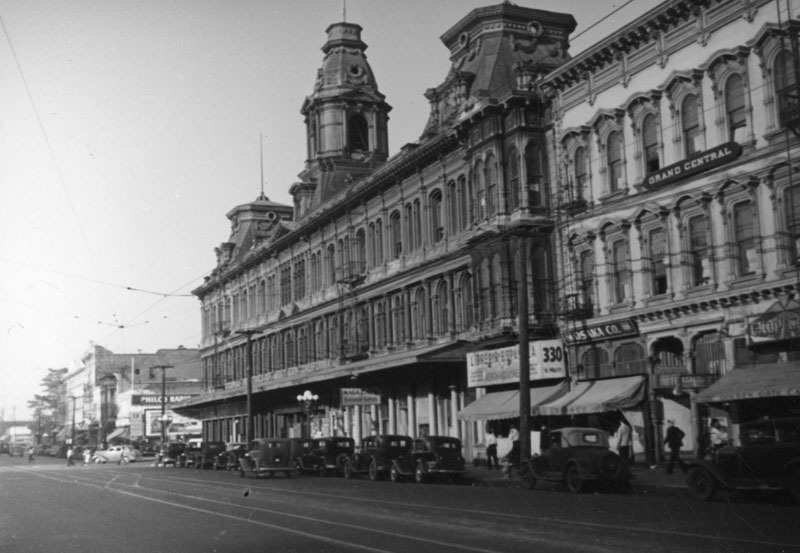 1930s)* - Looking across N. Main Street (foreground) towards the French Second Empire style Baker Block, on the southeast corner at Arcadia Street (lower left), and the Grand Central Hotel (right). Photo by Herman Schultheis. Click HERE to see more in Early Views of the Historic 300 Block of N. Main Street. (ca. 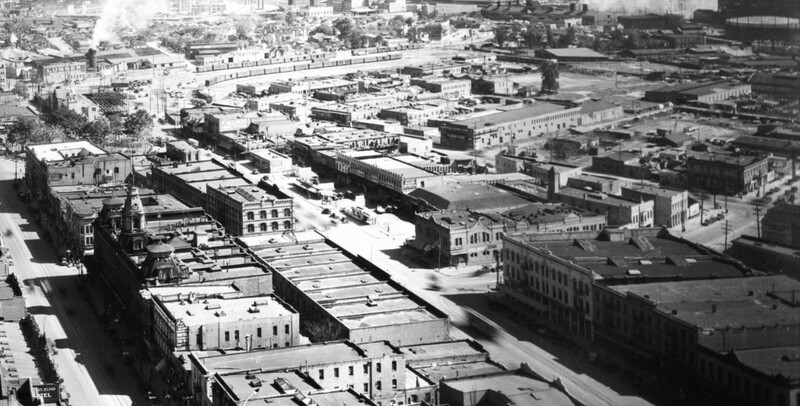 1939)^^ - View looking up Marchessault Street with Alameda Street crossing at bottom and Los Angeles Street crossing at mid distance. The LA Plaza is at upper-center left. The old Water Department Building, now occupied by the F. See On Company, stands on the northwest corner of Marchessault and Alameda. (1939)^^ - Photo caption reads: "Another Landmark Gives Way to Progress -- Photo shows wrecking yesterday of first home of the Department of Water and Power, recently purchased by the City, to make a wide approach by way of Marchessault Street to the new Union Station. With work being rushed, thousands of persons will occupy the site of this landmark on May 3, when the celebration's parade passes on Alameda Street. The old building was the main office of the municipal water works when the City bought out the private water companies operation here until 1902." (ca. 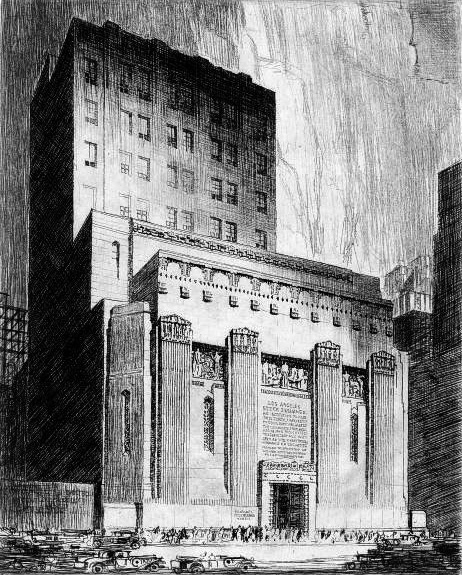 1929)+*^ – Sketch showing the Los Angeles Stock Exchange Building located at 618 S. Spring Street. (ca. 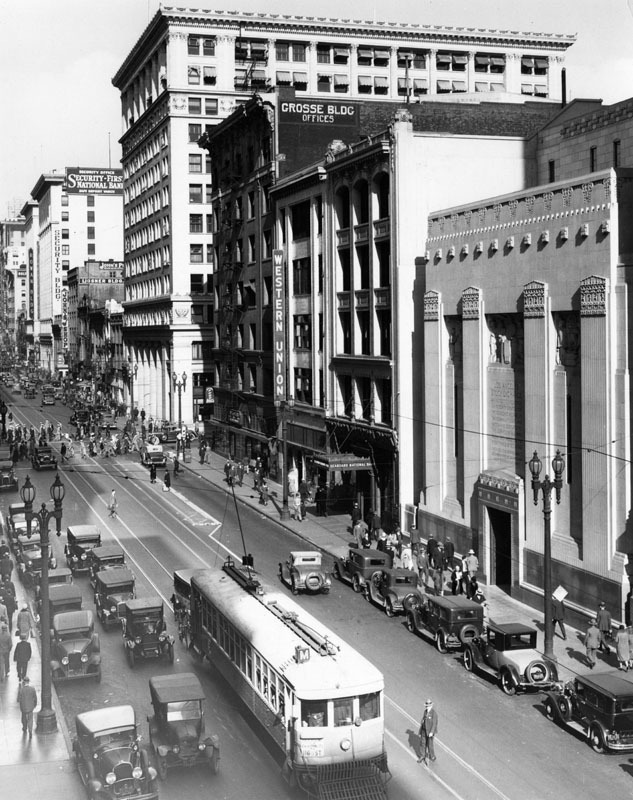 1932)* - View of Spring Street looking north from between 6th and 7th Streets, full of cars, streetcars and pedestrians. 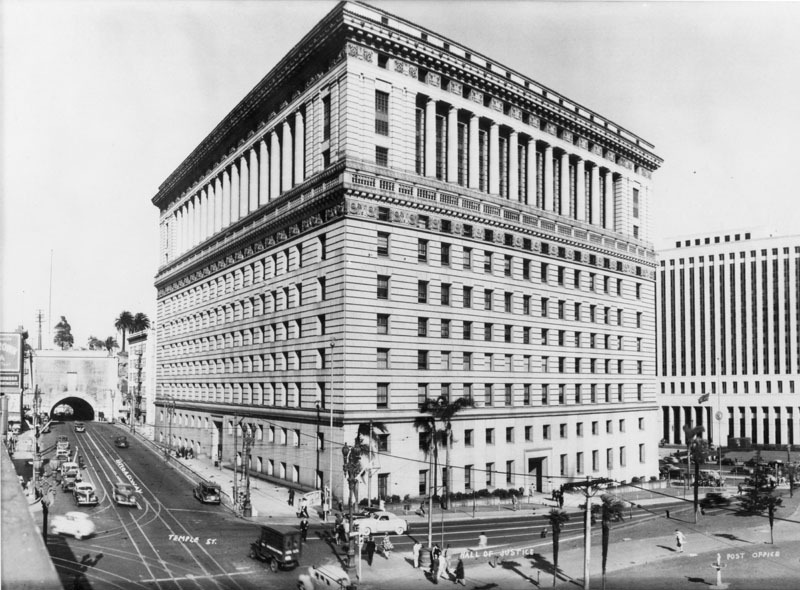 At right is the Los Angeles Stock Exchange building (later the Pacific Coast Stock Exchange), located at 618 South Spring Street and built in 1929-1930. 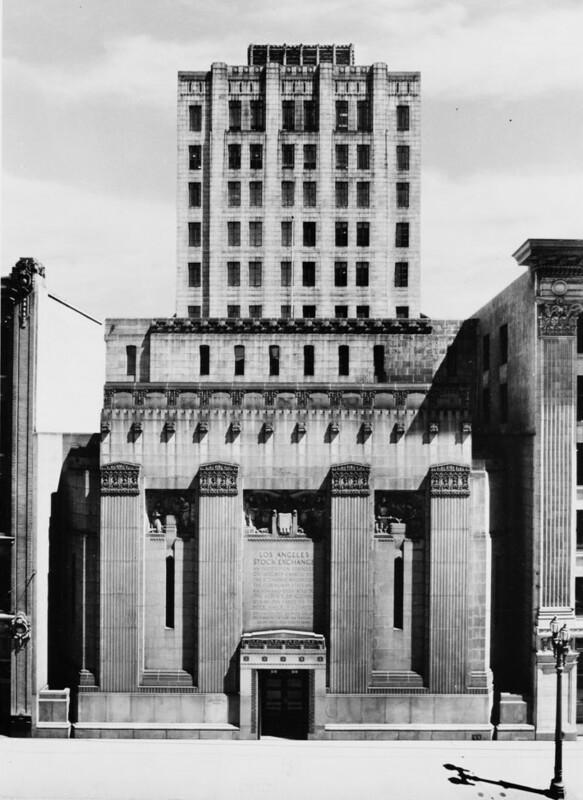 (1939)* - Exterior view of the Los Angeles Stock Exchange Building at 618 South Spring Street on May 5, 1939, ten years after it was built. 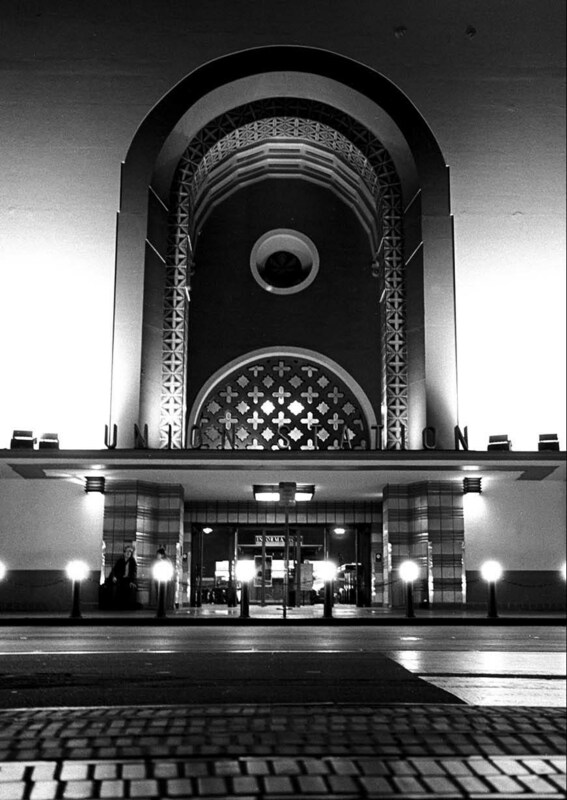 (1931)* - Night view of the main doorway into the building. Note the architectural designs on the door and around the entrance. 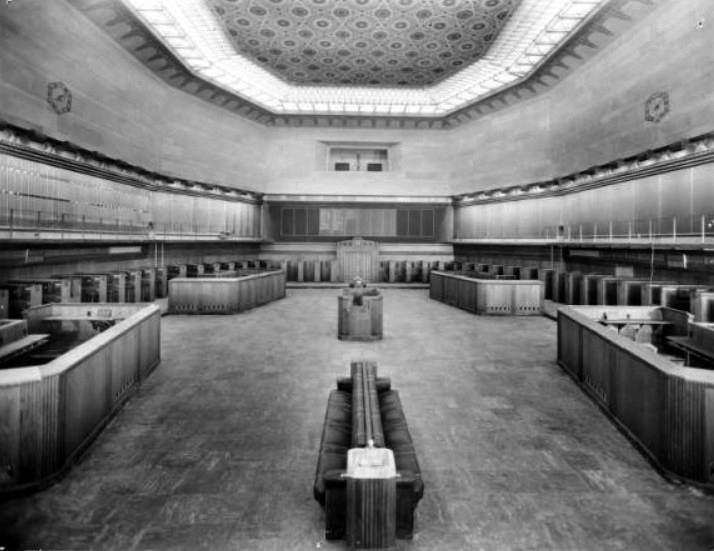 (1930s)^^ - Interior view of the trading floor of the Los Angeles Stock Exchange empty of people. Benches can be seen at center back-to-back, while two desks can be seen at left and two at right. Smaller desks line the wall, while what appears to be a balcony extends around the walls. Clocks can be seen on the wall at left and at right, while a pattern is visible on the ceiling. In size - 6,580 square feet - it was second only to the New York Exchange. 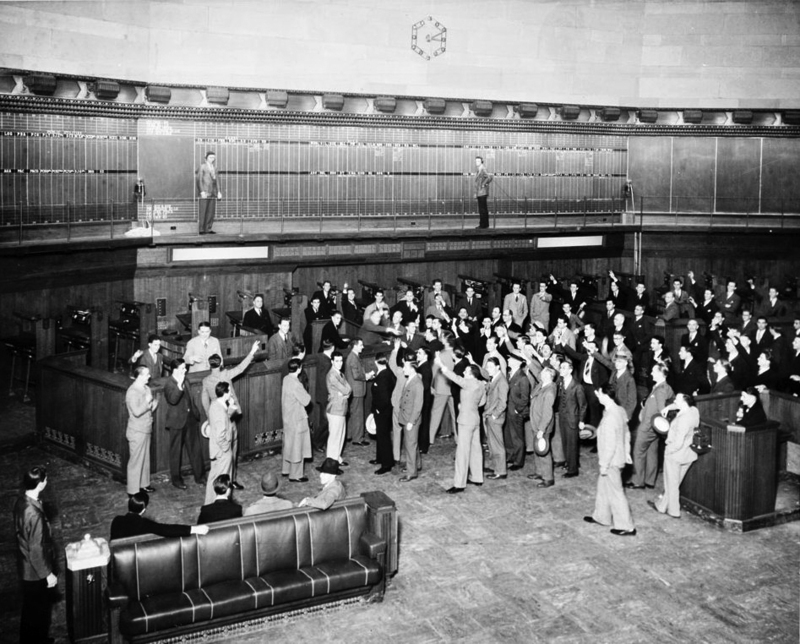 (1931)^^ - Inside view of the going-ons on the trading floor at the Pacific Coast Stock Exchange (originally the Los Angeles Stock Exchange) at 618 South Spring Street in Los Angeles. 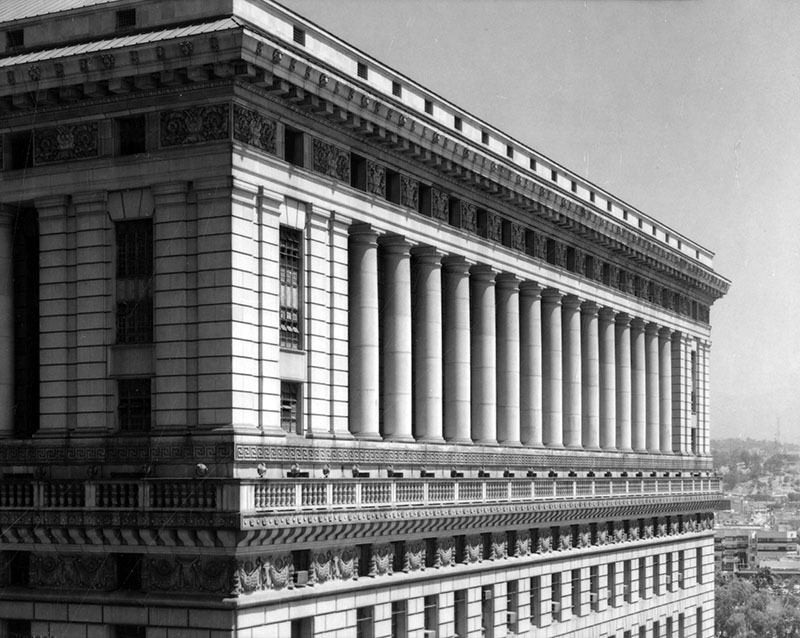 (1954)^^ - Exterior view of the Los Angeles Stock Exchange, located at 618 South Spring Street in Los Angeles. View is a direct view of the main facade. (2009)**^^ – View showing the front of the Los Angeles Stock Exchange Building as it appears today. 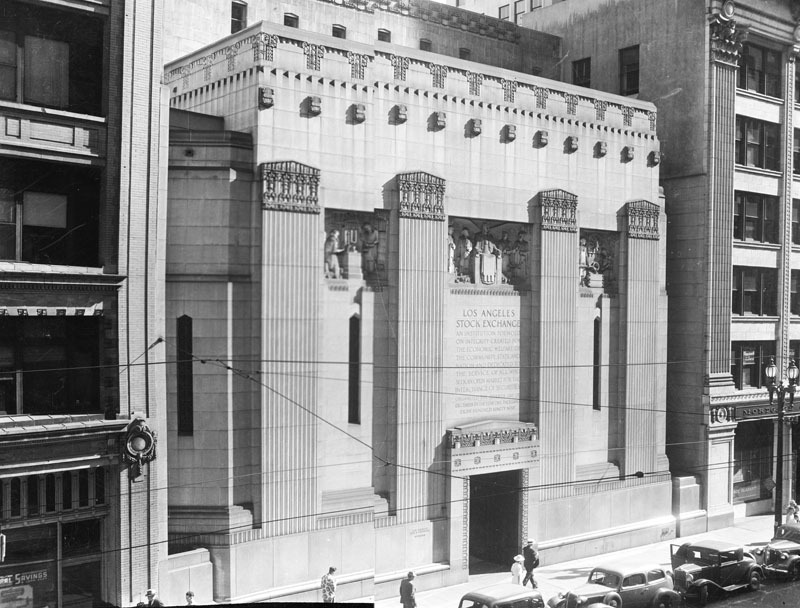 On January 3, 1979, the Los Angeles Stock Exchange Building was designated LA Historic-Cultural Monument No. 205 (Click HERE to see complete listing). 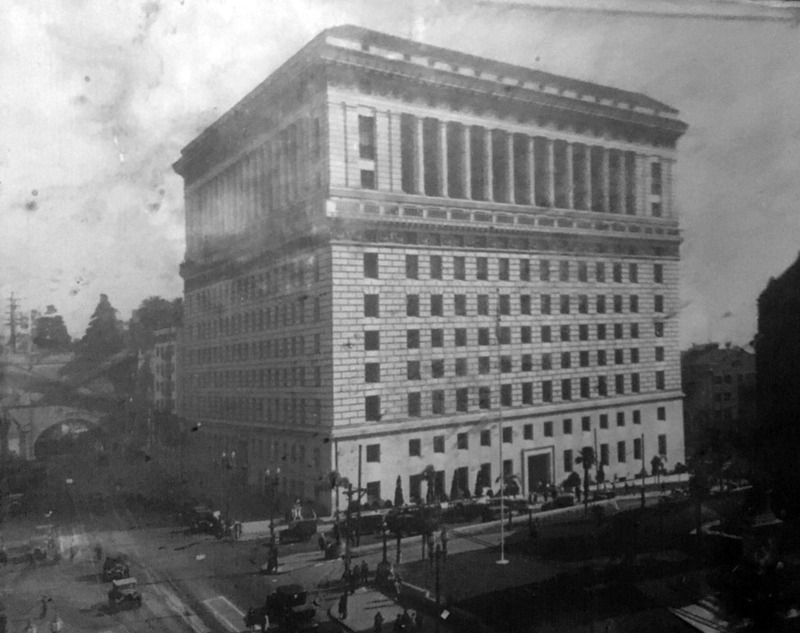 (1925)* - Construction of the new Hall of Justice building, with the granite facing nearing completion. (ca. 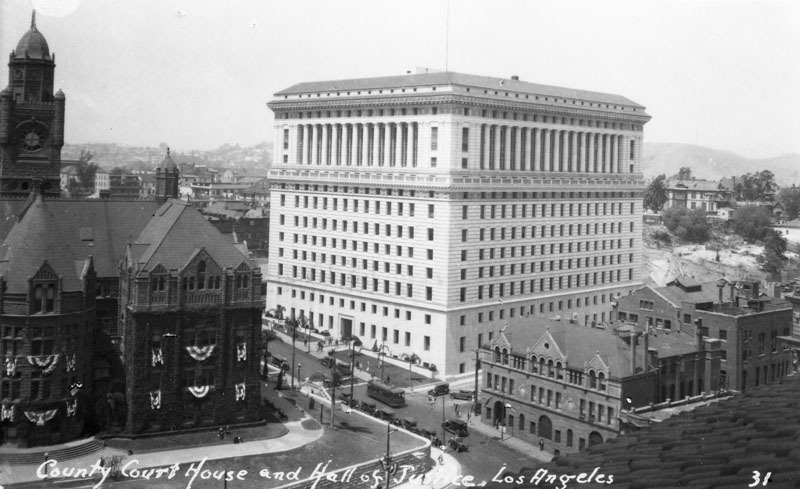 1928)* - View from City Hall looking northwest toward the Hall of Justice. The County Courthouse, with banners hanging from its windows, is to the left. 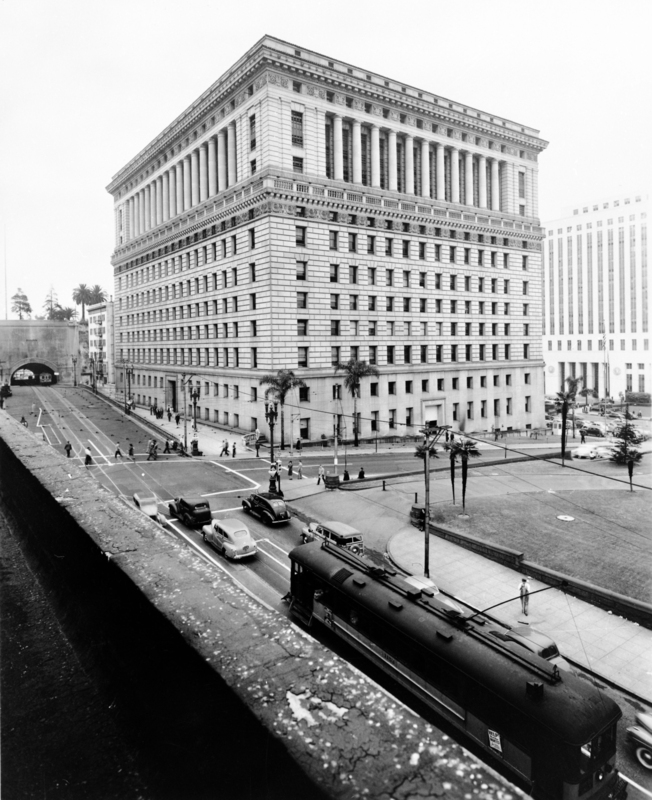 (1939)* - Exterior view of the Hall of Justice looking northwest, taken from Spring Street on May 4, 1939. In the foreground is the retaining wall and yard of the old County Courthouse on Spring and Temple Streets, with the door to its tunnel visible. The historic Beaux Arts building was built in 1925 and is the oldest building in the Civic Center. (ca. 1940)**^ - View looking northeast of the intersection of Broadway and Temple with the Hall of Justice located on the northeast corner. The Broadway Tunnel, which runs under Fort Moore Hill, is seen in the background. (ca. 1946)* - The Hall of Justice at center. The U. S. Post Office is behind and to the right. On the left is the old Broadway Tunnel. 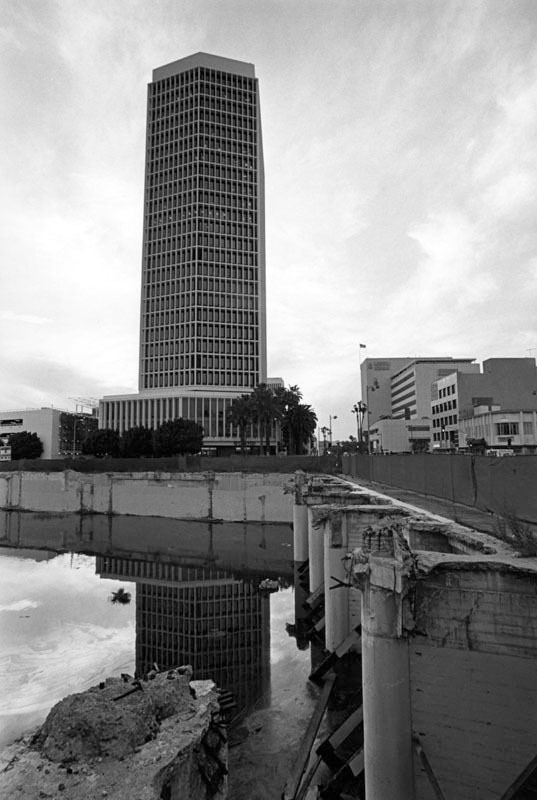 (2005)* - Exterior view of the Los Angeles County Hall of Justice and the corner of Spring and Temple Streets, looking northwest. Temple Street runs to the left and Spring Street to the right. (2005)* - Exterior detail view of the colonnade on the east facade of the Los Angeles County Hall of Justice, looking northwest. The colonnade runs along the perimeter of the upper floors and terra cotta detailing can be seen above and below the columns. 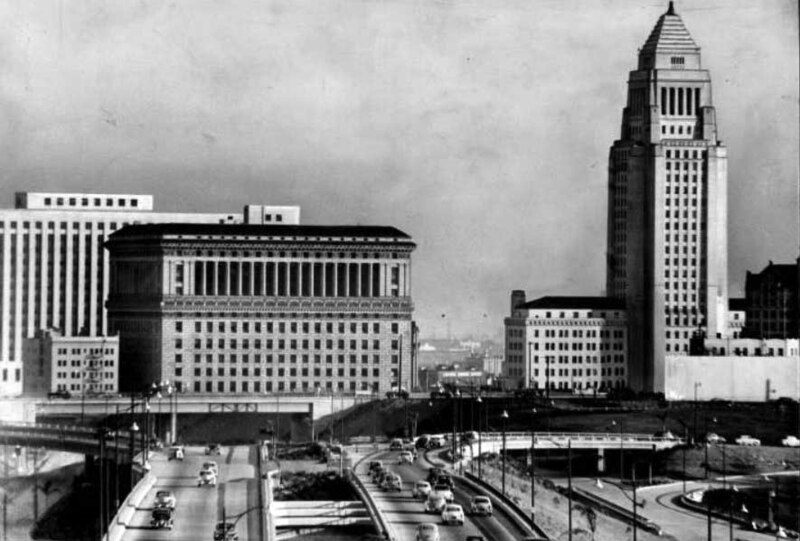 (1955)^^ - Driving east on the Hollywood Freeway, Los Angeles' Civic Center provides a massive and impressive appearance. In immediate foreground is the Hall of Justice, with the Federal Building framing it on left and the City Hall and Hall of Records, on right. Grand avenue exit from new freeway is seen in lower right. Just beyond the Civic Center, Hollywood Freeway joins the Santa Ana and Ramona Freeways, both of which are in the process of extension. 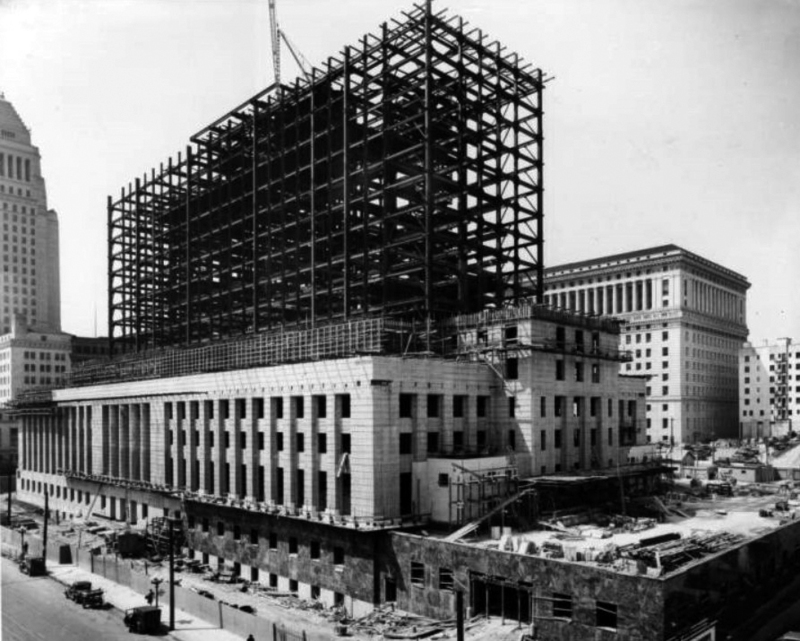 (1938)^^ - View showing the construction of the Federal Courthouse and U.S. Post Office Building located on the corner of Main and Temple streets. (ca. 1938)^^ - View of downtown looking southwest from where Union Station sits today. The new Federal Courthouse and U.S. Post Office Building is under construction as seen between City Hall and the Hall of Justice. Alameda Street is in the foreground. The historic ornate Baker Block with its distinctive three towers is seen at center of photo. 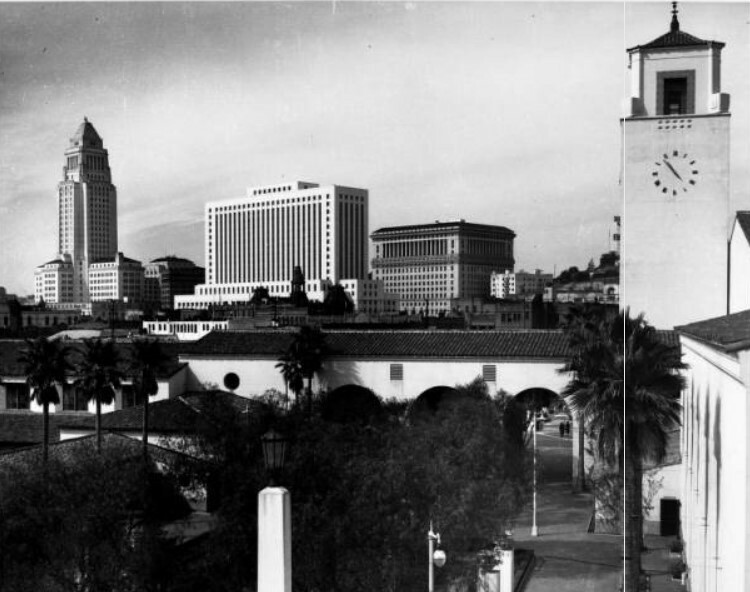 (1939)**^ - View of the Plaza with the LA downtown skyline in the background. 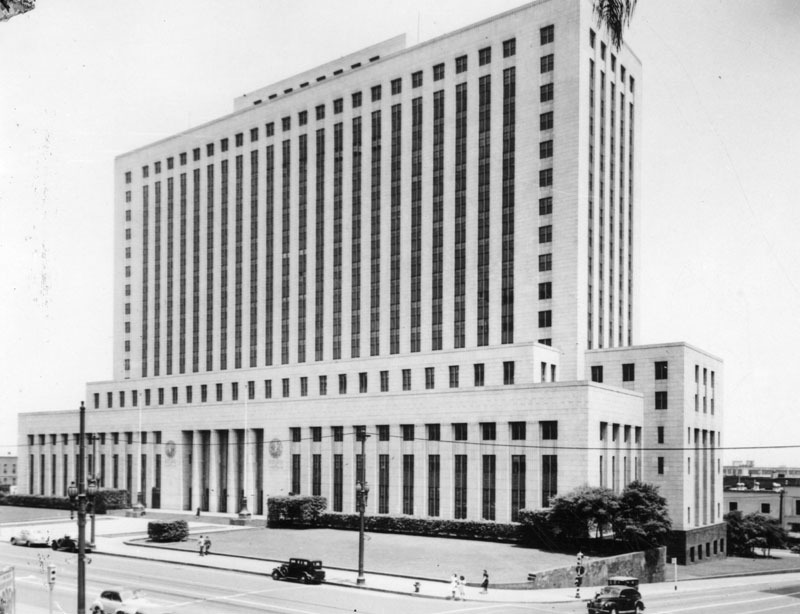 From left to right stand City Hall, the Federal Courthouse still under construction (completed in 1940), the Hall of Records, and the Hall of Justice. The old Brunswig Building can also be seen on the other side of the LA Plaza across from the Pico House. (ca. 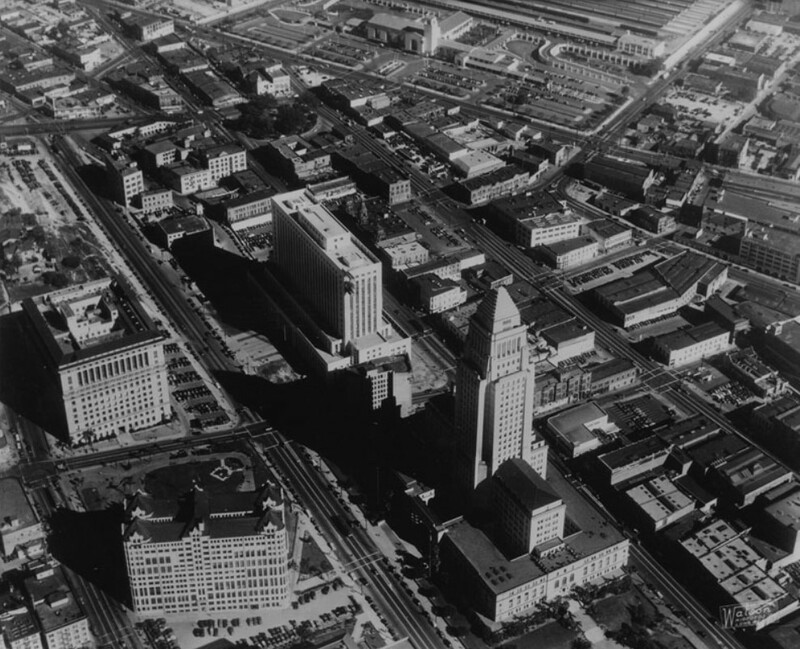 1940)^^ - Aerial view of the Civic Center showing the recently completed Federal Courthouse and U.S. Post Office Building with City Hall in the foreground. The new Union Station (built in 1938) is also seen at top of photo. (ca. 1940) - Postcard view showing the new Federal Courthouse and U.S. Post Office Building near City Hall and old Main Street. Click HERE to see more in Early Views of the Historic 300 Block of N. Main Street. (ca. 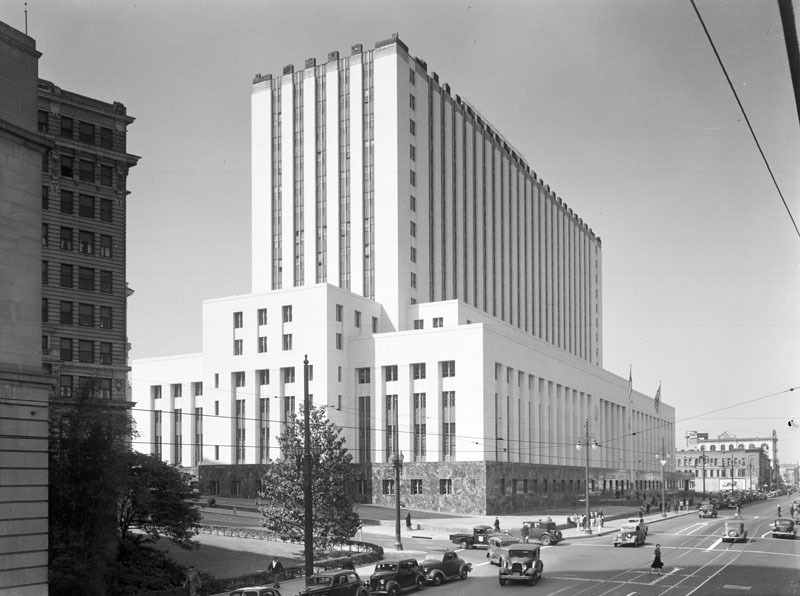 1945)* - View looking at the northwest corner of Temple and Main streets showing the Federal Courthouse and U.S. Post Office Building. (ca. 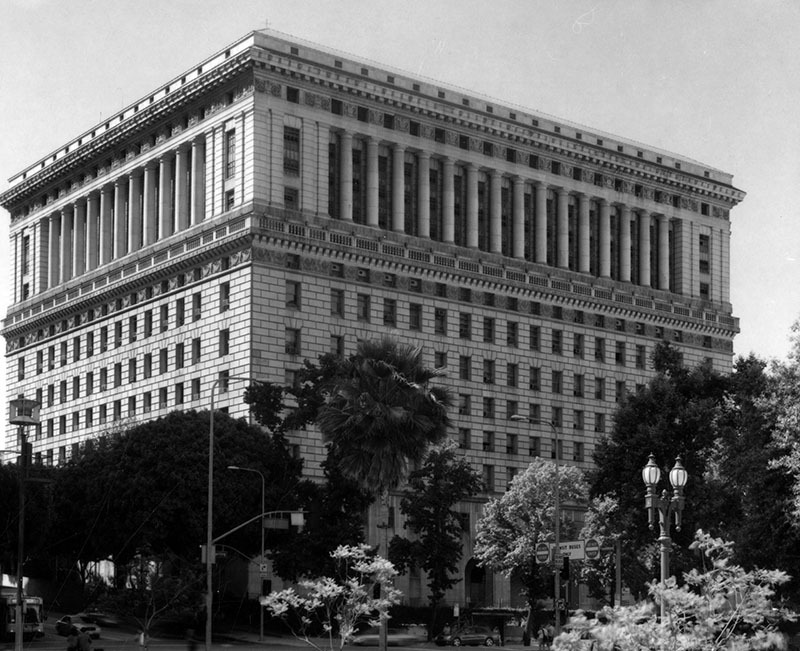 1947)* - View looking at the northeast corner of Temple and Spring streets showing the front of the Federal Courthouse and United States Post Office Building, 312 N. Spring Street. 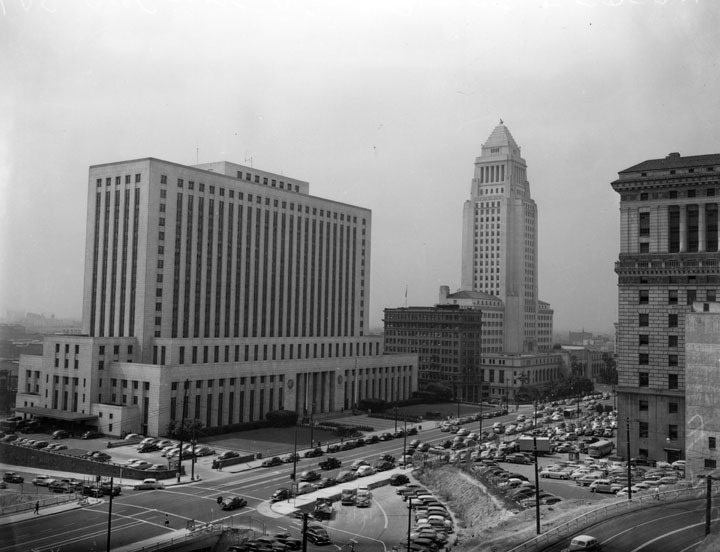 (1949)* - View of the Los Angeles Civic Center, showing the Federal Courthouse and U.S. Post Office Building as well as City Hall, as seen from Fort Moore. Numerous cars can be seen on the streets as well as in parking lots. (ca. 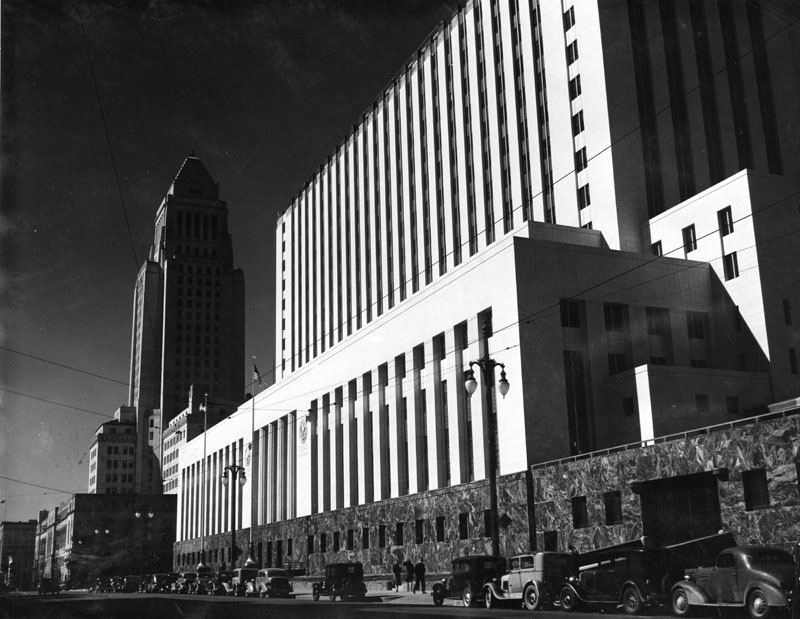 1940)* - View of the Los Angeles Civic Center, showing Los Angeles City Hall and the Federal Courthouse and U.S. Post Office Building. (ca. 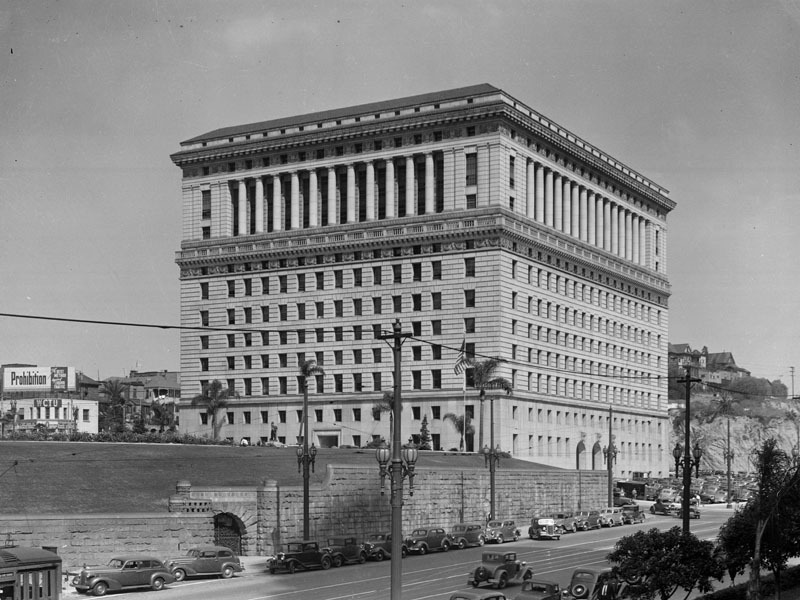 1940s)* - Exterior view of the Federal Courthouse and U.S. Post Office Building, located at 312 N. Spring Street. The Stephen M. White Statue, which was previously located on the corner of Temple and Broadway on the lawn of the Hall of Records, is seen here on the corner of 1st and Hill outside the new courthouse. Stephen M. White was elected Los Angeles County District Attorney in 1882, State Senator in 1886 and United States Senator in 1893. During his term in the United States Senate, Senator White’s most notable accomplishment was his successful leadership of the fight to create the Los Angeles Harbor in San Pedro as opposed to Santa Monica Bay, the site that was being advocated by powerful railroad interests. 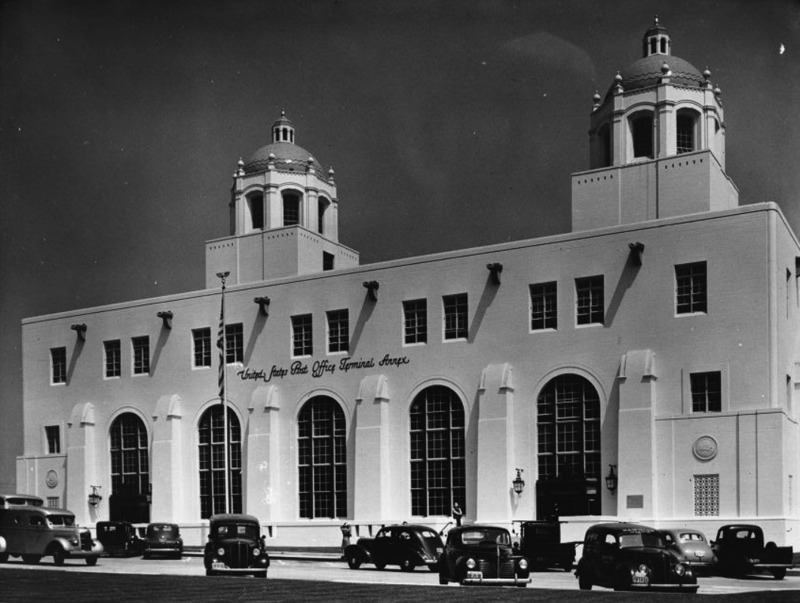 (1940)* - Front entrance to the United States Post Office Terminal Annex Building. Located at 900 N. 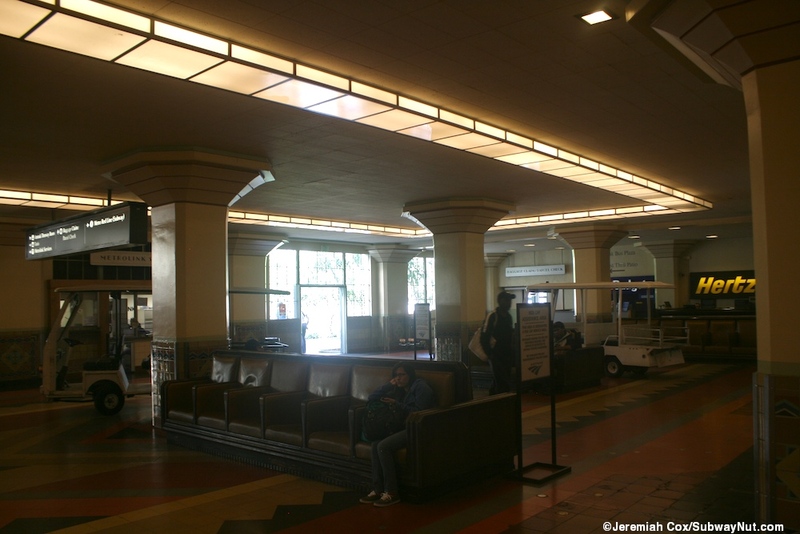 AlamedaSt., the Terminal Annex was built from 1939 to 1940. 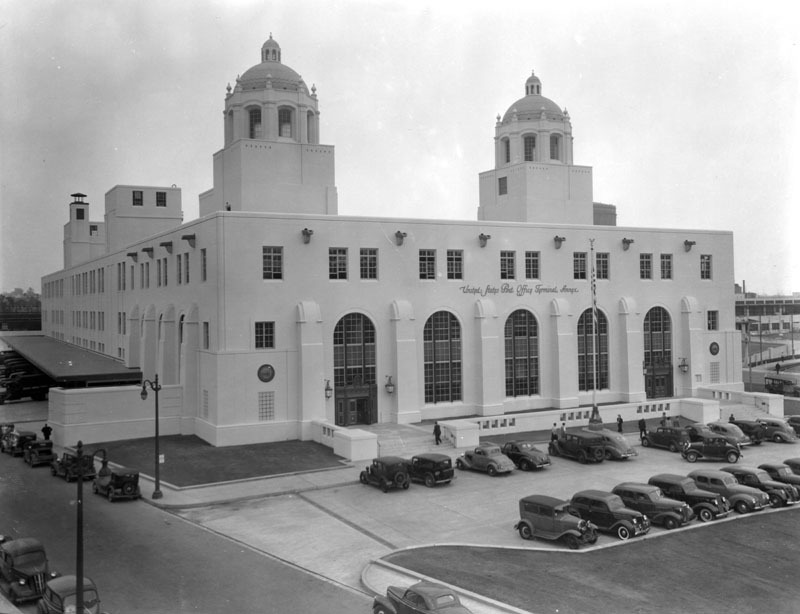 Photo clipping reads: "New United States Post Office Terminal Annex, at Alameda and Macy Streets, which will be open for business Monday. Costing $3,000,000, the building has a score or more 'first, biggest and only features,' including hollow column ventilation, new combination of conveyor belts and gravity chutes and biggest and fastest freight elevators." 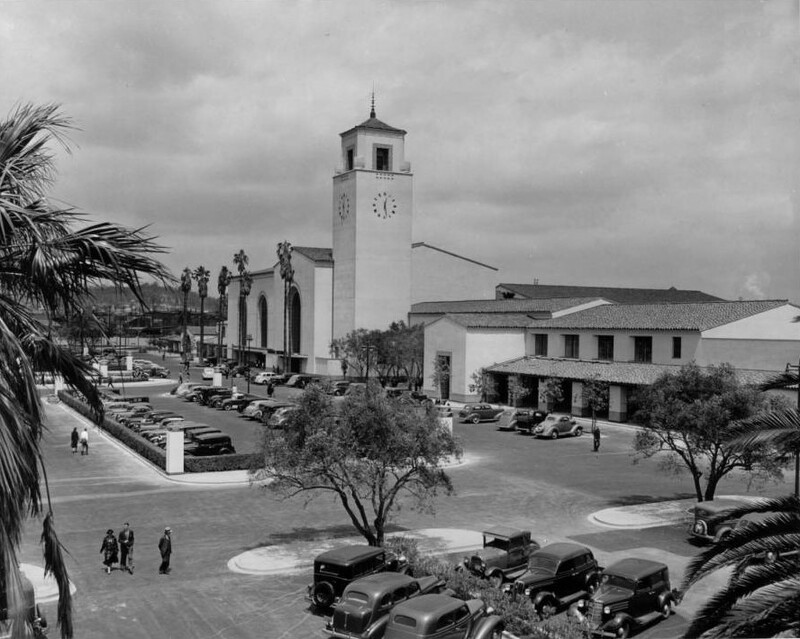 (1940s)^^ – View showing the Terminal Annex Building and parking lot. (ca. 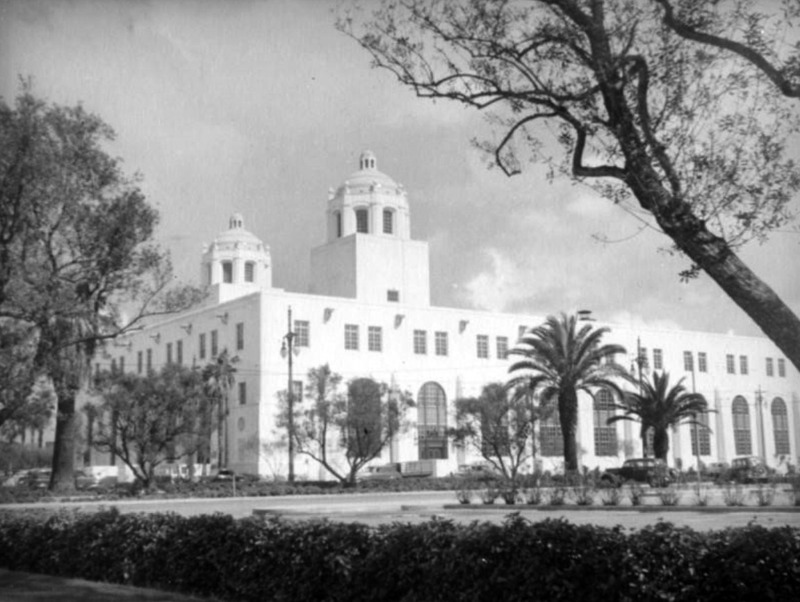 1945)* - United States Post Office Terminal Annex as seen from Union Station across Cesar Chavez (formerly Macy Street). 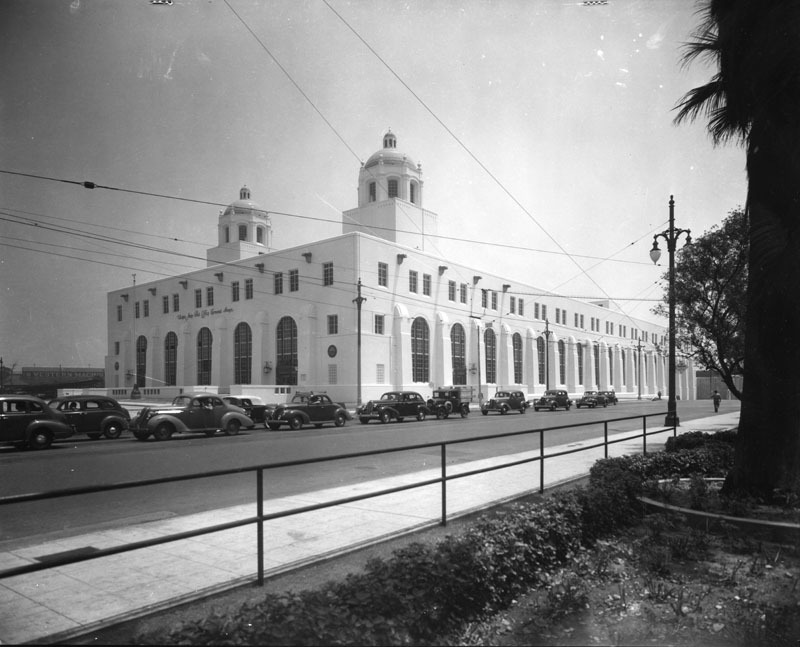 (1940s)* - United States Post Office Terminal Annex, located at 900 N. Alameda Street, as seen from Union Station across Macy Street (later Cesar Chavez Avenue). Only ten years after its opening, the demands of the city's mail had already outgrown the facility. 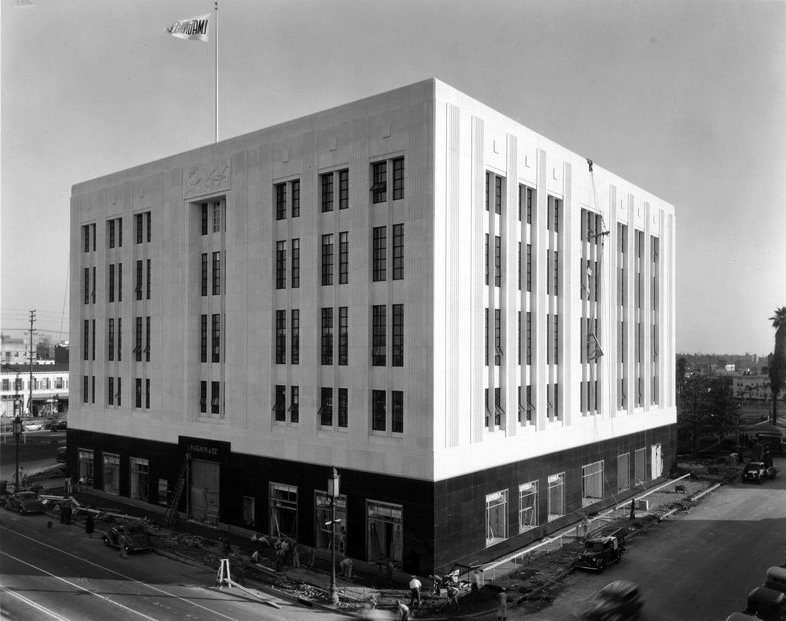 Accordingly, the Post Office announced plans in 1950 for a $12 million expansion, including an adjoining five-story parcel post building and other structures as well. 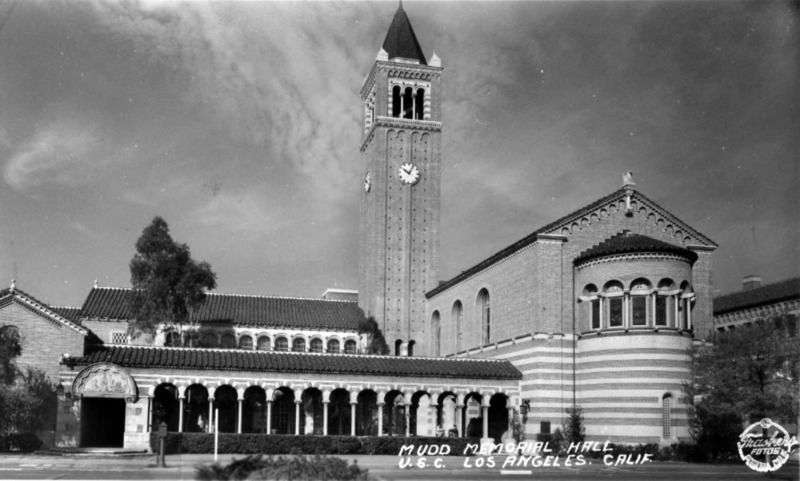 (1938)#^*^ – Postcard view showing the Mudd Memorial Hall on the campus of University of Southern California. (1939)* - Exterior view of Mudd Memorial Hall and its tower at U.S.C., designed by architect Ralph C. Flewelling. 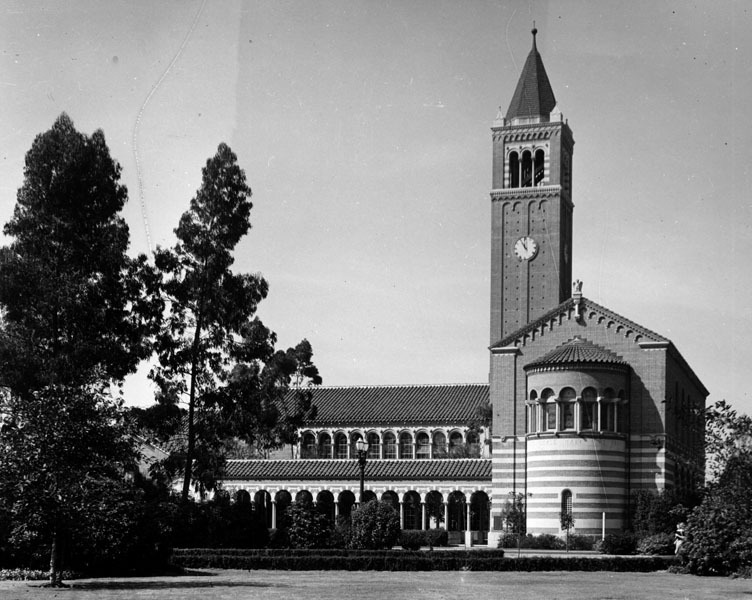 (1939)* - Side view of Mudd Memorial Hall and clock tower, built in 1929. 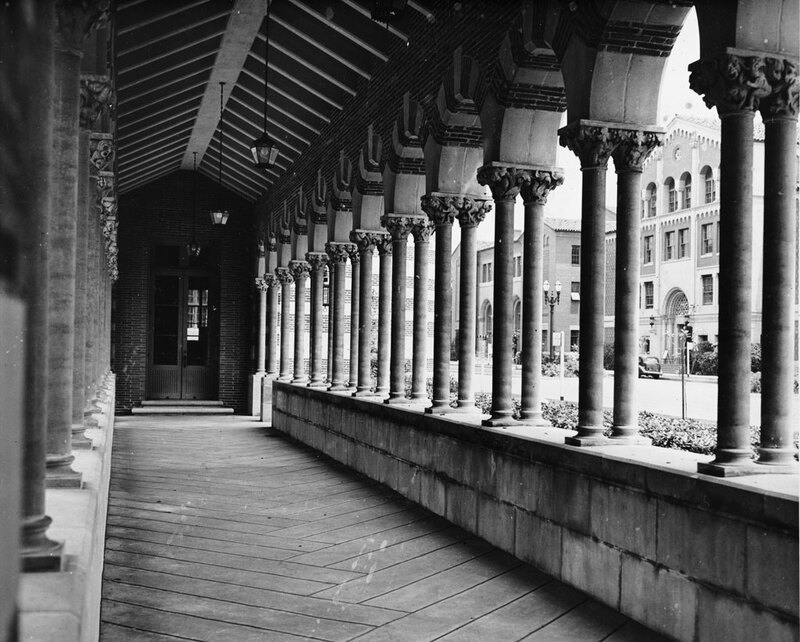 (1946)^^ - View of arched walkway at Mudd Memorial Hall. Click HERE to see more in Early Views of U.S.C. 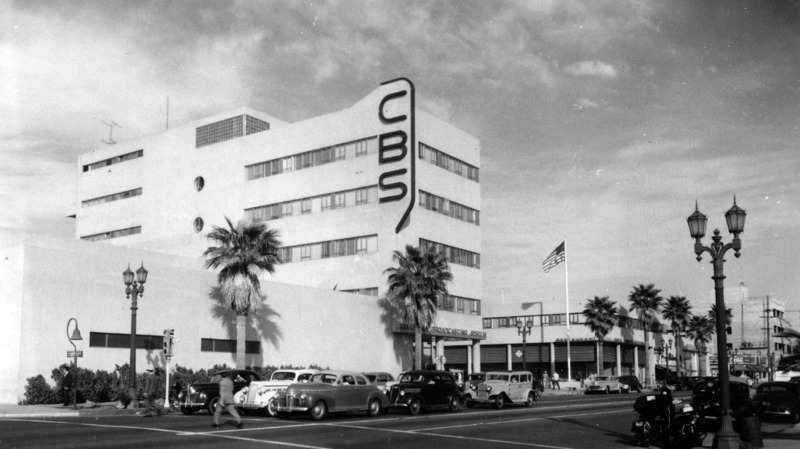 (1938)**^ - Grand Opening of CBS West Coast Headquarters on Sunset Boulevard. 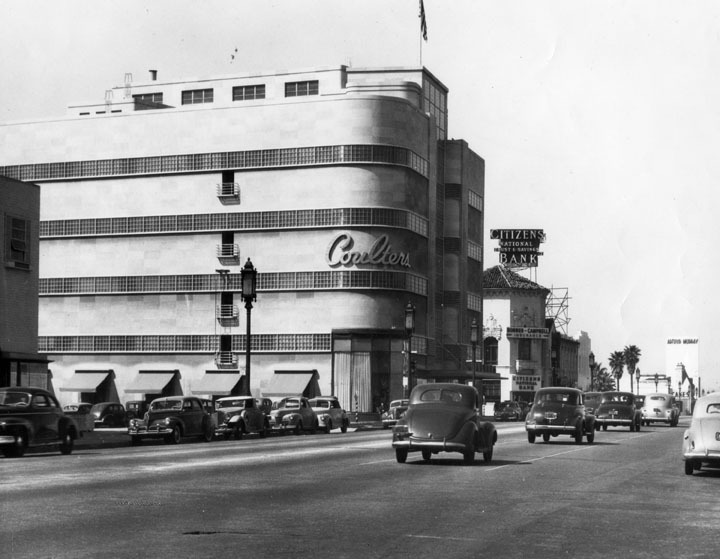 (1938)^*# - Daytime view looking toward the northeast corner of El Centro Ave and Sunset Boulevard showing the newly constructed CBS Columbia Square. (ca. 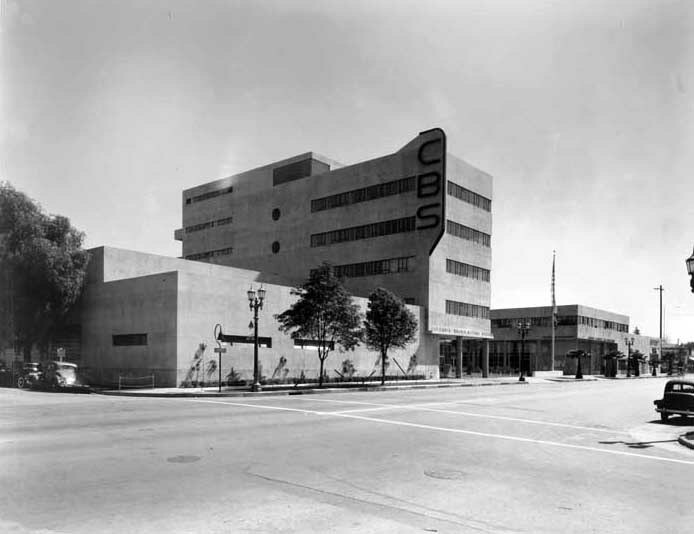 1938)* - Exterior view of the CBS Columbia Square building, 6121 Sunset Boulevard. 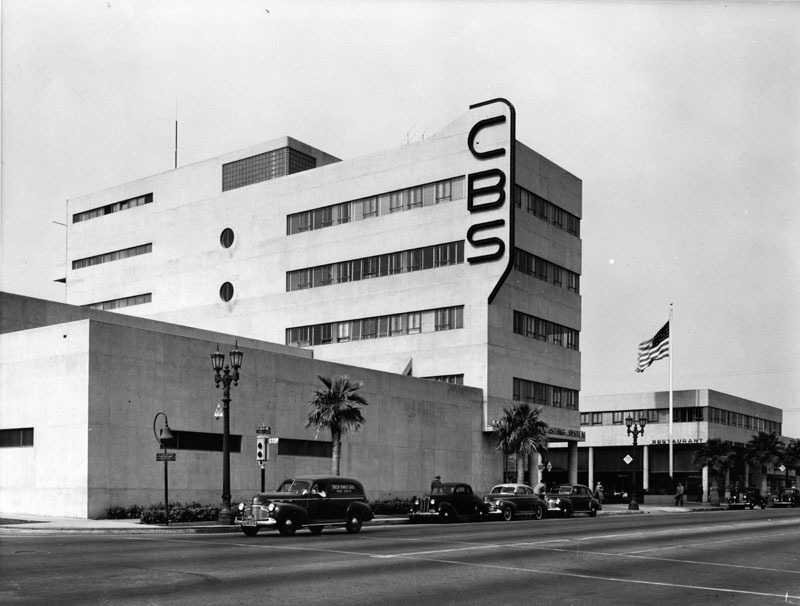 (1939)* - Exterior view of the CBS Columbia Square building located at 6121 Sunset Boulevard. 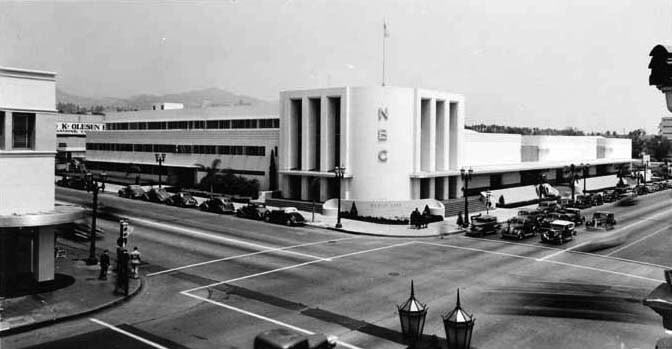 It was built on the site of the Nestor Studios, the first movie studio in Hollywood. 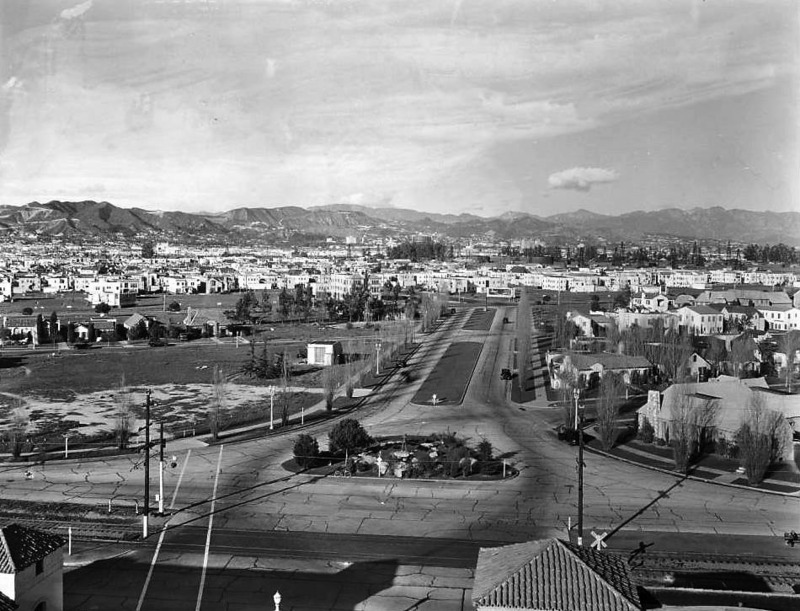 (1939)#* – View looking northeast from the intersection of El Centro and Sunset Boulevard showing Columbia Square. Note the El Camino Real marker on the corner at left. Click HERE for contemporary view. (ca. 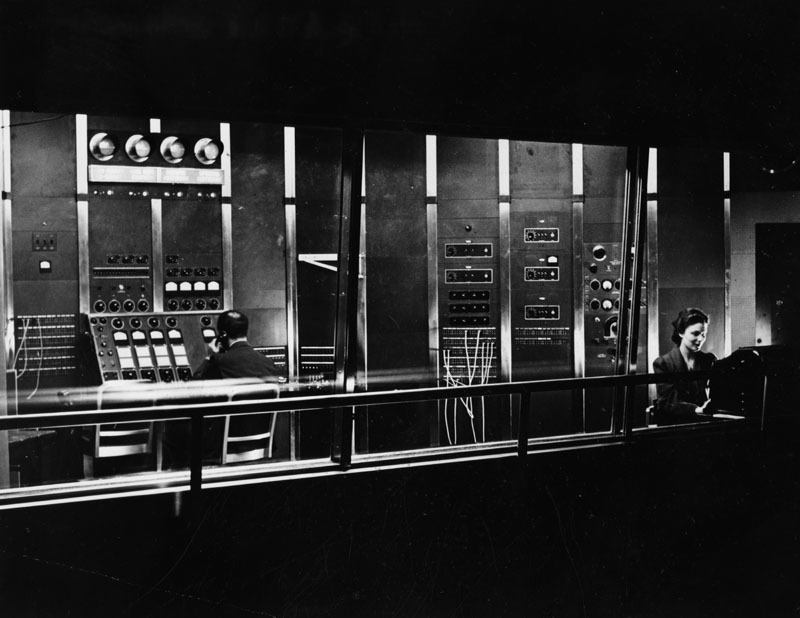 1939)* - Man sitting at the master control point of CBS, Hollywood Radio Center. Woman is operating the teleplex, an electric typewriter. 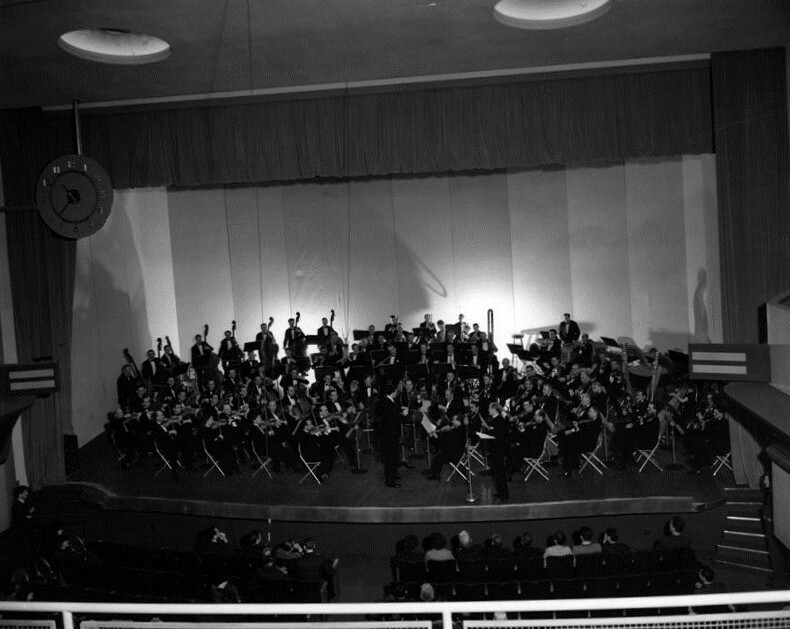 (1939)* - The Los Angeles Philharmonic Orchestra performs on a stage to an audience at the CBS Columbia Square building for a KNX radio broadcast. 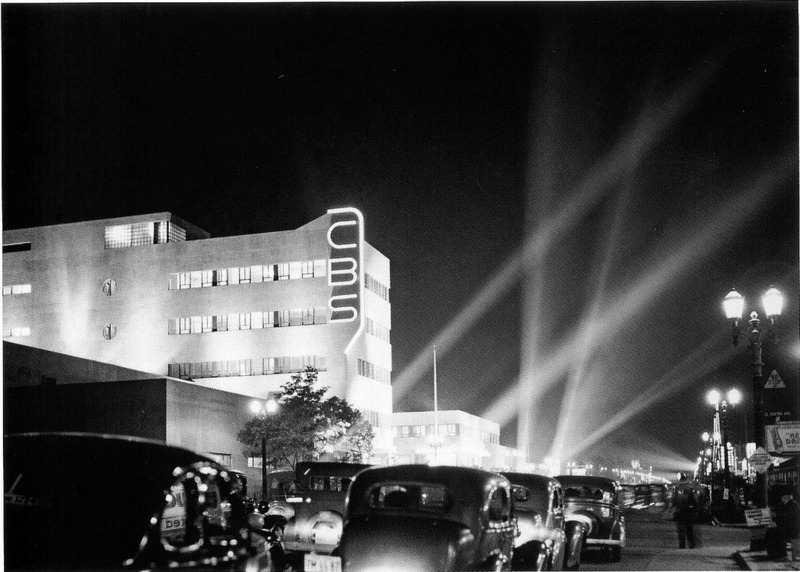 (1939)* - A night view, with neon signs lit, of the exterior of the studio of CBS radio and its L.A. affiliate KNX. In 2005, KNX moved into new studios in the Miracle Mile neighborhood on L.A.'s Wilshire Boulevard which it shares with CBS Radio stations KFWB, KTWV, and KRTH. 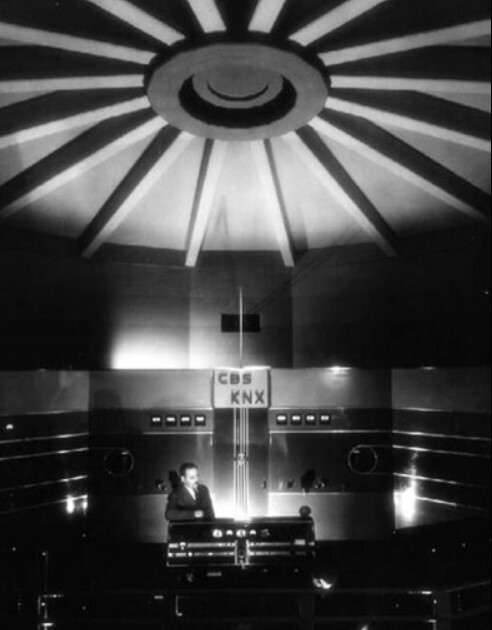 KNX was the last radio station to operate in Hollywood. (ca. 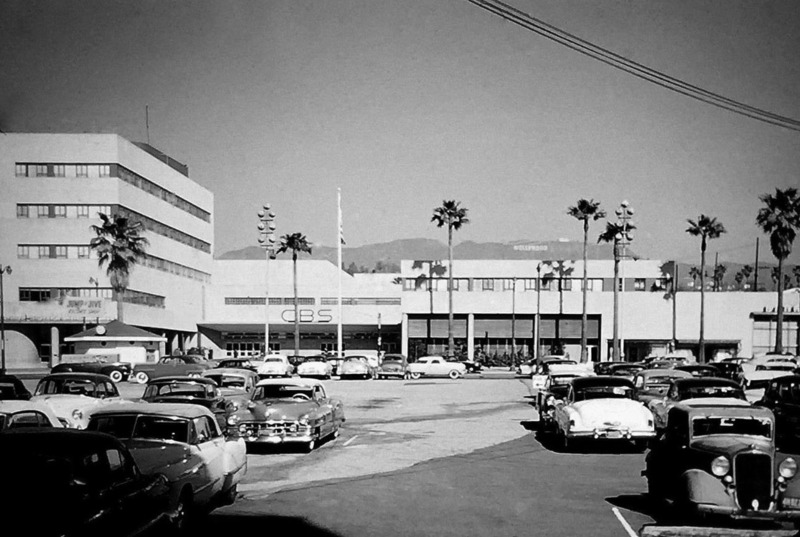 1951)#^* – View of CBS Columbia Square looking north from the Gower Gulch shopping center, close to where Denny’s currently is at Sunset and Gower. The Hollywood Sign is seen in the distance. 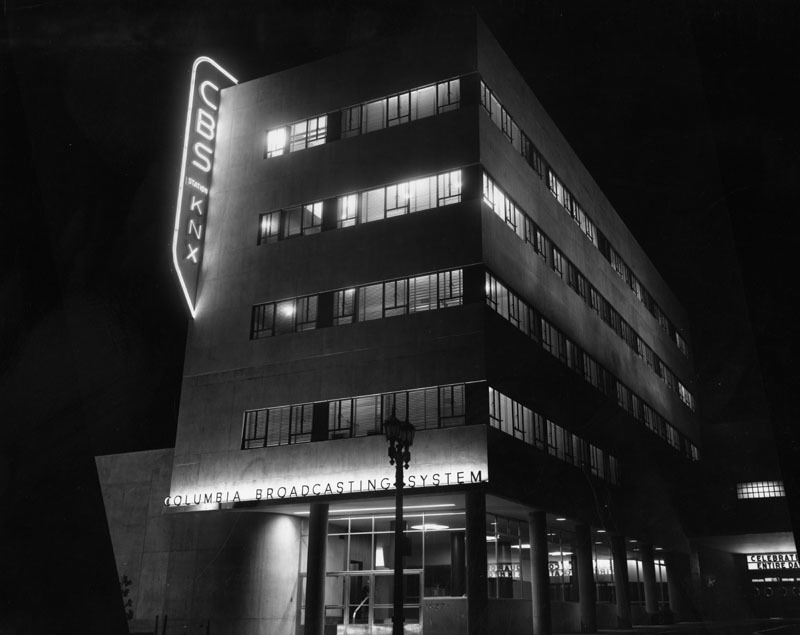 From 1938 to 2007, Columbia Square was home of CBS's L.A./west coast radio/tv operations. The historic site is currently under redevelopment. (ca. 1938)^*# - Postcard view looking north on Vine Street at Sunset Boulevard. On the northeast corner stands the newly constructed NBC Radio City. 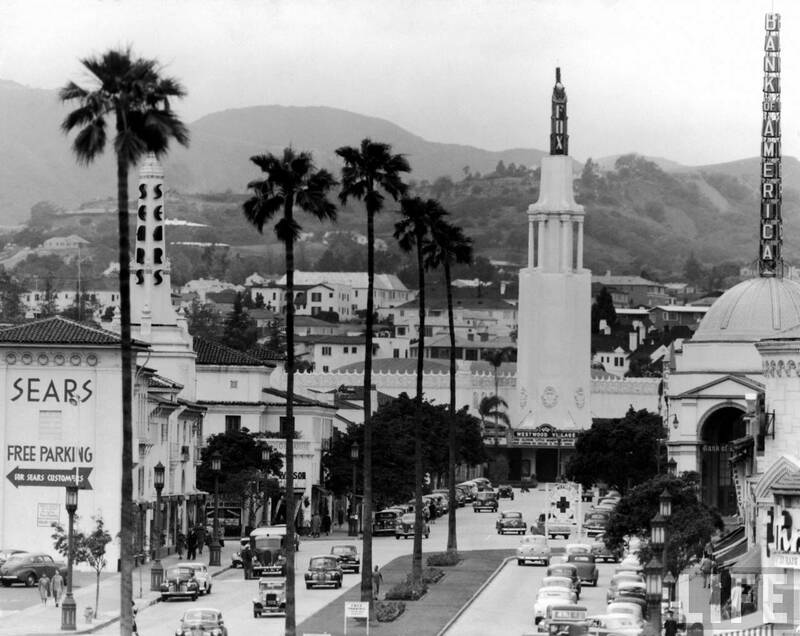 Visible signs in the background include (L to R): Tropics, Hollywood Recreation Center Bowling, Plaza Hotel, The Broadway-Hollywood, Taft Building, and the Brown Derby. 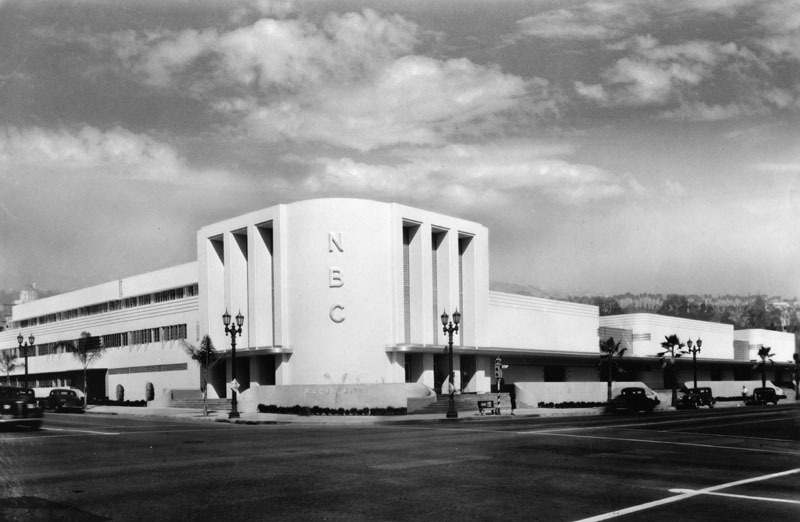 (1938)* - An exterior view of NBC's studio, Hollywood Radio City, located in Hollywood on the northeast corner of Sunset Blvd. and Vine St. 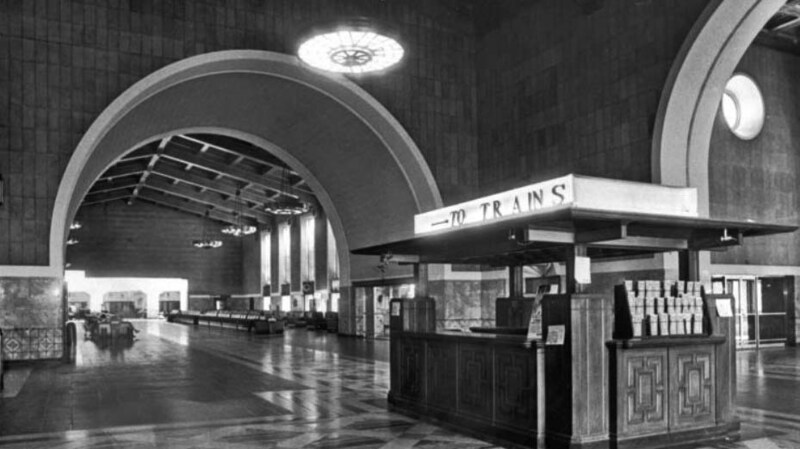 The art deco station was designed by John Austin and was built in 1938. (ca. 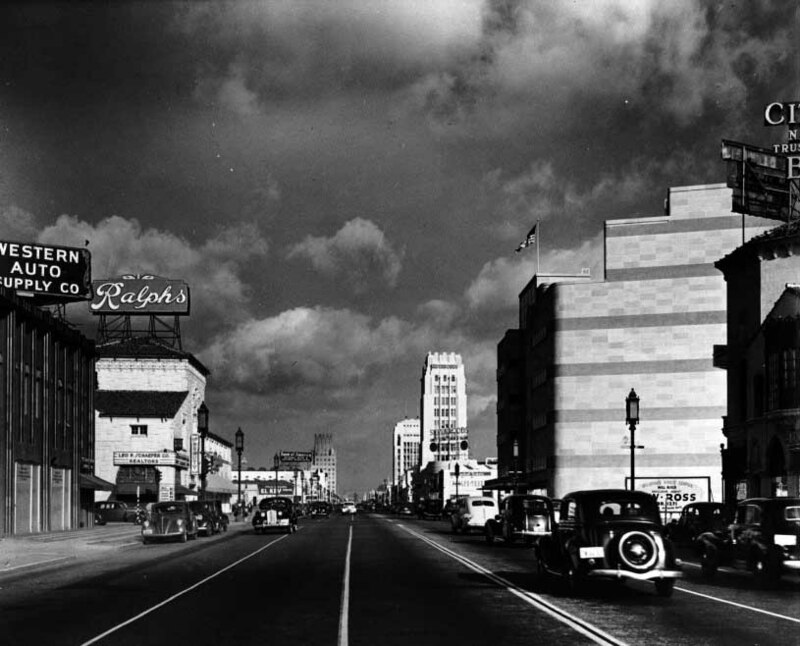 1940)^*# - View looking northeast at the intersection of Sunset Boulevard and Vine Street. NBC's Radio City stands on the corner. Note the ornate dual-lamp streetlight at the bottom of photo. Click HERE to see more in Early Views of LA Streetlights. (ca. 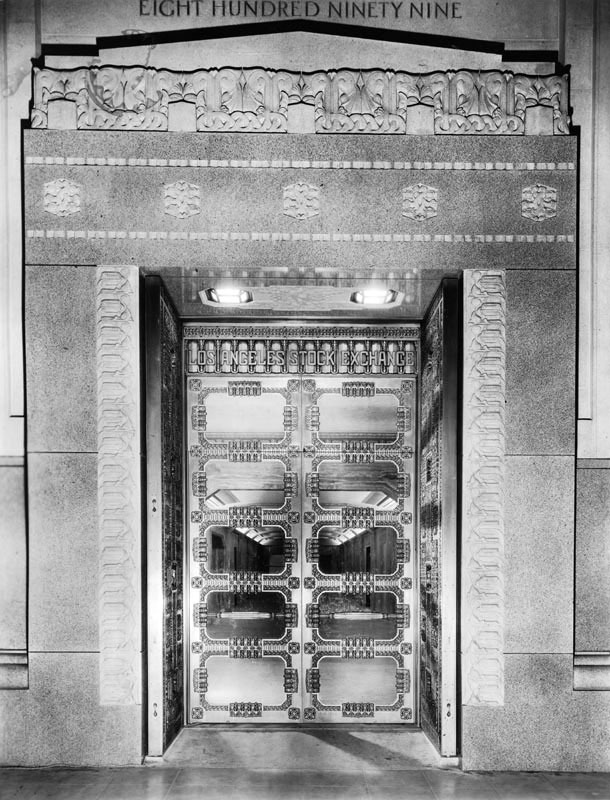 1940)#* - Interior view of the front entrance to the studios at NBC Hollywood Radio City. The floor-to-ceiling glass tile windows allows natural light to fill the very large open spaced lobby. (ca. 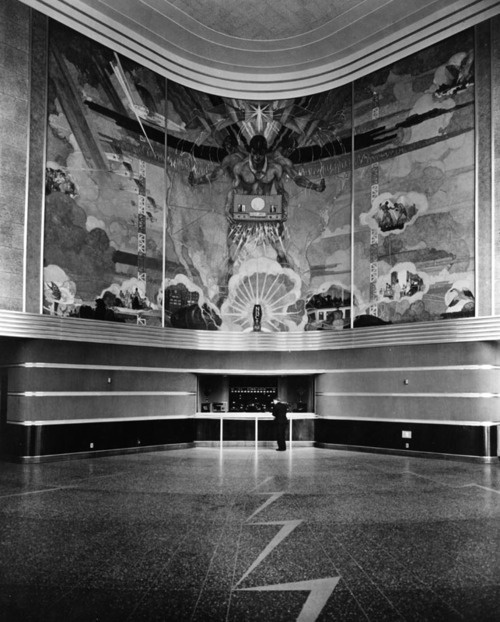 1938)^*#^ - View of the lobby of NBC’s Hollywood Radio City dominated by a 25 x 40 ft. mural painted by Ed Trumbull of New York. Beneath mural is the master control room. 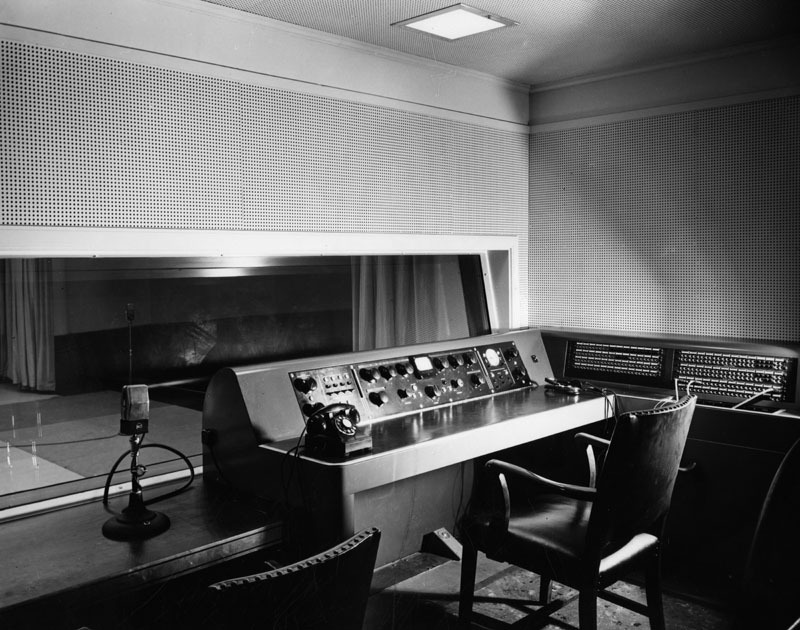 (1938)* - Engineer's control room in NBC's Hollywood Radio City. (1940s)#* - View of a man walking on Sunset in front of the streamline moderne NBC Radio City building. 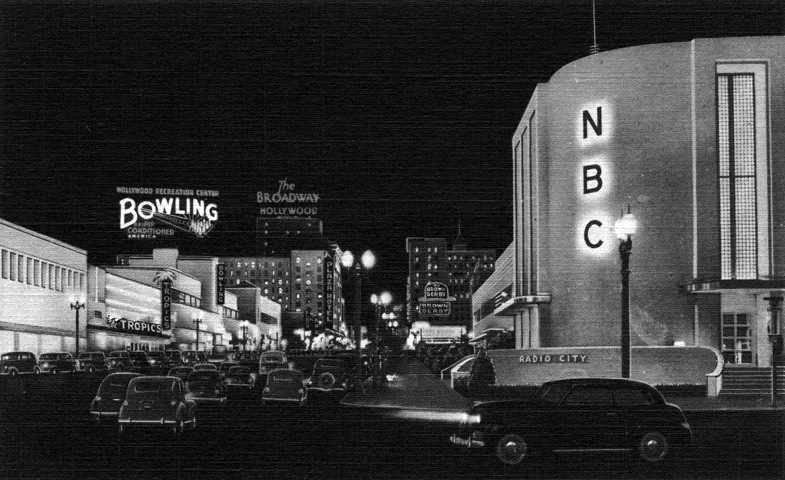 (1940s)**^ - Dusk view looking at the northwest corner of Sunset and Argyle Avenue showing a lit-up NBC Hollywood Radio City building. (ca. 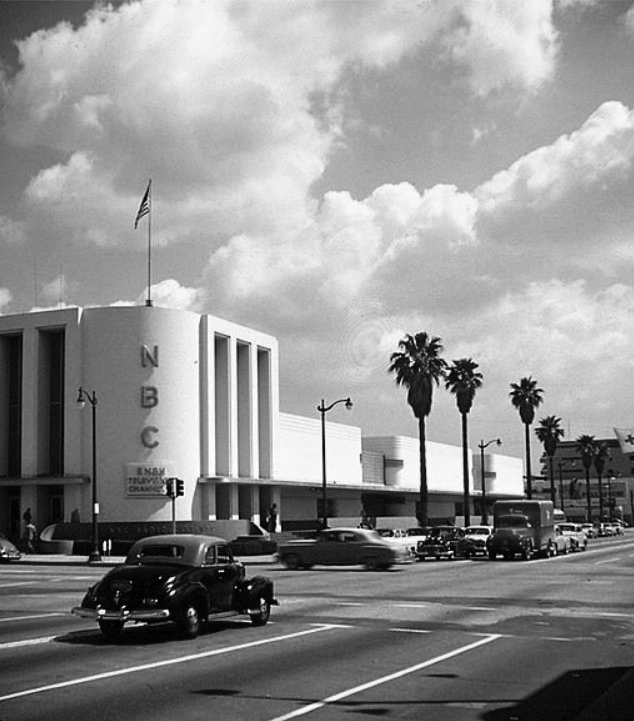 1948)+^^ - View looking east on Sunset Boulevard at Vine Street showing the NBC radio studios on the southeast corner. 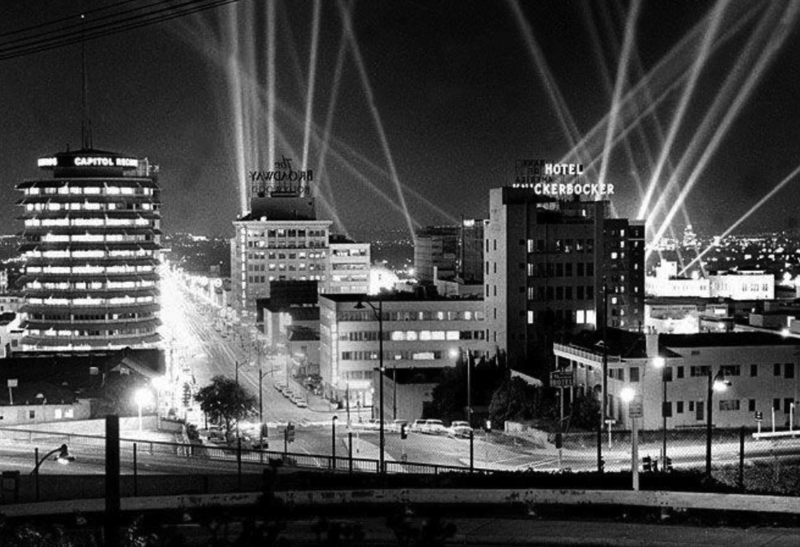 (1938)#^* - View of Wilshire Boulevard as it passes through MacArthur Park. The Westlake Theatre Sign stands out in the background. (ca. 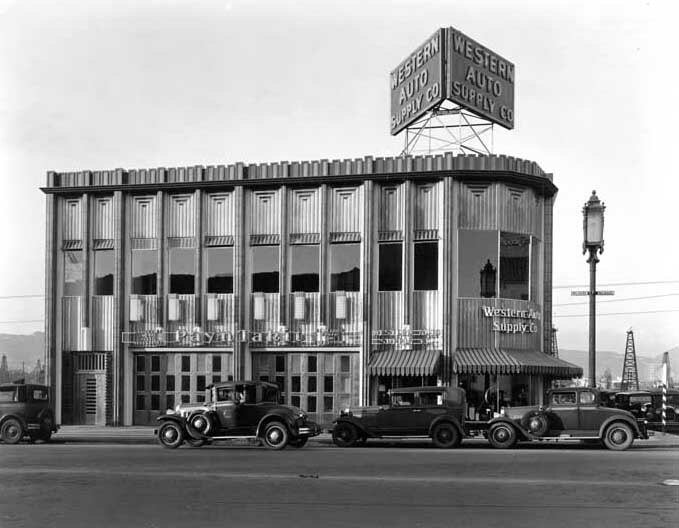 1930)* - An exterior view of the Westlake Theatre located at 638 South Alvarado Street. The marquee advertises a Fox Picture big studio preview, and the words "Hot News" with Neil Hamilton. 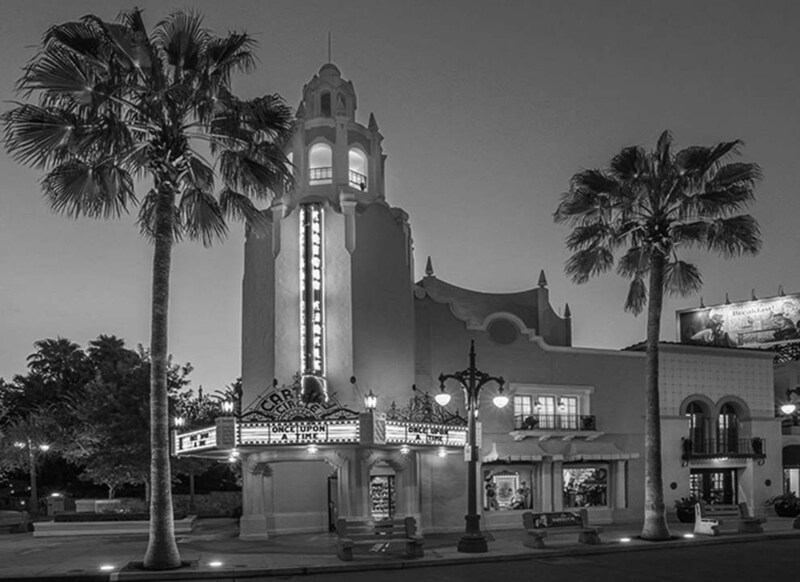 The theatre was designed by Richard D. Bates Jr. in a Mission/Spanish Colonial Revival style. The façade features cast stone Churrigueresque detailing of floral patterns and cartouche relief. The interior contains Adamesque references and murals by Anthony Heinsbergen. 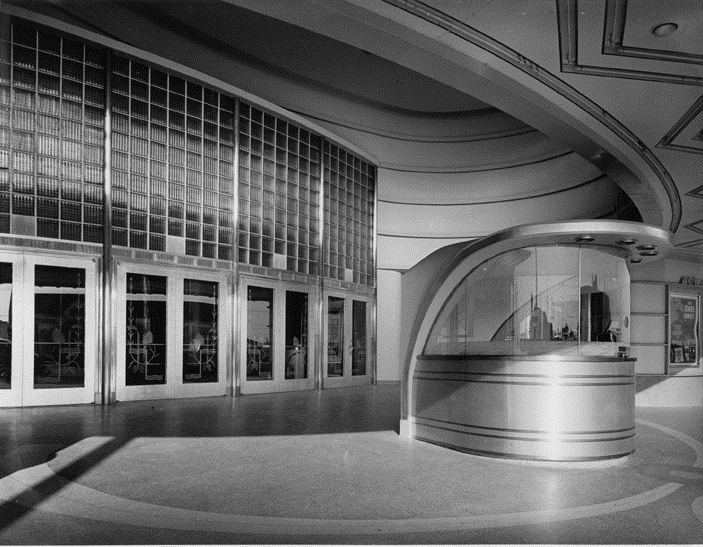 Exterior renovations in 1935 were designed by the noted theater architect S. Charles Lee and included an Art Deco ticket kiosk made of red-painted metal, unvarnished aluminum and glass, new lobby doors, and terrazzo sunburst paving in the foyer and front sidewalk. 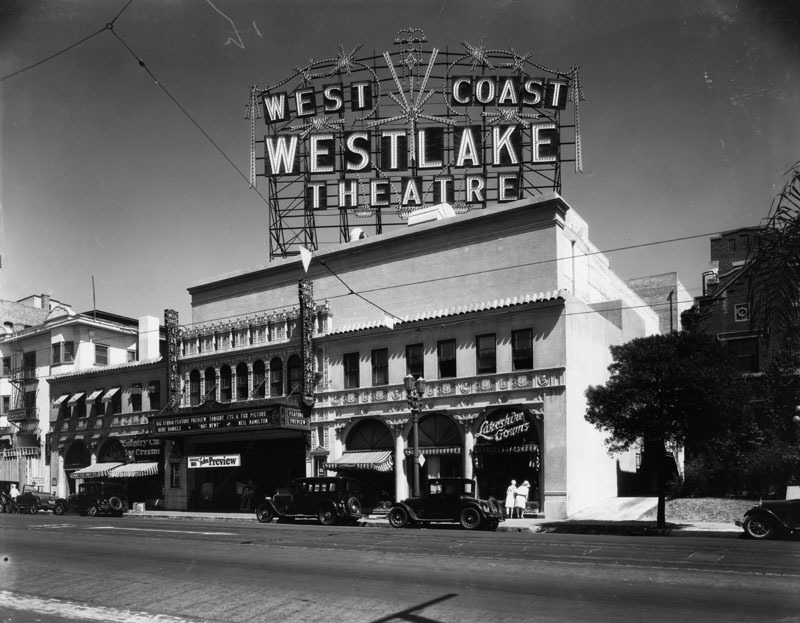 (1937)* - Exterior view of the Spanish Baroque style West Coast Westlake Theatre. 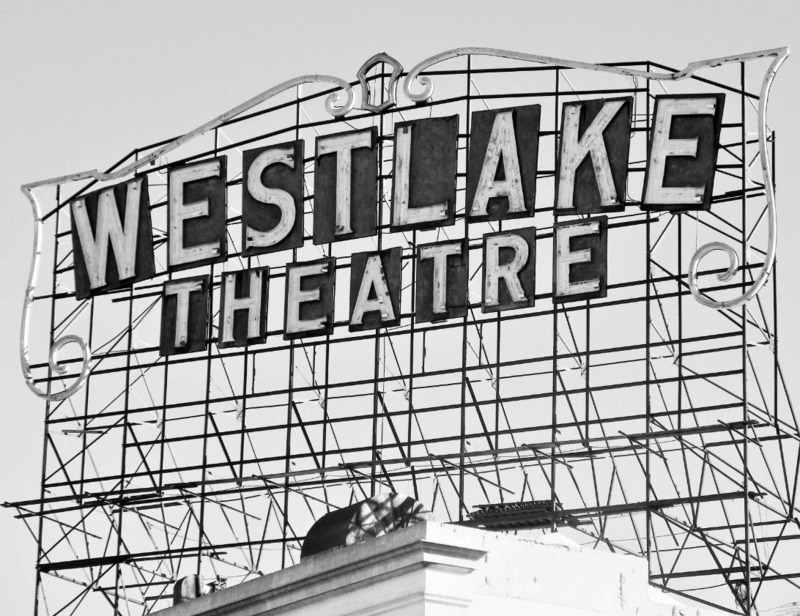 The Westlake was operated as a first-run movie theater from 1926 until the 1960s. As the neighborhood's demographics changed, the theater was sold to Metropolitan Theatres Corp., which showed Spanish-language or Spanish-subtitled movies. In 1991, the building was sold to Mayer Separzadeh, who converted the theater into a swap meet. 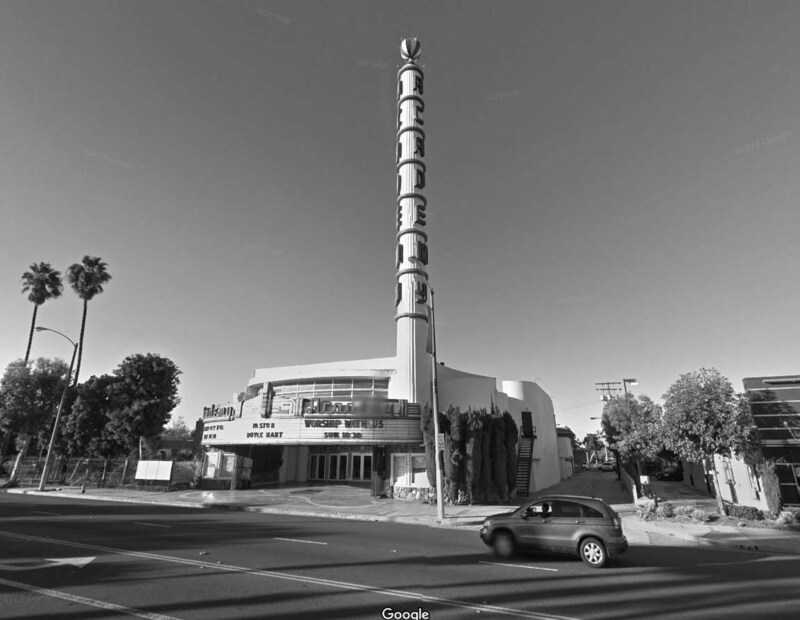 To protect the building from drastic changes, the building was declared Los Angeles Historic-Cultural Monument No. 546 in September 1991 (Click HERE to see complete listing). The theater was listed on the National Register of Historic Places in 2009. The theatre’s large roof-top sign has not only survived, it is still in use, as it was renovated in 1987. (1939)^*# – View looking toward the southeast corner of Wilshire Boulevard and New Hampshire Avenue showing the new I. Magnin Department Store still under construction. This site was once occupied by the Cole House. 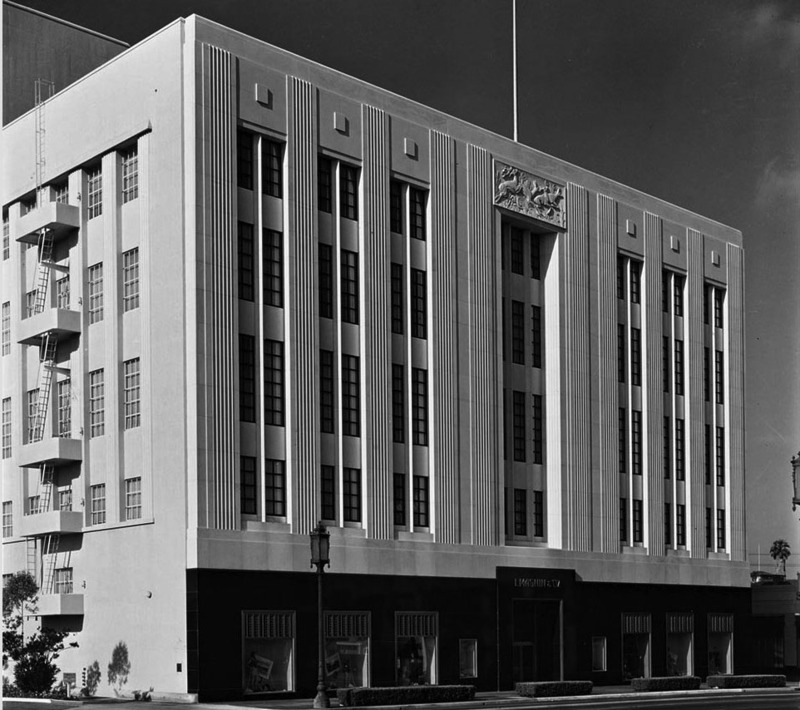 I. Magnin & Company was a San Francisco based high fashion and specialty goods luxury department store. Over the course of its existence, it expanded across the West into Southern California and the adjoining states of Arizona, Oregon, and Washington. In the early 1870s, Dutch born Mary Ann Magnin and her English husband Isaac Magnin settled in San Francisco. Mary Ann opened a shop in 1876 selling lotions and high-end clothing for infants. Later, she expanded into bridal wear. As her business grew, her exclusive clientele relied on her for the newest fashions from Paris. 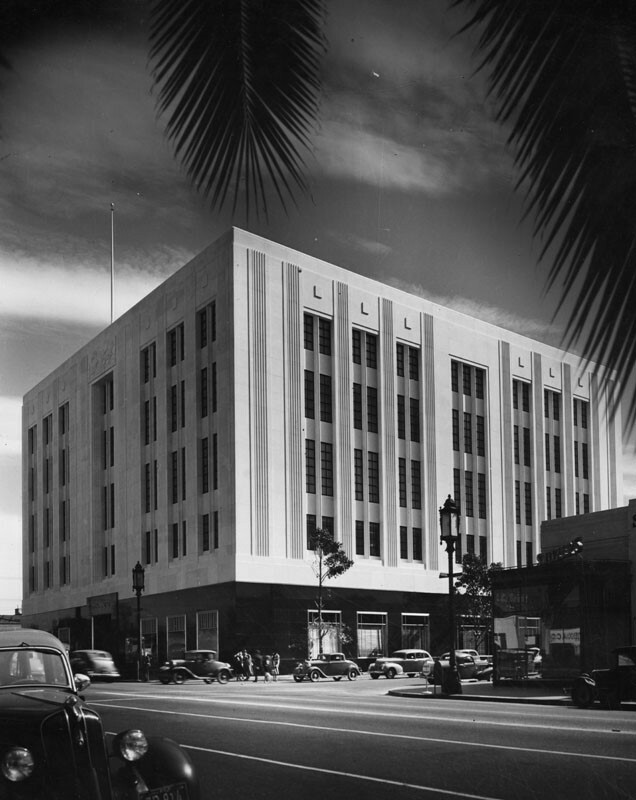 (1939)* - View showing the new six-story Magnin department store, designed in a white modern classic style, rising from a black marble base - located at 3240 Wilshire Boulevard. 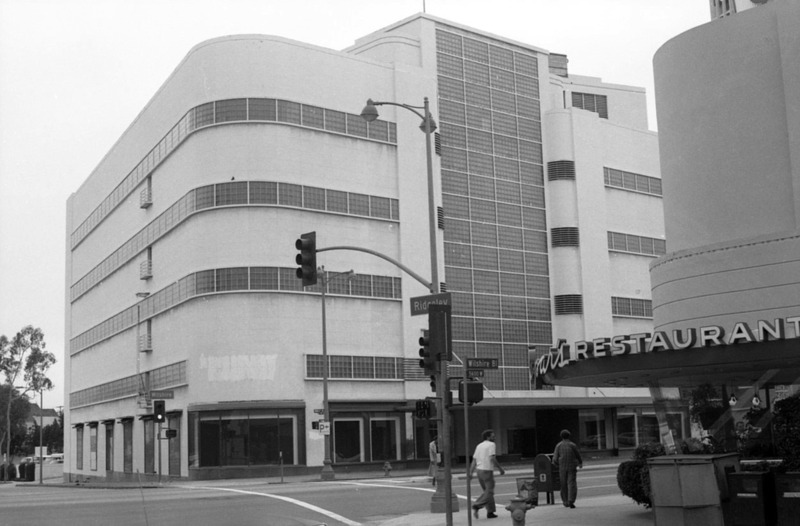 I. Magnin opened its Wilshire store in 1939. 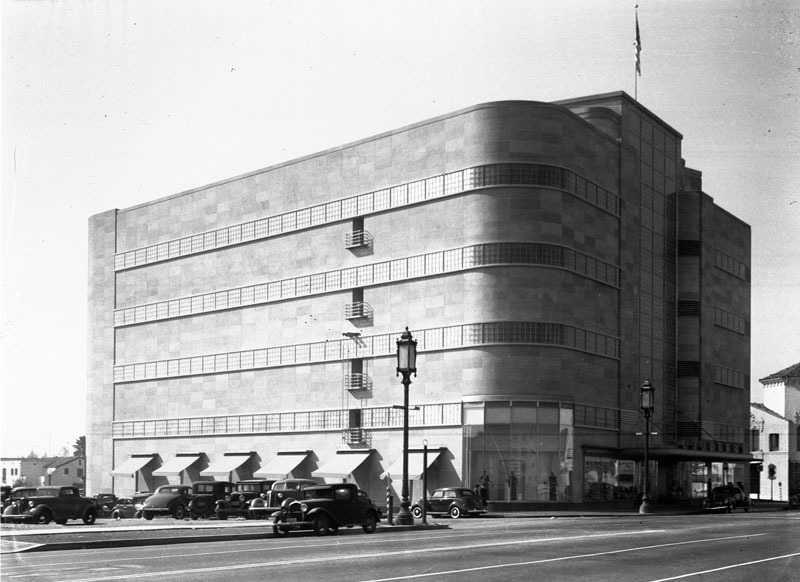 The new high end department store was located just three blocks west of Bullock's Wilshire and became a formidable competitor. 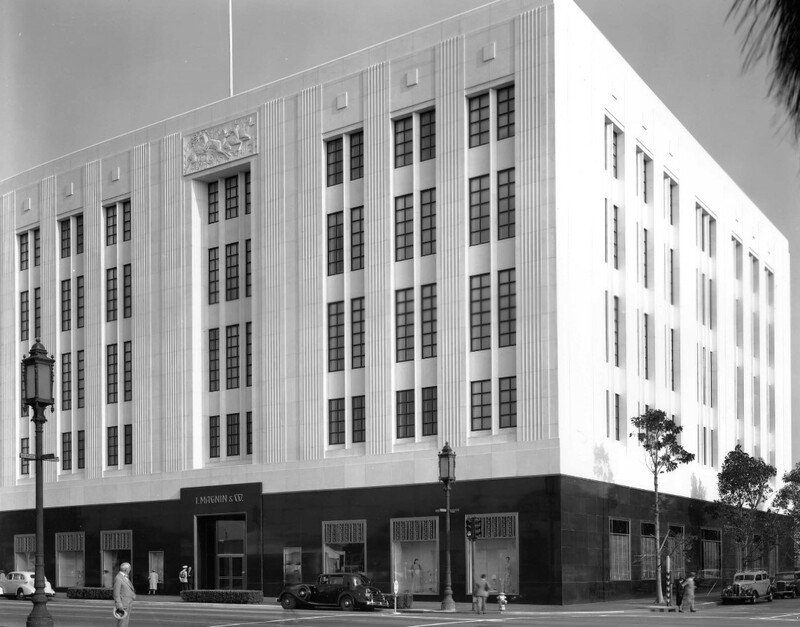 (1939)* - Corner view of I. Magnin & Co. department store at the corner of Wilshire and New Hampshire. 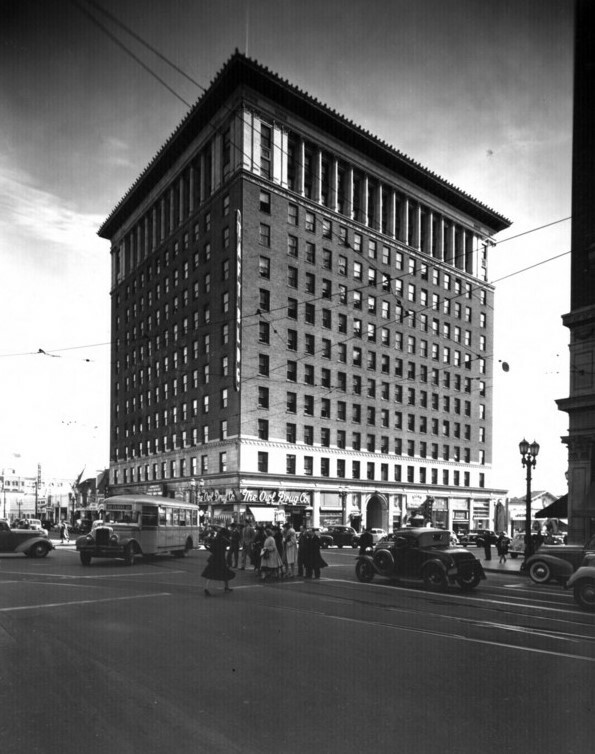 (1939)^#^ - The I. Magnin & Co. building during its first year of operations. 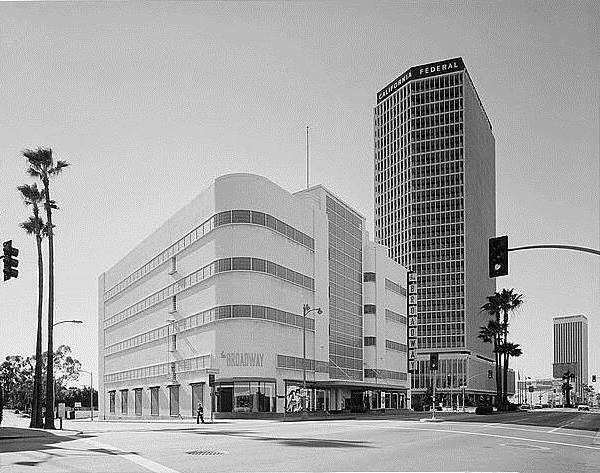 (1949)*++ - Close-up view looking southwest showing the east side and front of the I. Magnin building on Wilshire Blvd. 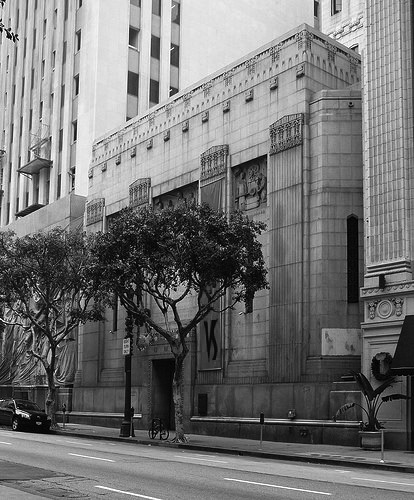 In 1991, the I. Magnin & Co. Building was declared Los Angeles Historic Cultural-Monument No. 534 (Click HERE for listing). (2015)##^^^ – View showing the I. Magnin Building as it appears today at the southeast corner of Wilshire Boulevard and New Hampshire Ave. It is now called the Wilshire Galleria. (1930s)**#* - View of the Western Auto Parts store at the northwest corner of Wilshire and Hauser Blvds. 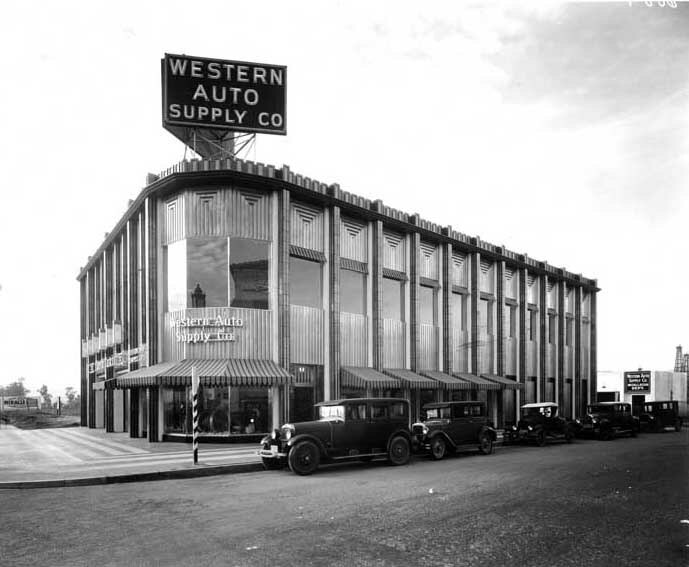 The Western Auto Parts store was designed by Carl Lindbom and completed in 1931. It is the current location of a IHOP restaurant. Click HERE for contemporary view. 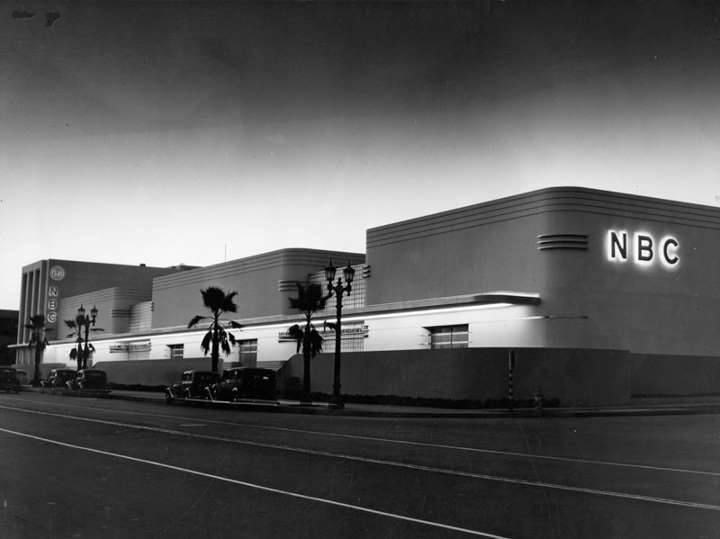 (1930s)^*# - View of the northwest corner of Wilshire and Hauser showing the Western Auto Supply Co. Building. Several cars are seen parked on Hauser Blvd. 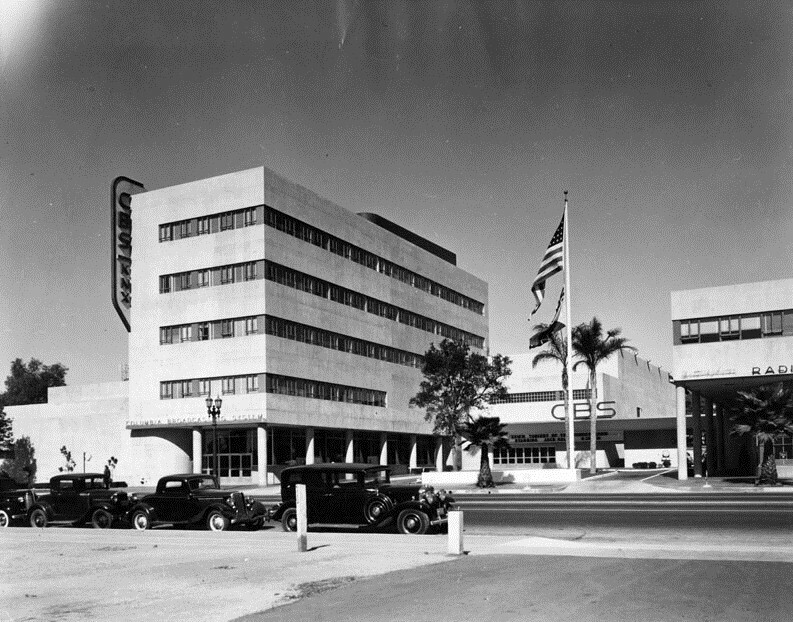 (1930s)^*# - View looking north of the Western Auto Supply Co. Building located at 5655 Wilshire Boulevard. A tall "Wilshire Special" streetlight stands on the corner (Wilshire and Hauser). In the distance also stands an oil derrick. Click HERE to see more Early L.A. Streetlights. 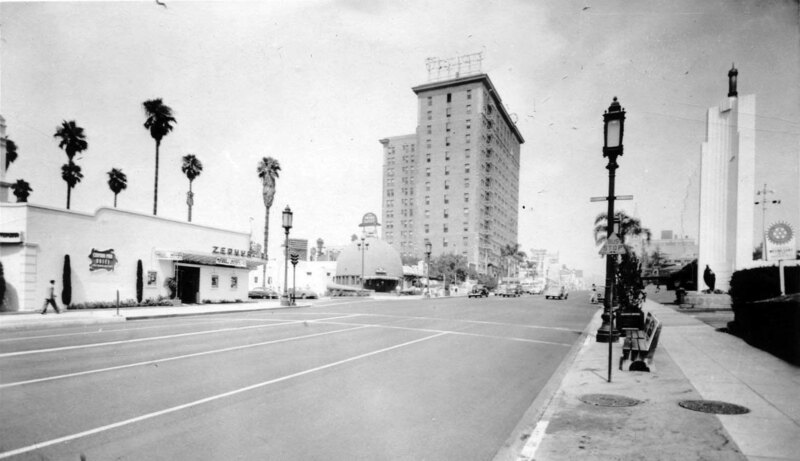 (1938)^^ – View facing east on Wilshire Boulevard at Hauser Boulevard. 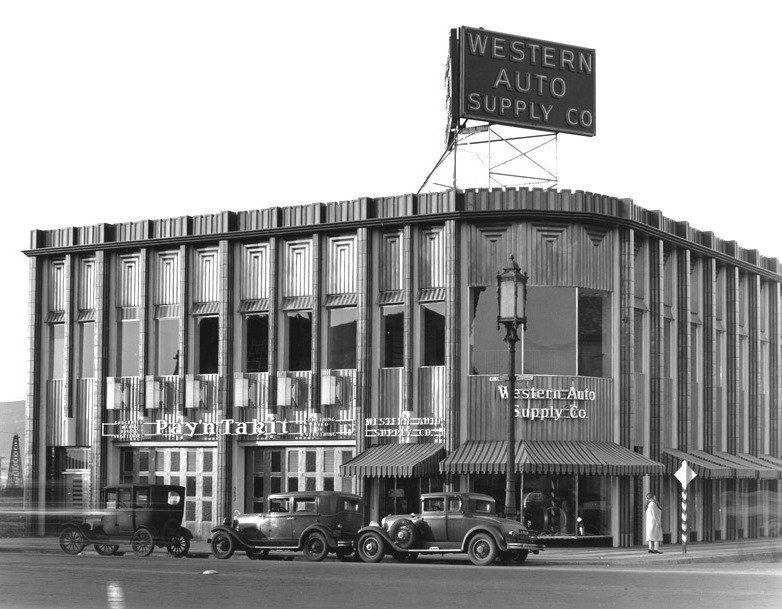 Western Auto Supply Company, Ralph’s Supermarket, and Bank of America (left); Coulter’s Department Store (right). 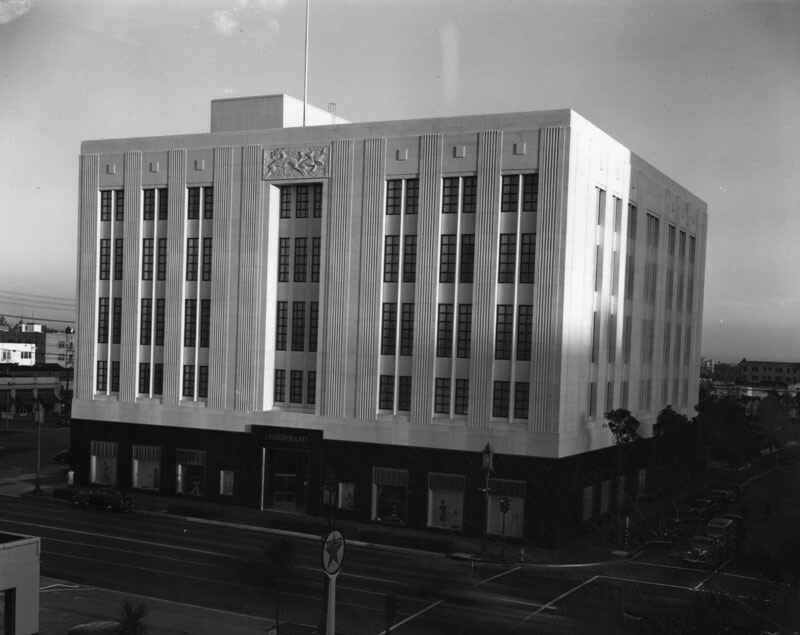 (1939)* - Exterior view of the new Coulter's Department Store at 5600 Wilshire Boulevard (in the "Miracle Mile"). (ca. 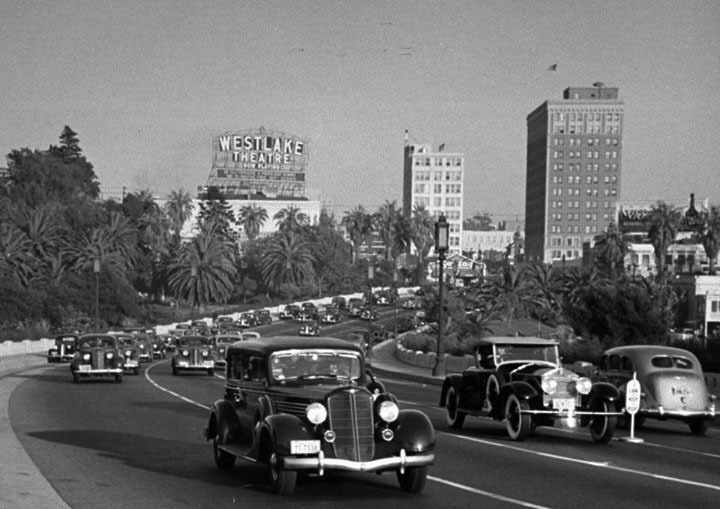 1940)* - View looking west on Wilshire Boulevard. 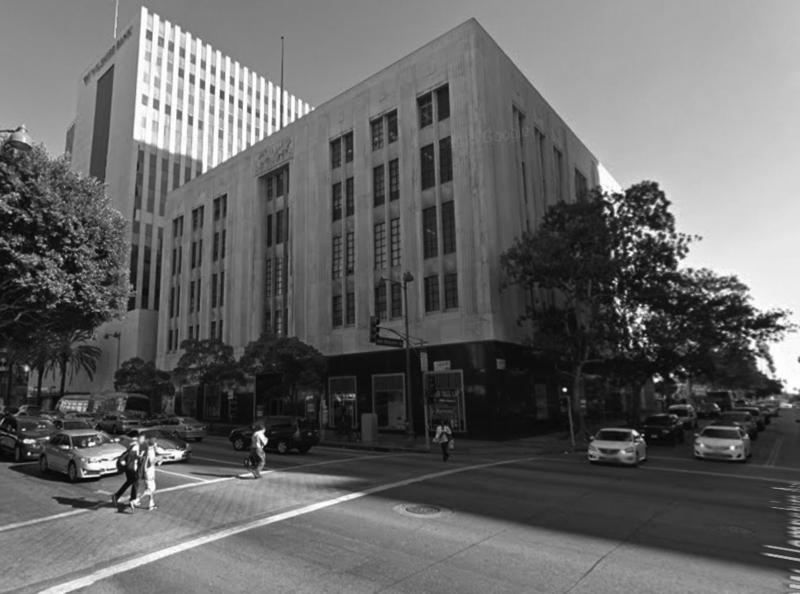 The Coulter Building is seen on the southwest corner of Hauser and Wilshire. Citizens National Trust & Savings Bank may also be seen on the right. (ca. 1970)^^ - View looking toward The Broadway Department Store (formerly Coulter’s). 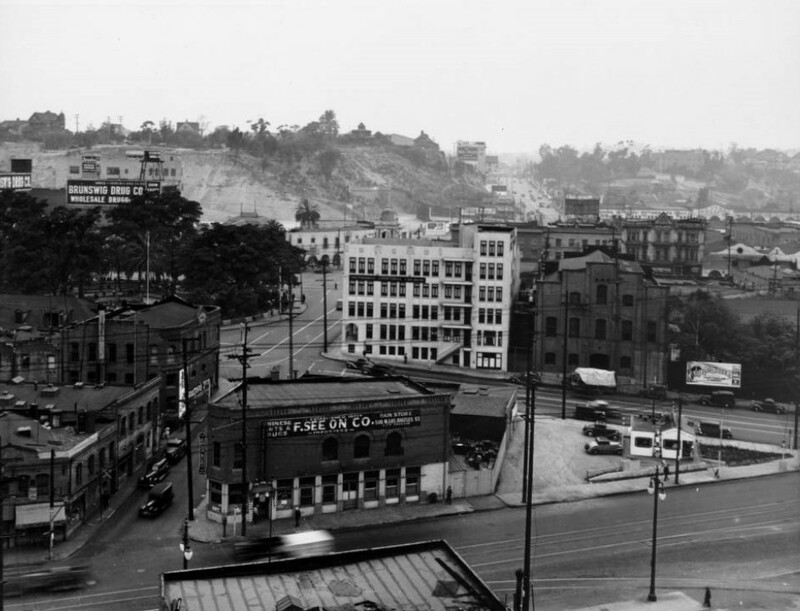 In the right foreground is DuPar’s Restaurant, NW corner of Wilshire and Ridgeley. In the 1970s, the store changed hands and became a Broadway. (1972)^*#* - The Broadway Department Store (formerly Coulter’s), at 5600 Wilshire Boulevard. To the right is the California Federal Bank Building, constructed in 1963, where Citizens National Trust & Savings Bank once stood. After the building was demolished in 1980, the site remained vacant until the late-2000s, when a 5-story mixed-use structure was built. Click HERE for contemporary view. 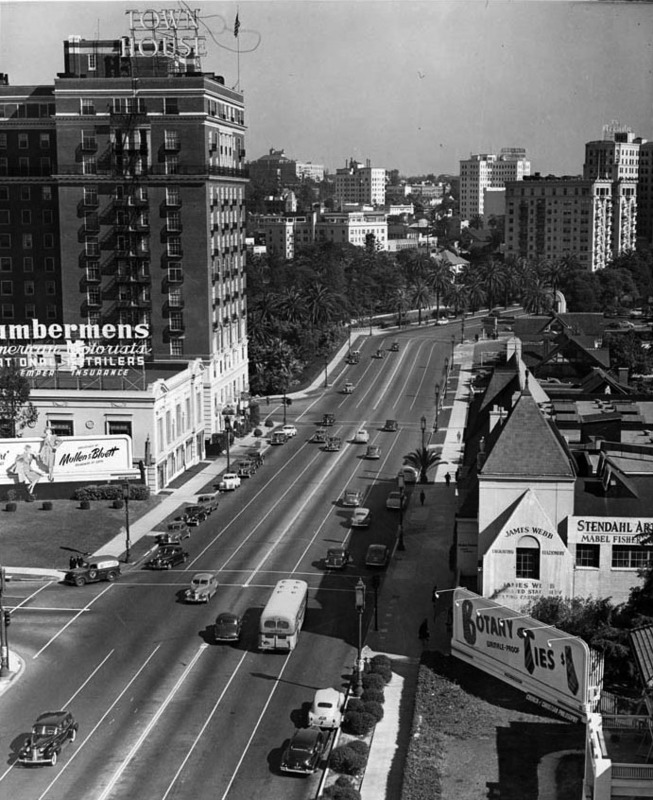 (1940)^^ - View looking west on Wilshire Boulevard showing the Town House Building at the northwest corner of Wilshire and Commonwealth, across the street from Lafayette Park (lower-right). The Bullock's Wilshire tower can be seen at upper-left and Simons Drive-in Restaurant at lower-left, on the southwest corner of Hoover and Wilshire. 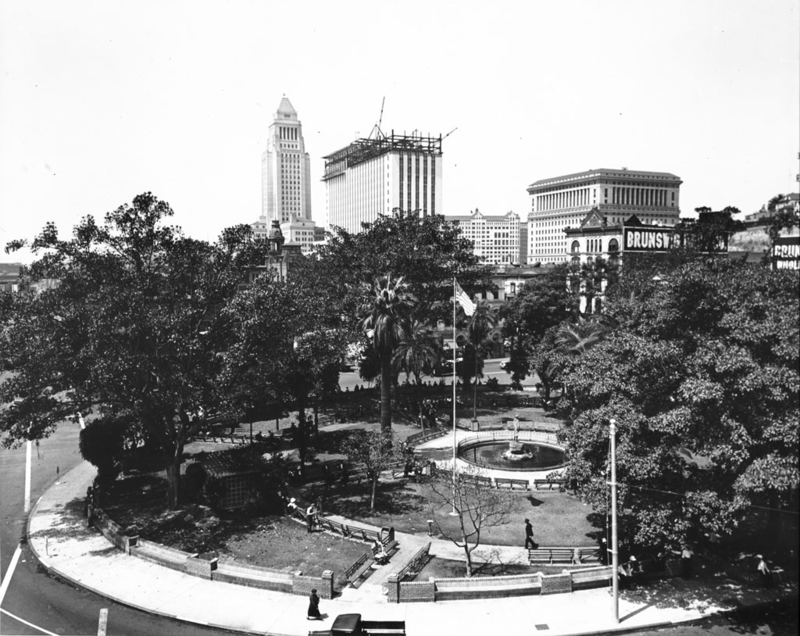 Clara R. Shatto donated 35 acres of land that now makes up Lafayette Park to the City of Los Angeles in 1899. The land consisted of tar seeps and oil wells and Shatto requested that it be developed into a park. Shatto was the wife of George Shatto, then-owner of Santa Catalina Island. (1940s)##** – View showing a crowd of people standing in front of the Town House as if waiting for a parade. 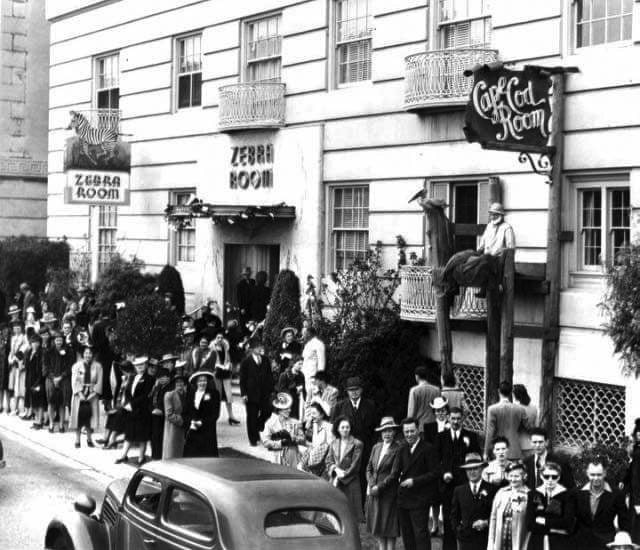 The entrance to the Zebra Room Nightclub is seen in the background with a sign for the Cape Cod Room on the right. The Cape Cod Room was the hotel’s coffee shop and lasted until 1993. The hotel’s main restaurant was the Garden Room. 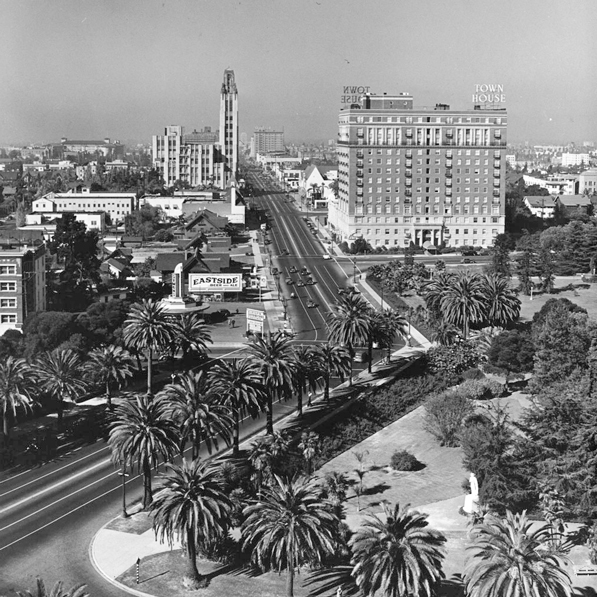 (1946)^*# – View looking northeast on Wilshire Boulevard toward Lafayette Park. 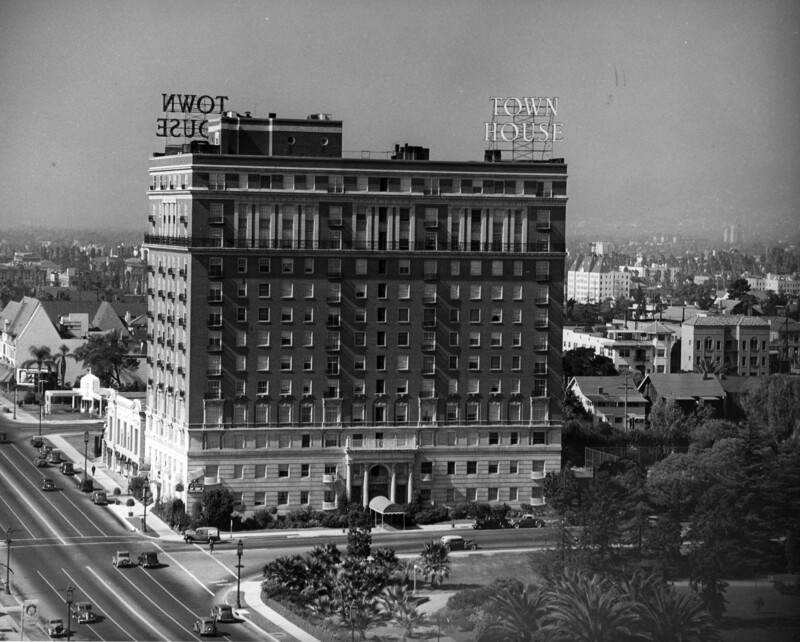 The Town House at 2959-2973 Wilshire Blvd. is seen across the street from the park. (ca. 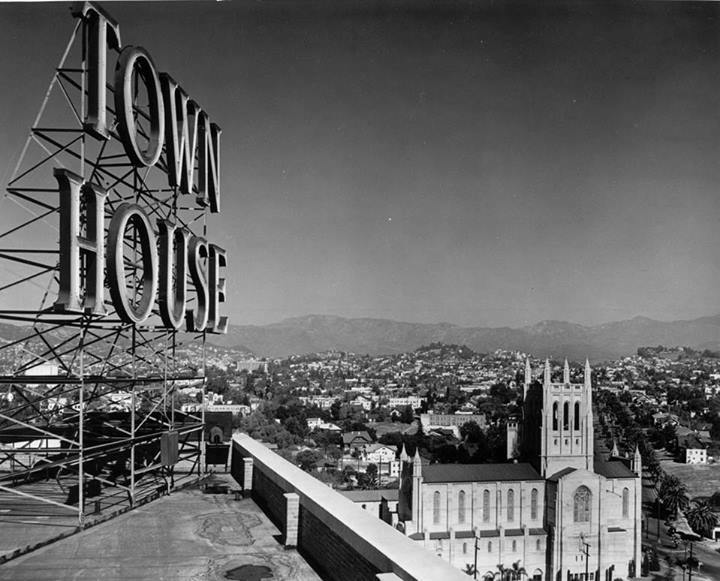 1940s)**^# - View from the roof of the Town House looking north toward the Hollywood Hills. The First Congregational Church, 540 S. Commonwealth, is seen at the lower-right. 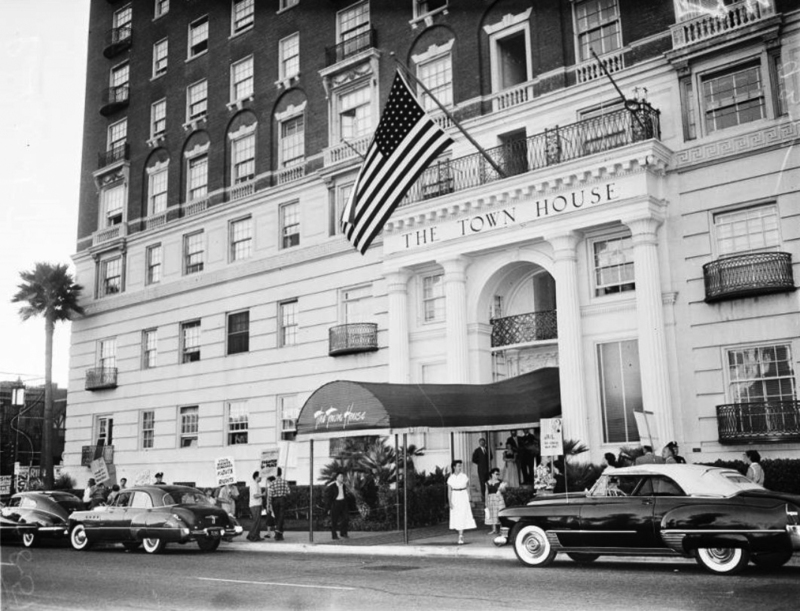 (1951)^^ – View showing the front entrance to the Town House. There appears to be a picket line in front of the building. (2008)*^ – View of the Town House looking northwest from the corner of Wilshire Boulevard and Hoover Street. 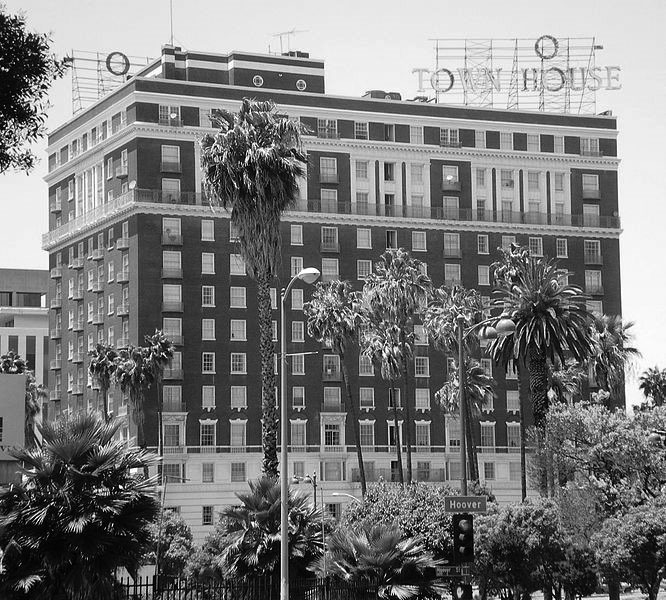 In 1997, the Town House was listed on the National Register of Historic Places, and in 1994 it was designated as Los Angeles Historic-Cultural Monument No. 576 (Click HERE to see complete listing). (ca. 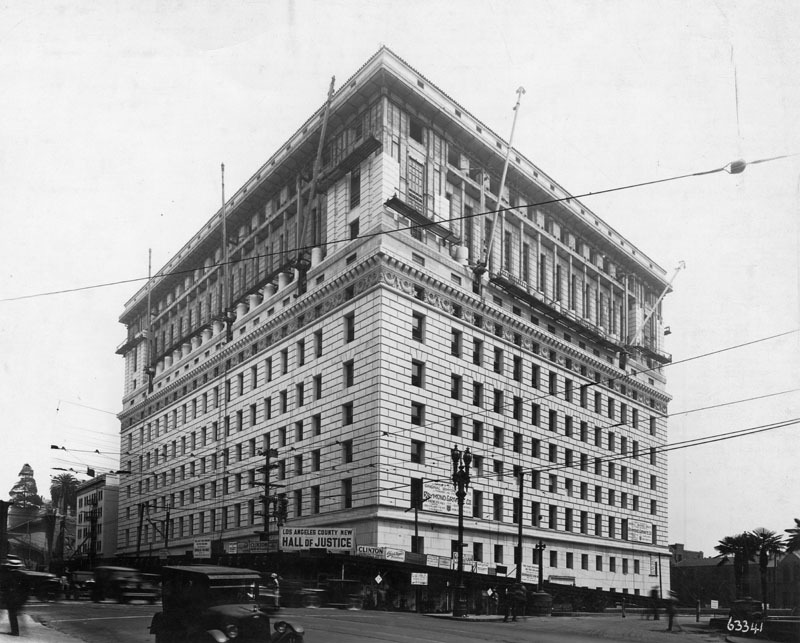 1923)* – View looking at the southeast corner of Hollywood and Vine showing the newly completed Taft Building. 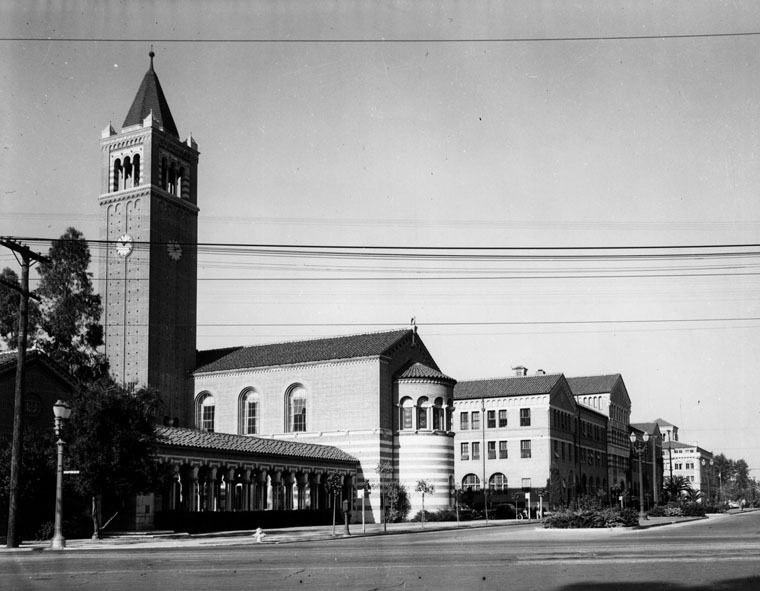 This was once the location of the Hollywood Memorial Church, the first Hollywood Methodist Episcopal Church. 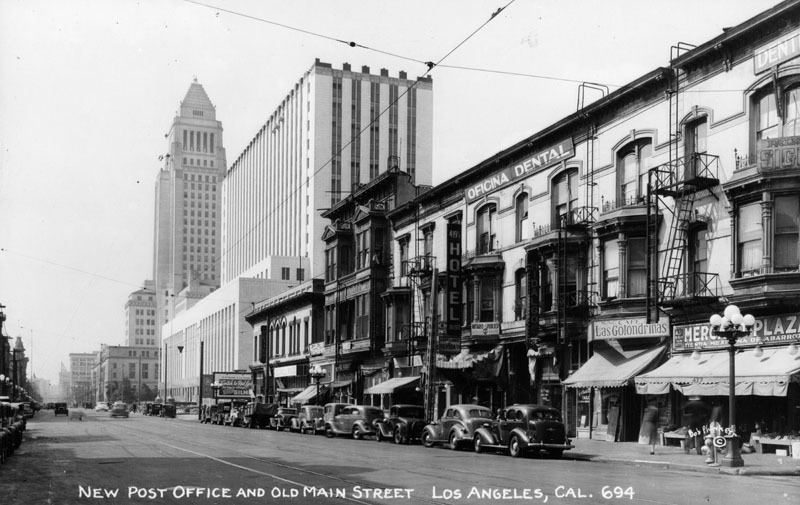 (1940s)^^ - View of the Taft Building at 1680 N. Vine Street, S/E corner of Hollywood and Vine. The Owl Drug Company occupies the street level corner space. An early model bus is pulling through the intersection as pedestrians are crossing the street. (1945)* - Postcard view of a crowd looking at the electric billboard on the Taft Building. 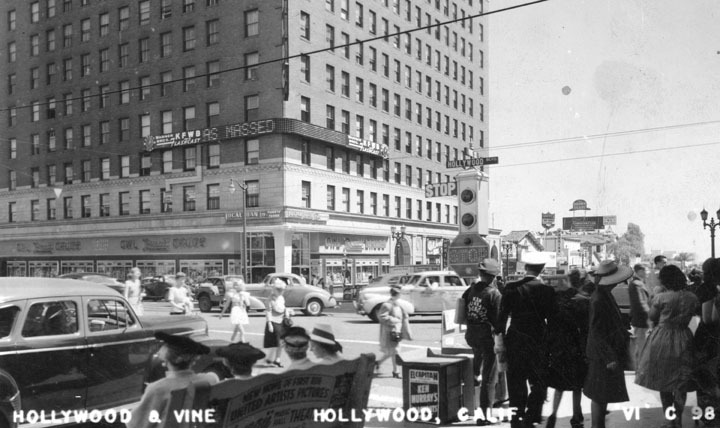 The view is from the north-west corner of Hollywood and Vine looking south-east. An early traffic sign is in the foreground and in the background the distinctive "hat" of the Brown Derby sign is visible. 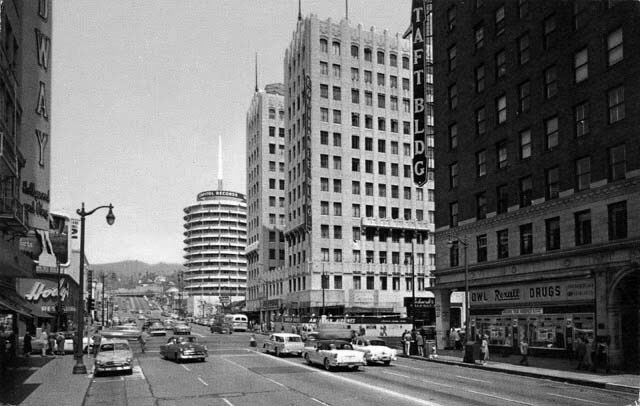 (1950s)*^^^* - View looking north toward the intersection of Hollywood and Vine. The four main buildings located on the corners of the intersection can be seen (L to R): The Broadway-Hollywood, Hody's Restaurant, Equitable Building, and the Taft Building. The iconic Capitol Records Building stands in the background. (ca. 1950s)* - View at dusk, with neon signs lit, looking northward on Vine Street from Selma Ave. 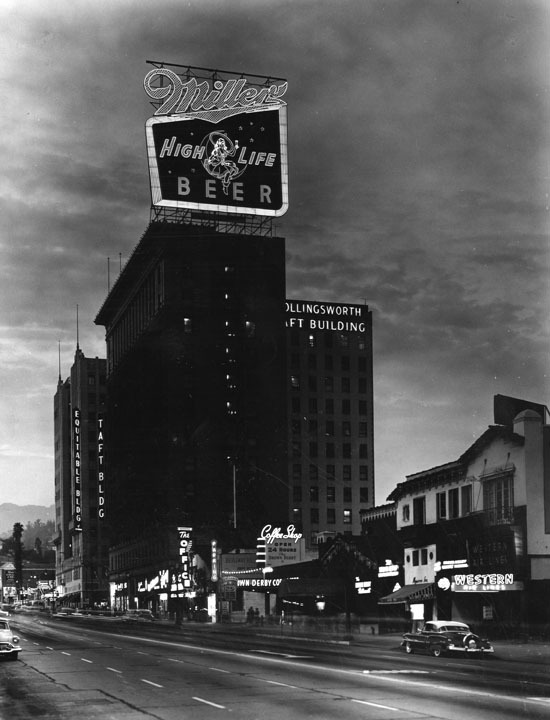 The Taft Building can be seen with the large Miller High Life signboard on its roof. Also seen are the: Broadway-Hollywood, Plaza Hotel, Mobilgas, Equitable Building, and the Brown Derby Coffee Shop. (ca. 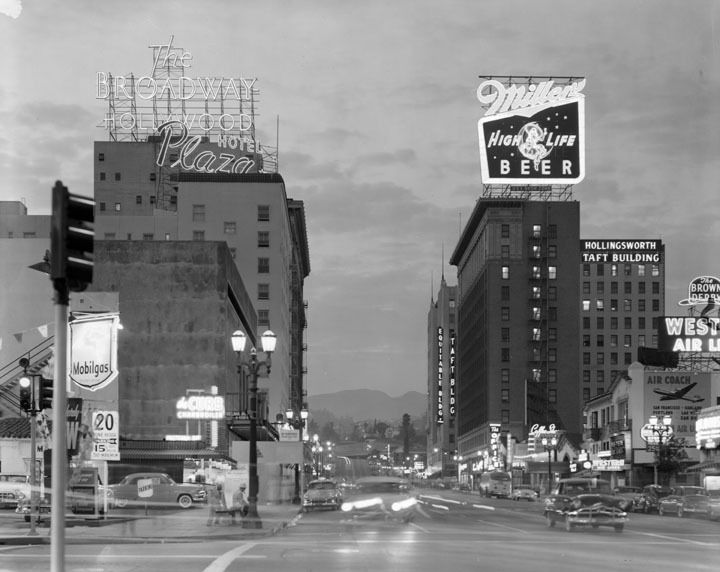 1950s)* - Closer view of the Taft Building with its very large neon sign for Miller High Life beer. 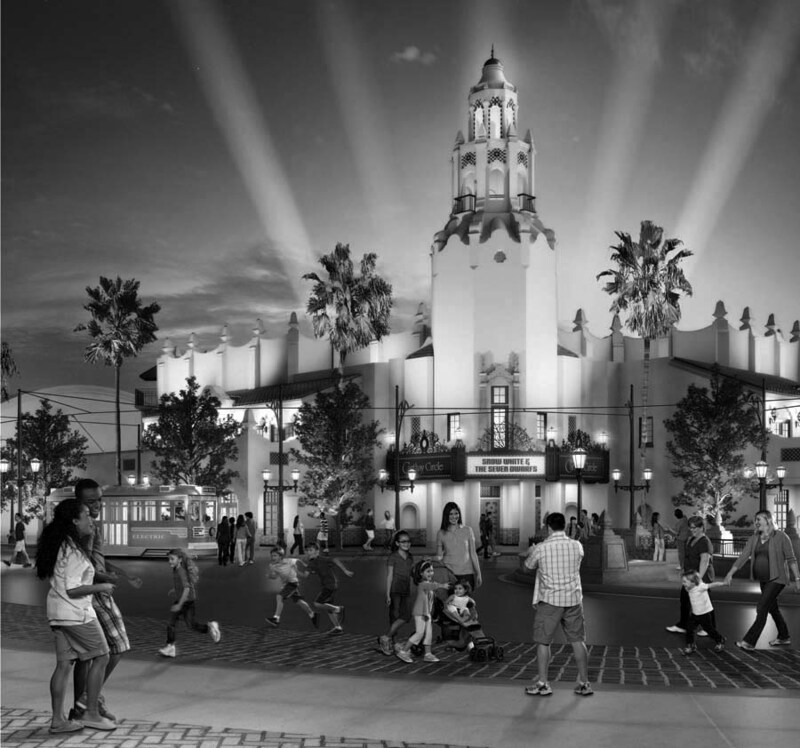 The Brown Derby is on the right. 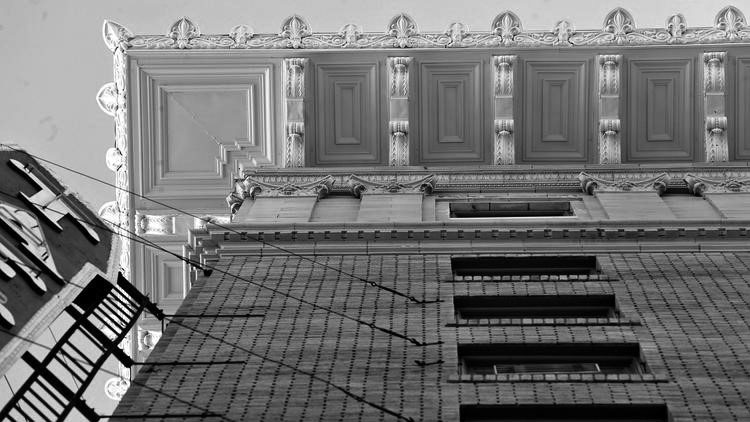 Architects of the Taft Building were Walker and Eisen. 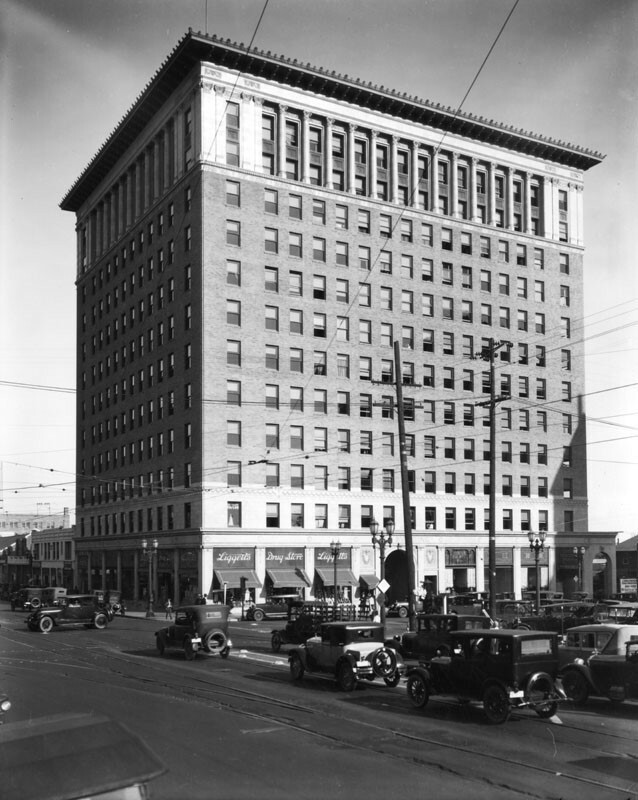 In 1999, the Taft Building and Neon Sign were designated Historic-Cultural Monument No. 666 (Click HERE to see complete listing). 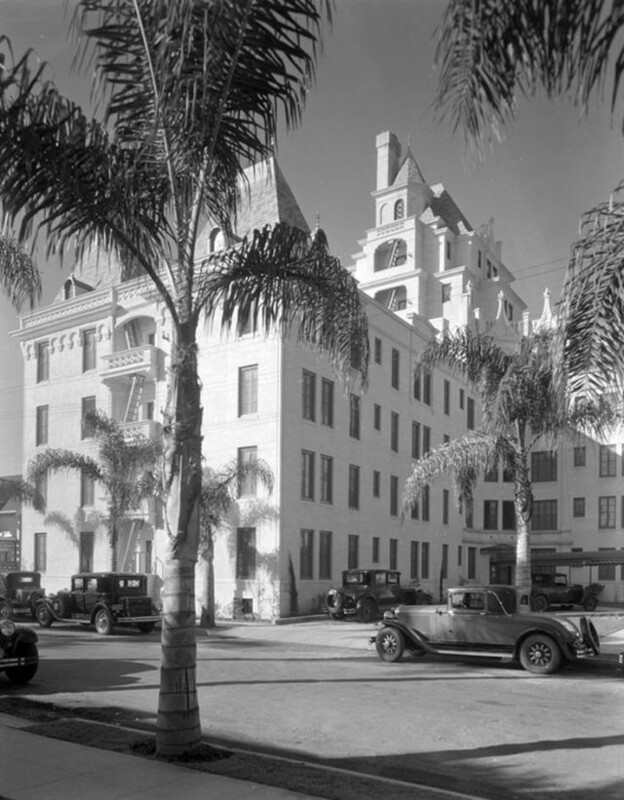 (1929)+^^ – View showing the La Belle Tour Apartments at 6200 Franklin Ave, Hollywood, shortly after it opened. 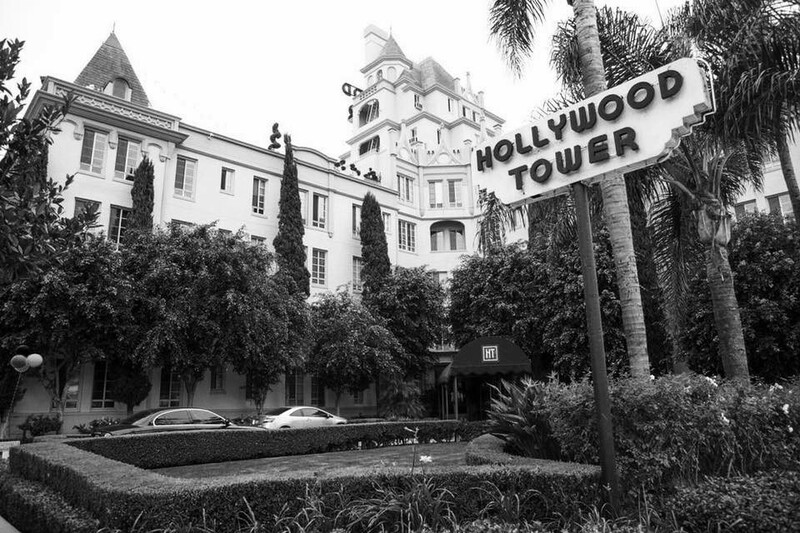 The Hollywood Tower, originally known as La Belle Tour, was designed by architects Cramer & Wise in a faux French Normandy style, and built in 1929. At the time, it was a Class A building with more than 50 apartments, with three penthouse units, a subterranean garage, and private and public roof gardens. 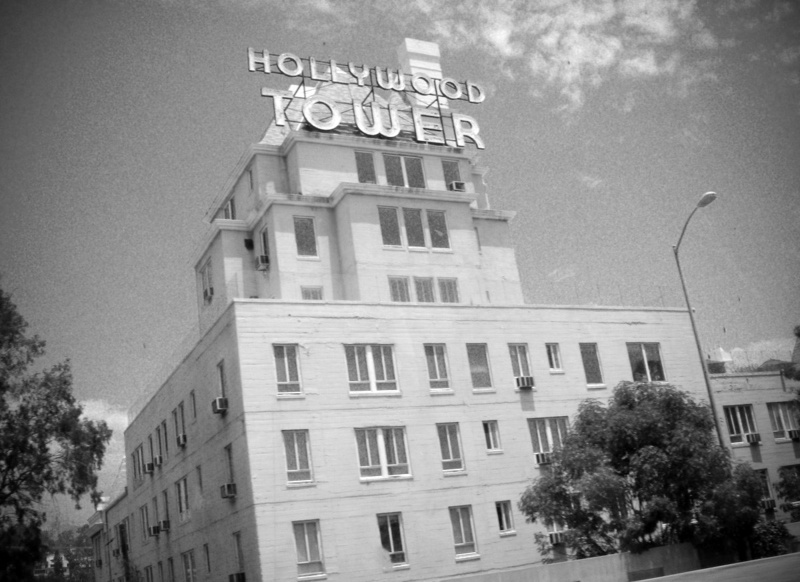 The building directly abuts the Hollywood Freeway (built in the 1950s), and its neon "HOLLYWOOD TOWER" sign looking directly over the northbound freeway is a Hollywood landmark. 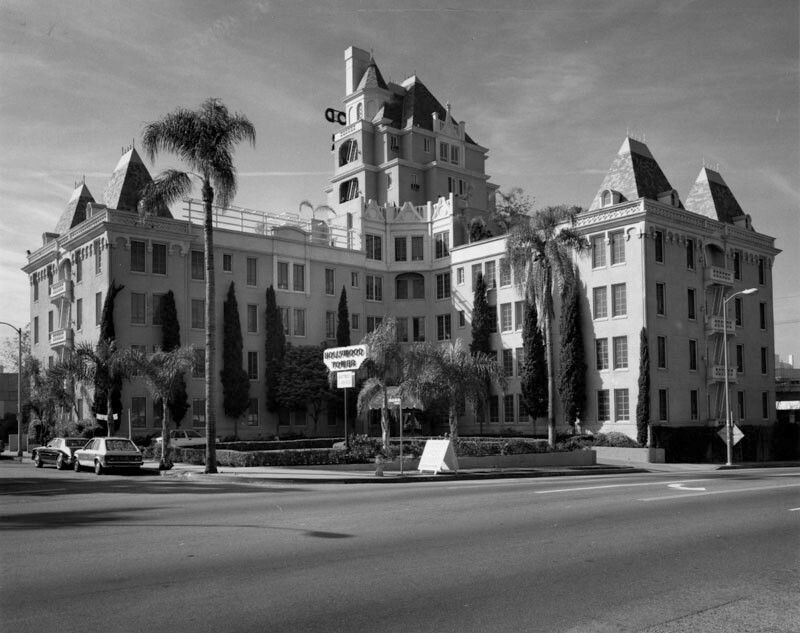 (1991)* - View looking at the southwest corner of Franklin and Vista Del Mar avenues showing the French style Hollywood Tower Apartments. 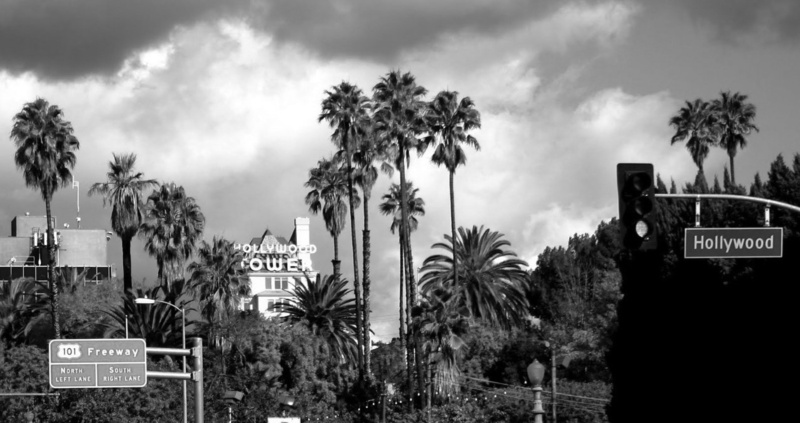 (2010s)^.^ – Closer view looking southeast from Franklin Ave showing the entrance to the Hollywood Tower. (2010s)++^ - View looking up at the Hollywood Tower's iconic sign as seen from the Hollywood Freeway. (2010)##^^^ – Panoramic view looking northwest showing the Hollywood Tower, appearing to be surrounded by palm trees with sign for the Hollywood Freeway on-ramp in lower-left. 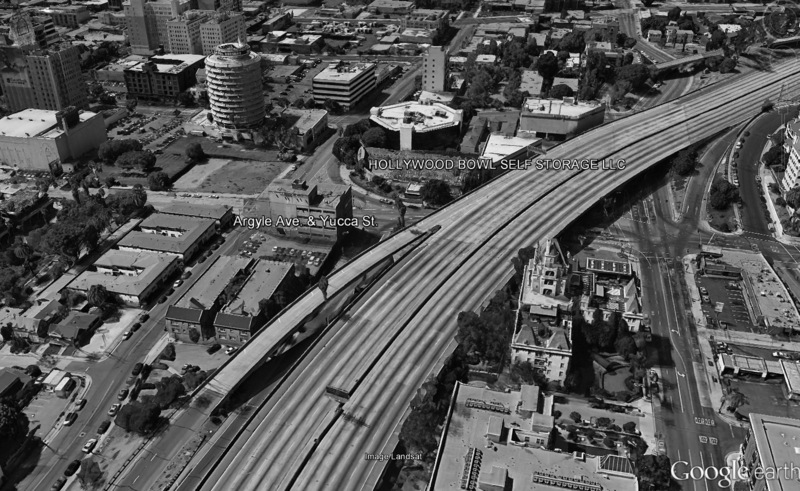 (2015)##^^^ - Google Earth view showing the Hollywood Tower (lower-right) standing tall adjacent to the Hollywood Freeway, with the Capitol Records Building (built in 1955-56) seen in the upper-left. 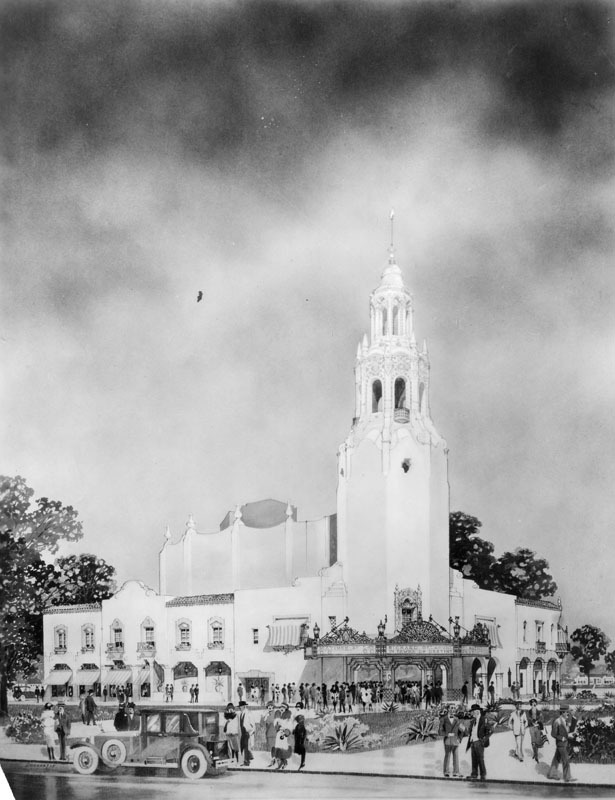 (1926)* - Artist's conception of the beautiful new Carthay Circle Theatre in Carthay Center in the heart of the exlusive Wilshire residential district of Los Angeles. 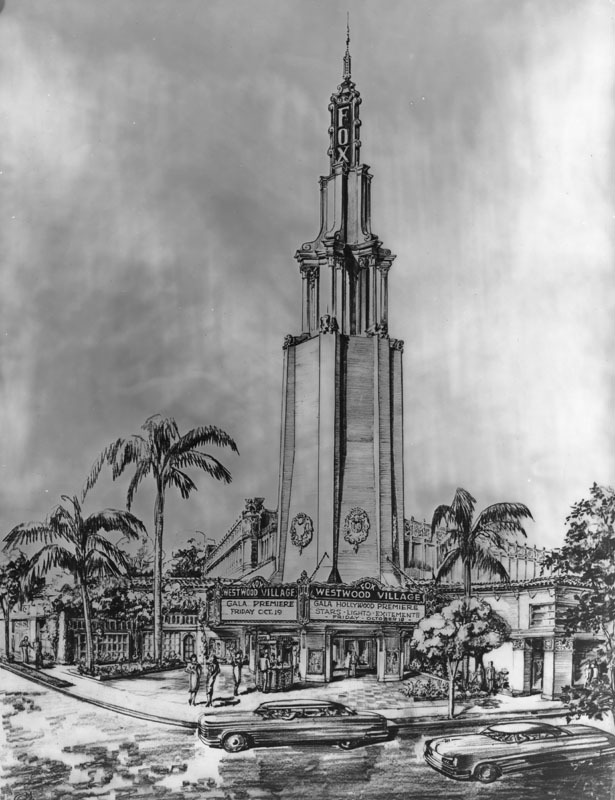 Architect Archibald Gibbs designed the 1926 Carthay Circle Theatre, located at 6316 San Vicente Boulevard, in the Spanish Colonial Revival Style with Streamline Moderne influences. 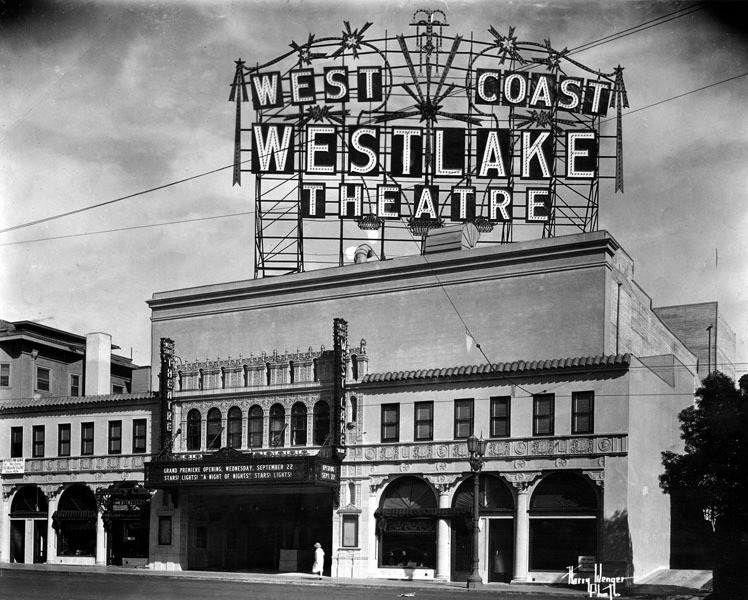 Fox-West Coast Theatres took over operation of the theatre in 1929. (ca. 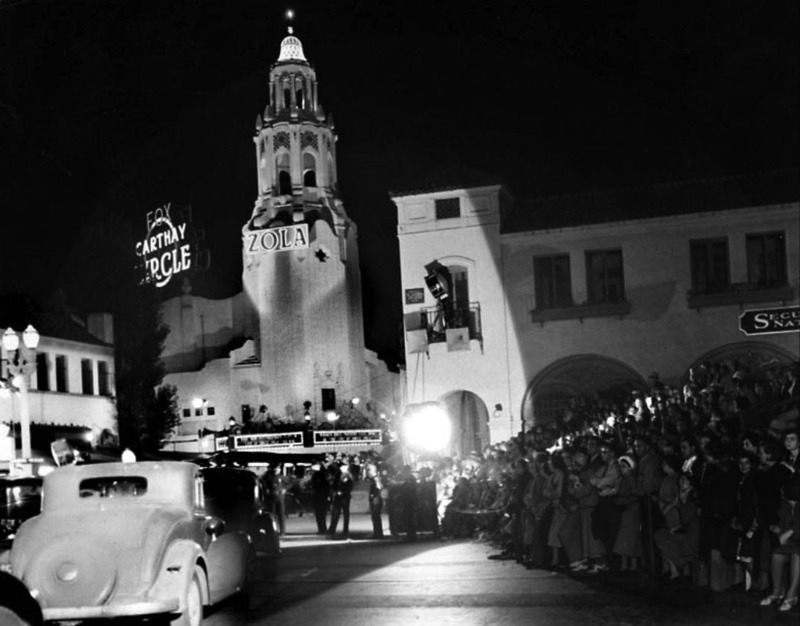 1930s)* - Premiere night at the Carthay Circle Theater located at 6316 San Vicente Boulevard. 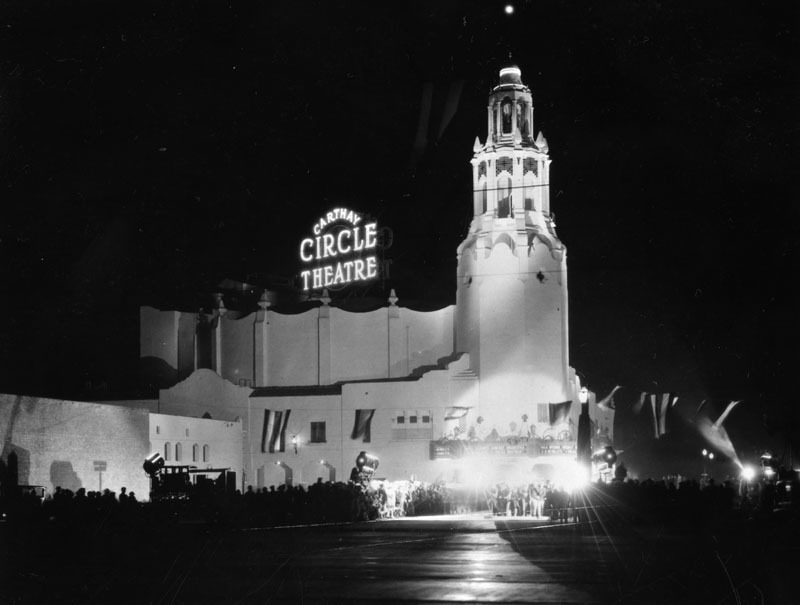 The Carthay Circle Theatre hosted the official premieres of some of the more notable films of the 1930s including: The Life of Emile Zola (1937), Romeo and Juliet (1936), Walt Disney's first animated feature length film Snow White and the Seven Dwarfs (1937) and Gone with the Wind (1939), among many others. (ca. 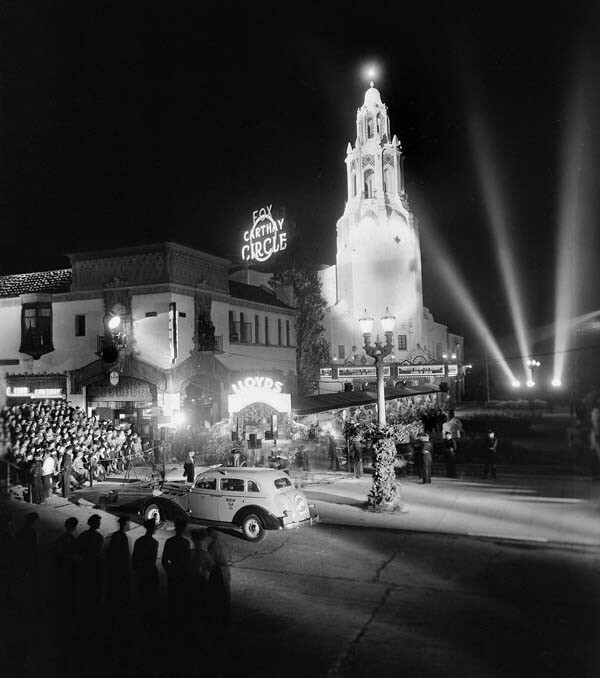 1937)^^ - Crowds are overflowing in the stands as celebrities pull up for the premier of "Wee Willie Winkie". 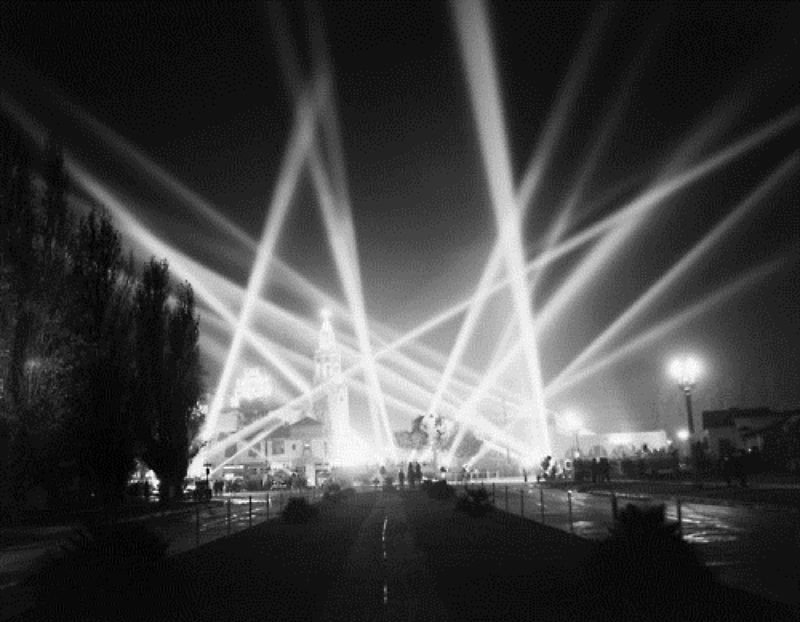 (1937)^x^ – Flood light illuminates the arrivals at premiere of “Snow White and the Seven Dwarfs”, December 21, 1937. “Snow White and the Seven Dwarfs” was laso known as “Disney’s Folly” because everyone thought Walt was mad for making a feature-length cartoon. 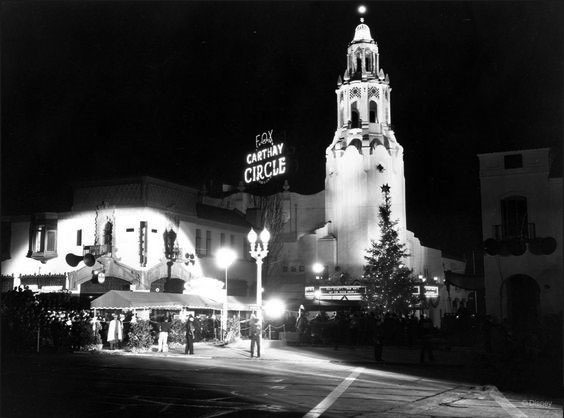 (1930s)*^*^* - Another premier night at the Carthay Circle Theater. Flood lights fill the sky. (1939)^.^ - Preparations for the December 28, 1939 west coast premiere of "Gone With the Wind." 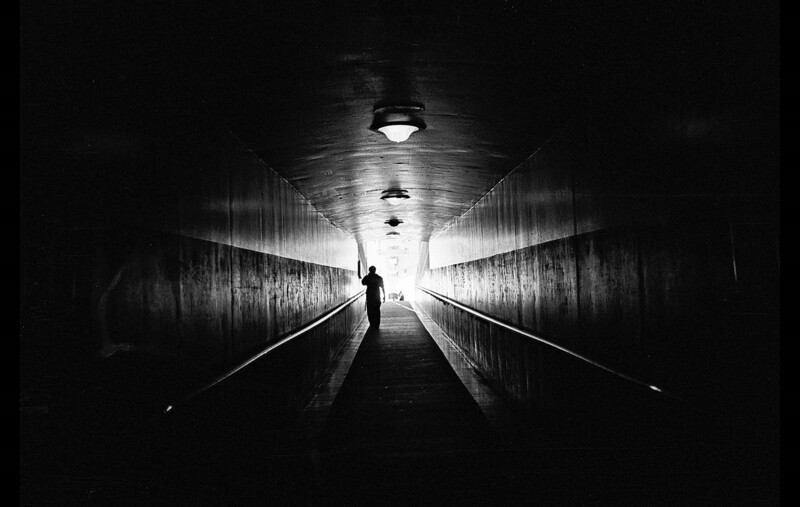 Photo by Virgil Morris. (ca. 1930)*# – View looking northeast on McCarthy Vista toward the Hollywood Hills as seen from the top of the Carthay Circle Theater. Wilshire Boulevard is two blocks away. Oil derricks can be seen in the distance (upper-right). San Vicente Boulevard runs from left to right in the foreground. 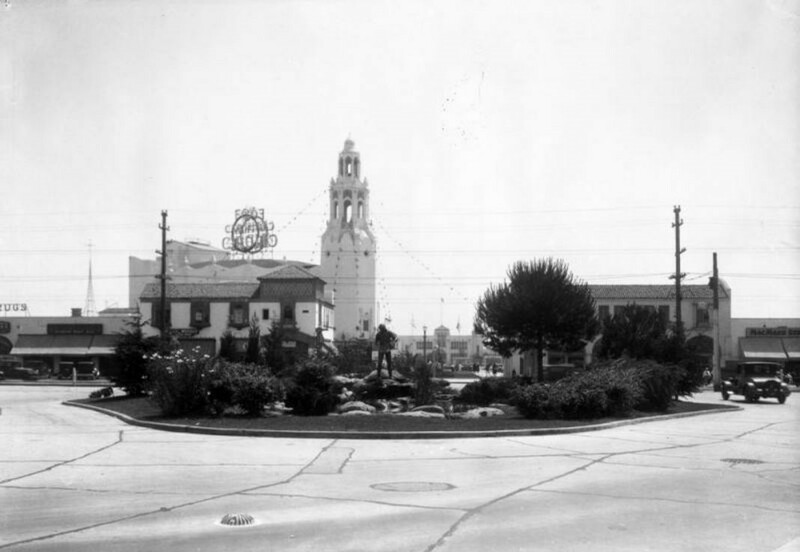 (1930)* - Looking south from McCarthy Vista towards Henry Lion's 'Pioneer Fountain Group' statue; just beyond it, across San Vicente Boulevard, is the Carthay Circle Theatre. 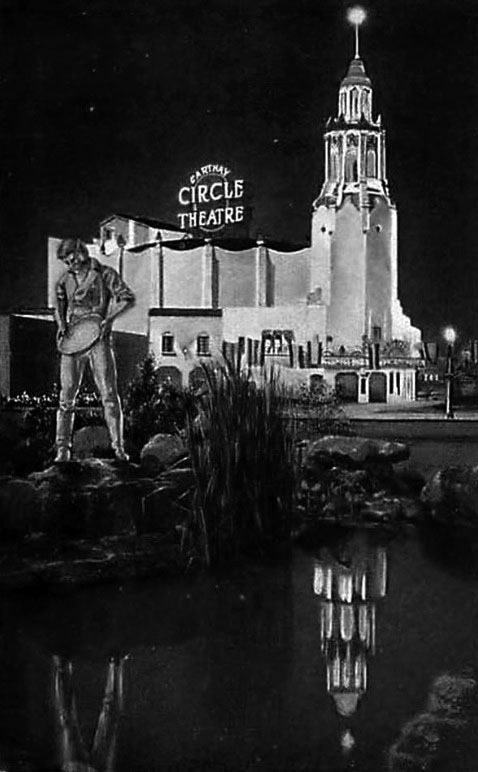 (1930s)^*^# - A postcard image of the Carthay Circle Theatre with Henry Lion's sculpture of a prospector in the foreground. (ca. 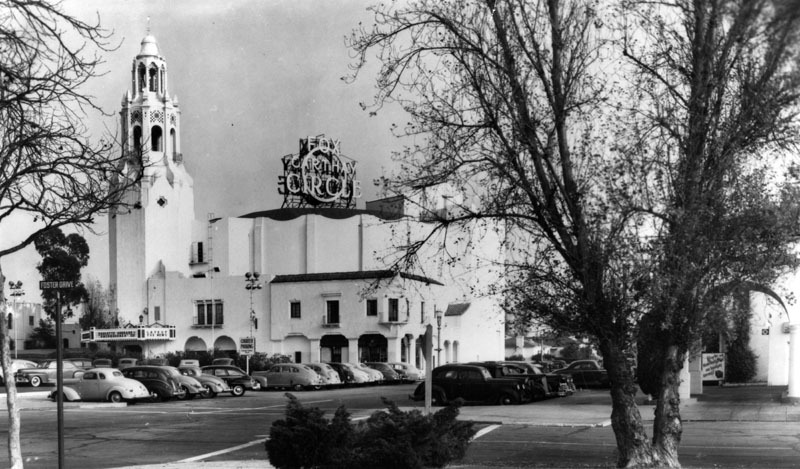 1939)* - Daylight view of Carthay Circle Theatre showing part of its front parking lot as seen from across the street. 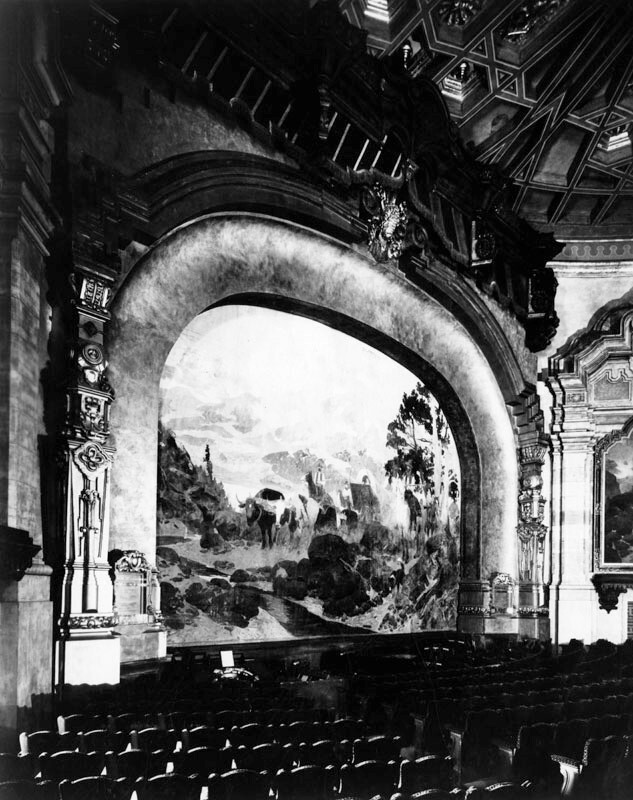 (1926)* - Proscenium of the Carthay Circle Theatre with asbestos down. 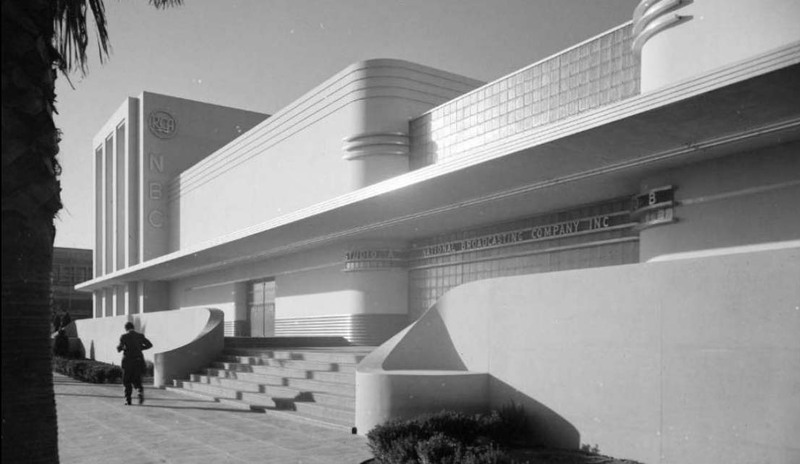 Architect Archibald Gibbs designed the theater in the Spanish Colonial Revival Style with Streamline Moderne influences. 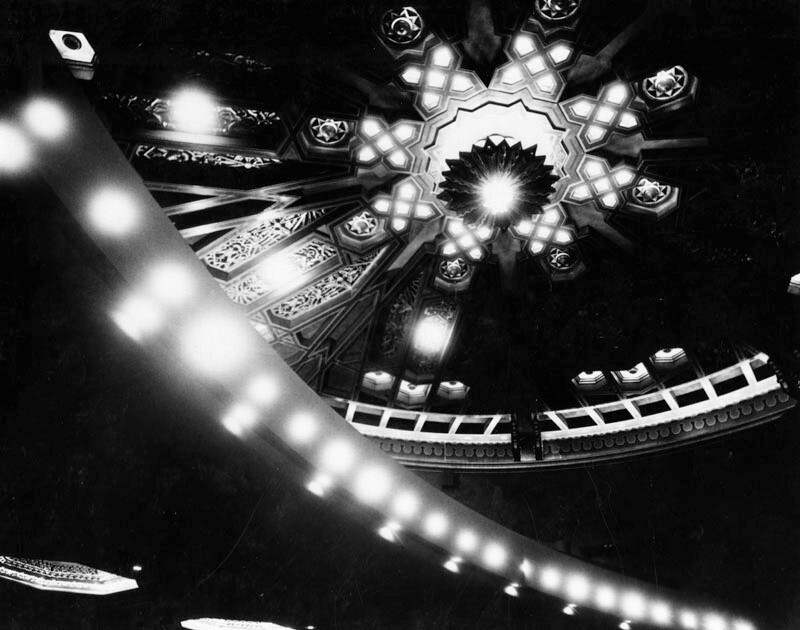 (n.d.)* - Auditorium ceiling partially lighted inside the Carthay Circle Theatre. (ca. 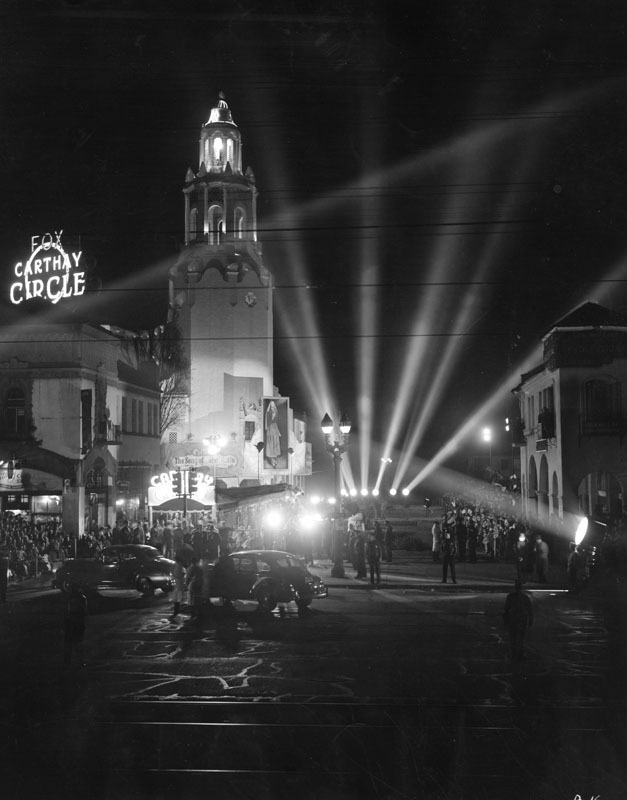 1939)^x^ - Postcard view showing a premiere night at Carthay Circle Theatre with premiere lights, cars and many people. 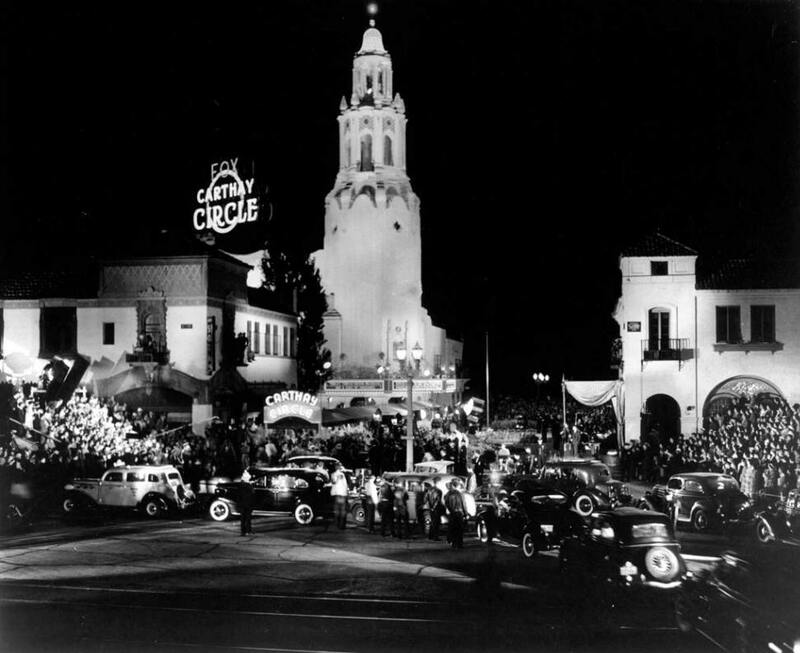 Carthay Circle Theatre, scene of many a gala Premiere, where throngs of movie fans collect to see the celebrities attending. 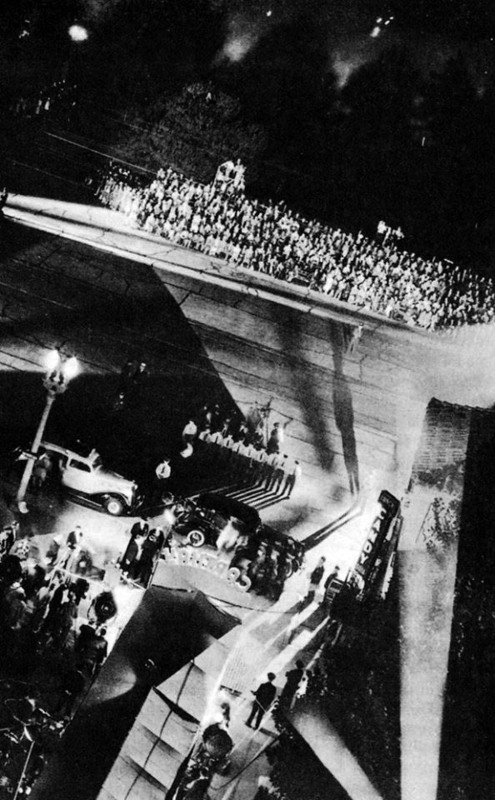 (1940)+^^ – Overhead view as seen from what appears to be the top of Carthay Circle’s tower showing hundreds of fans at the premier of “All This, and Heaven Too”. Note the long shadows. 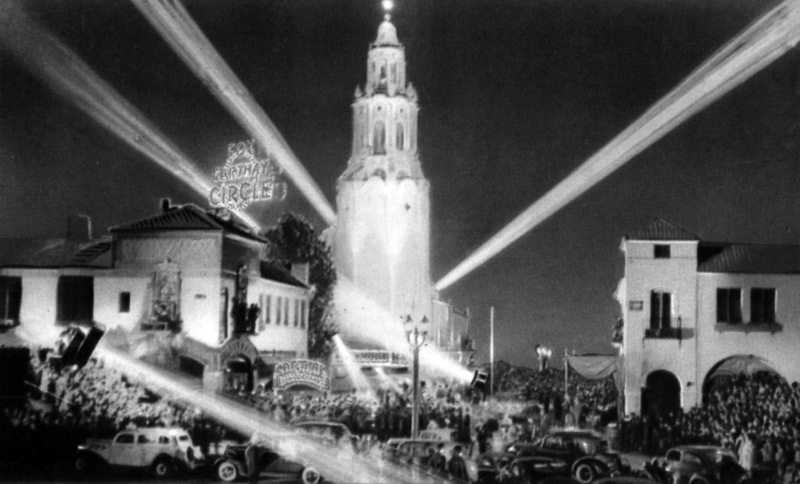 (1943)* - Huge arc lights flash against the dark background of the sky above the Carthay Circle Theater for the invitational preview of "The Song of Bernadette," 20th Century-Fox production. (ca. 1994)^.^ - View showing the Once Upon A Time merchandise shop, which is themed after Carthay Circle Theatre, located at Disney's Hollywood Studios at Walt Disney World in Florida. In July 1994, a smaller-scale pastiche of the facade of the theatre (primarily the octagonal tower) was opened as the "Once Upon a Time" gift shop on the Sunset Boulevard section in Disney's Hollywood Studios at Walt Disney World Resort in Florida. The store now sells clothing items for men and women. 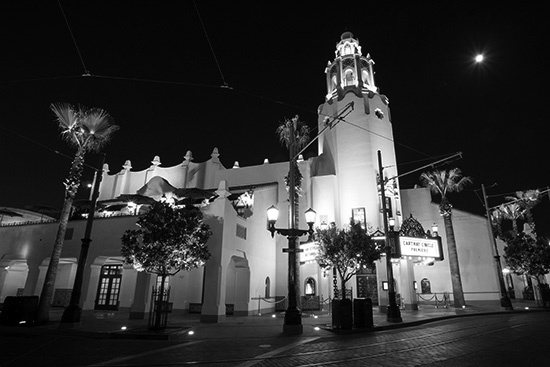 (2012)^.^ – View showing the Carthay Circle Restaurant and Lounge – a replica of the Carthay Circle Theatre located at Disney California Adventure Park in Anaheim. (2012)^.^ – Night view showing the Carthay Circle Restaurant and Lounge at Disney California Adventure Park – a replica of the Carthay Circle Theatre, where “Snow White and the Seven Dwarfs” premiered on December 21, 1937. 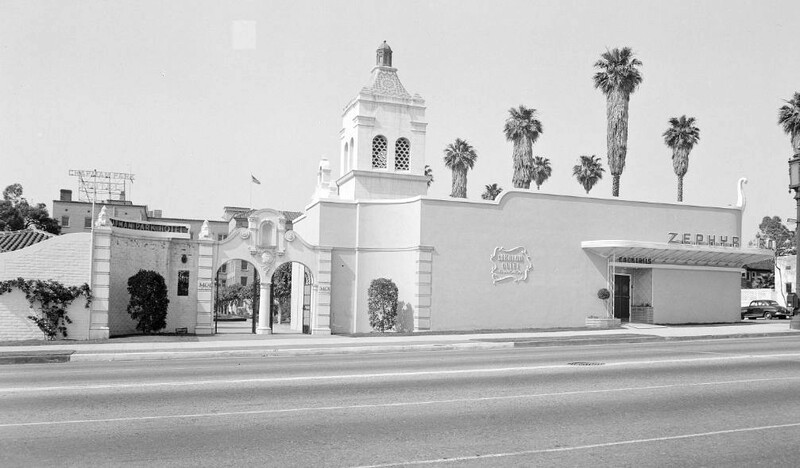 (1939)**# - Exterior view of the Academy Theatre at 3141 West Manchester Boulevard, Inglewood. 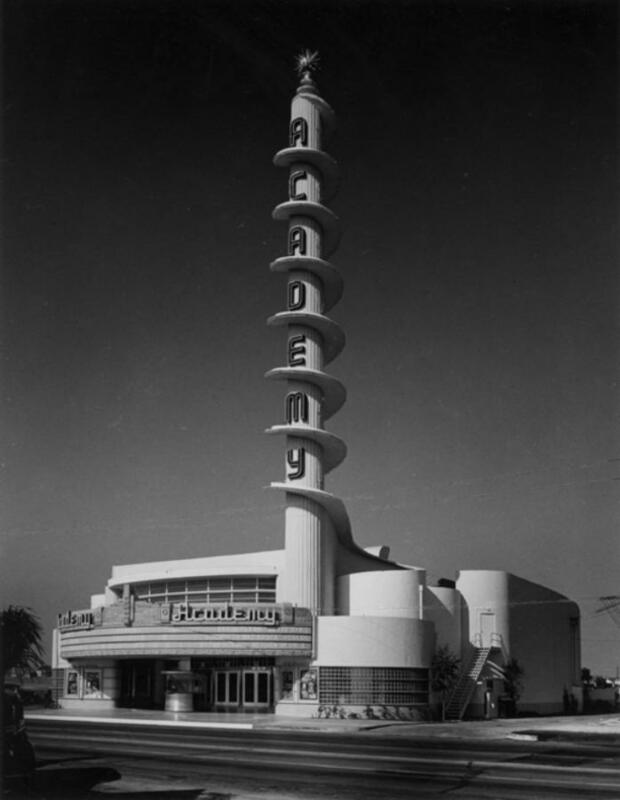 (1939)**# - Academy Theatre, Inglewood. Art Moderne design ticket booth and entry doors. 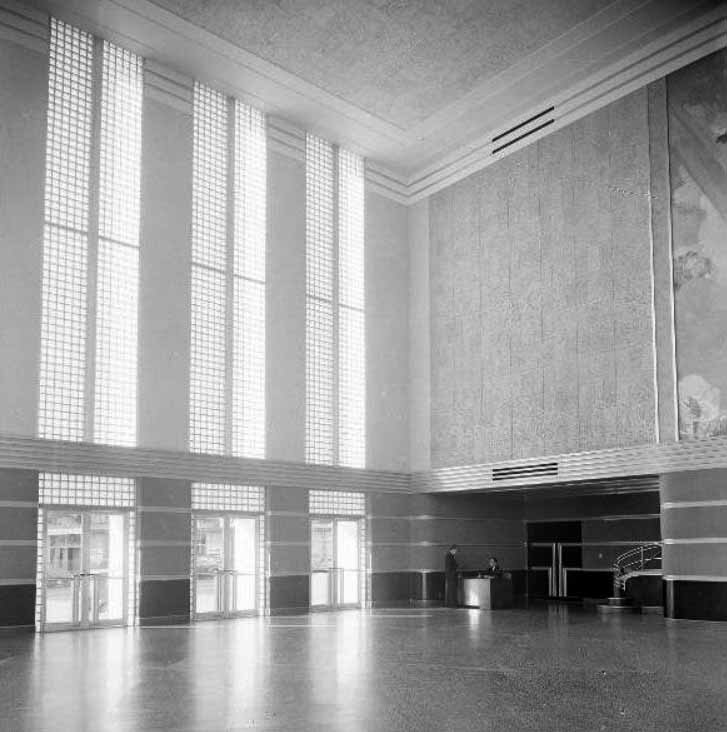 Architect S. Charles Lee was an early proponent of Art Deco and Moderne style theaters. 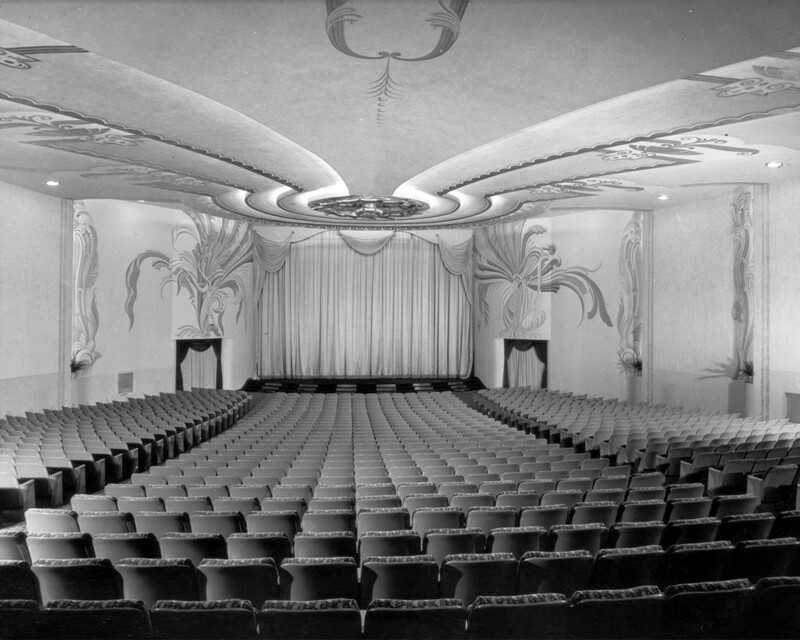 The Bruin Theater (1937) and Academy Theatre (1939) are among his most characteristic. The latter, located in Inglewood, California, is a prime example of Lee's successful response to the automobile. (1940)*++ – Interior view of the Academy Theatre as seen from the rear. 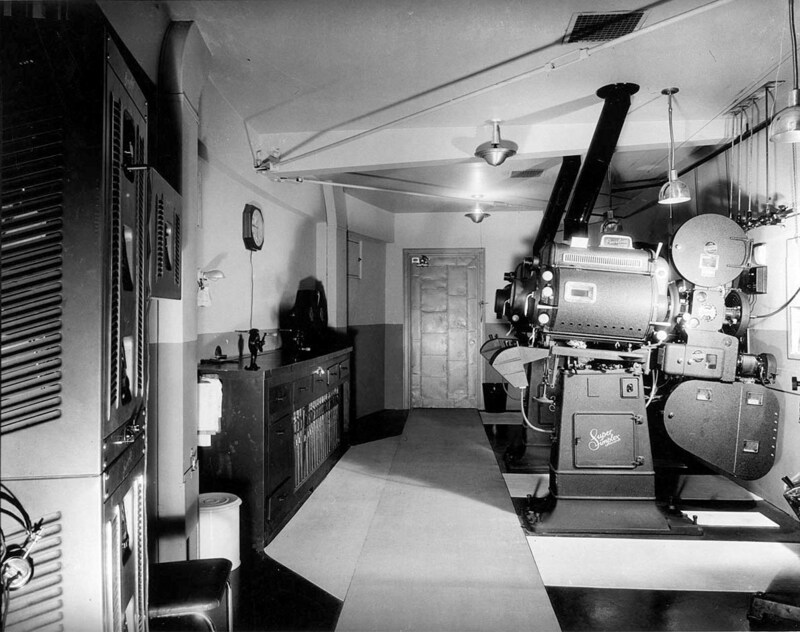 (1940)*++ – View showing the projection room at the Academy Theatre. The Academy Theatre is noted for a streamlined aesthetic, circular forms and glass block. The exterior naming spire, is circled by a helical light illuminating the ‘Academy’ name. 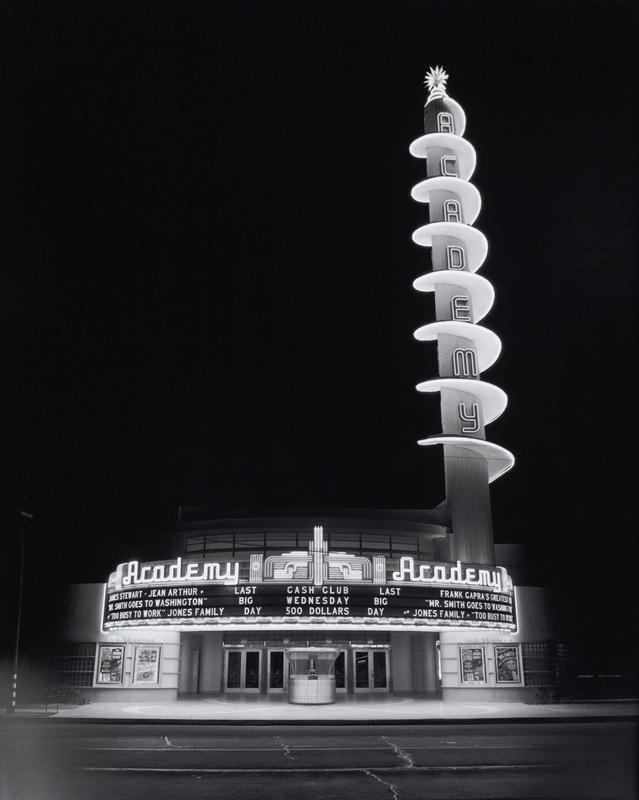 (1939)**# - Night view of the Academy Award Theatre in Inglewood. 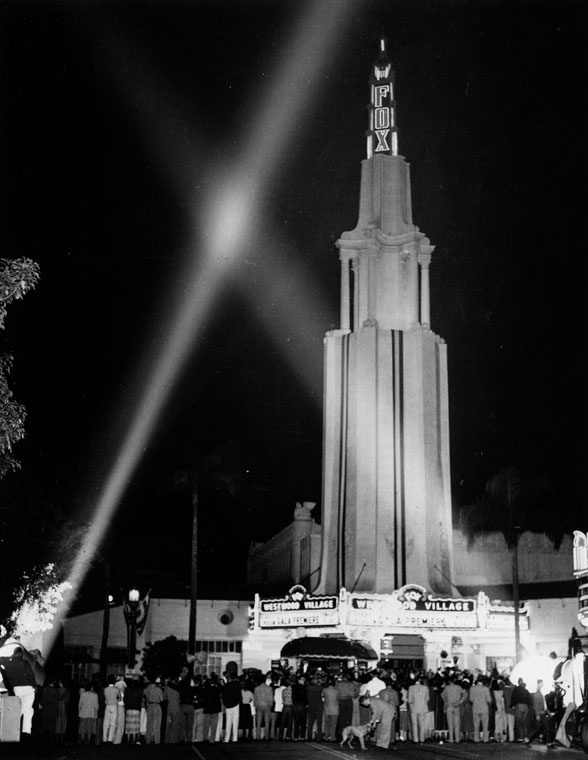 The tower is illuminated to draw customers into the theatre. The indirect illumination of the pylon creates a glowing tower that can be seen from afar. Glass block walls make the building glow from within. (n.d.)***^ - Night view of the front of the Academy Theater. The double header billing reads: James Stewart and Jean Arthur in "Mr. Smith Goes to Washington". Also, "To Busy to Work" - Jones Family. ^^^*Flickr.com - Debit72: Staples Center; Jerical Cat: Mullen Bluett Bldg. *^#*Franklinavenue.blogspot.com: Mullen and Bluett Bldg.